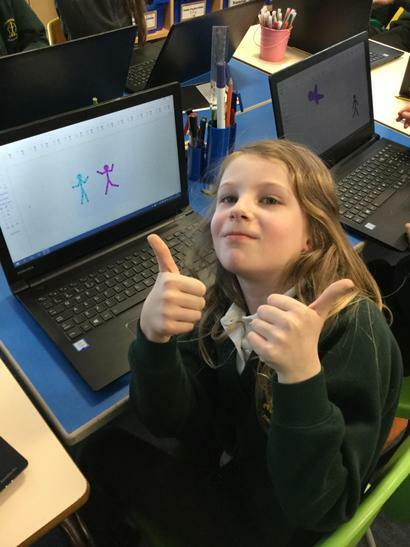 Accepting: Accepting emails, messages, or opening files, images or texts from people you don't know or trust can lead to problems — they may contain viruses or nasty messages! 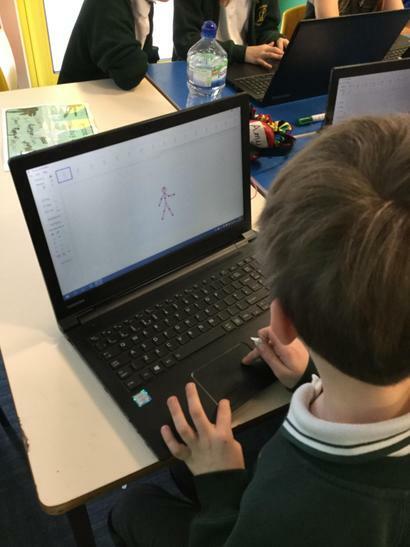 Reliable: Someone online might lie about who they are and information on the internet may not be true. 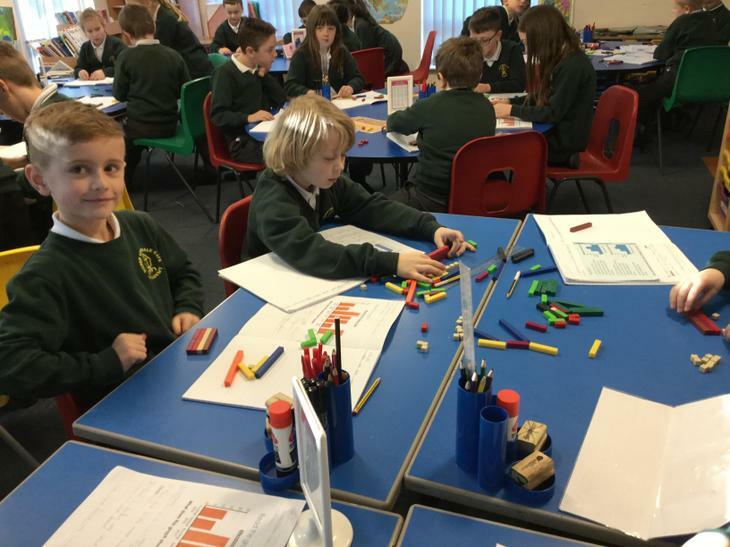 Happy New Year Year 4 Class! 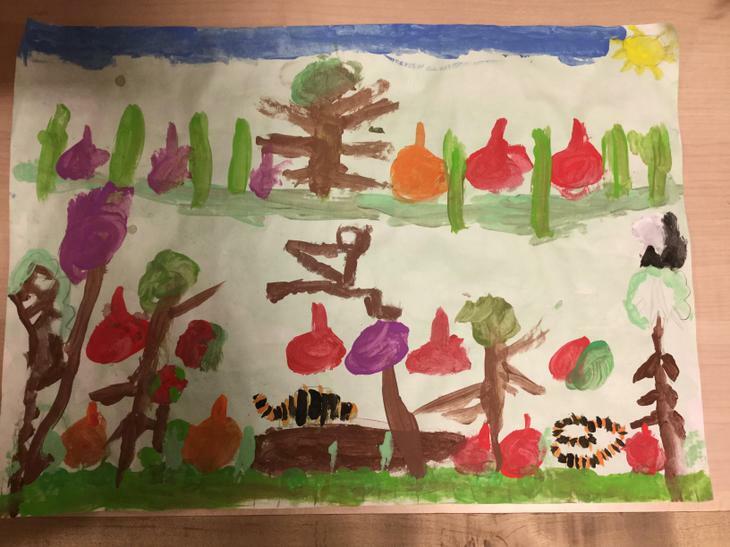 May we take this opportunity to wish you all a very happy and healthy 2019. 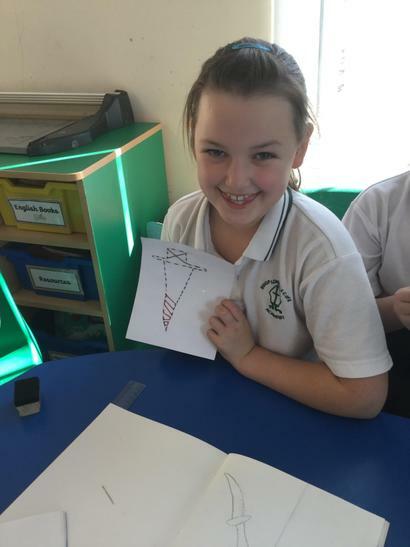 We hope you have all had a wonderful Christmas. 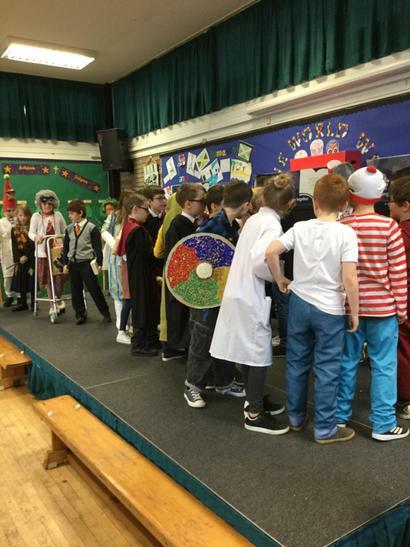 Thank you all for your Christmas wishes and gifts - it was very kind of you. 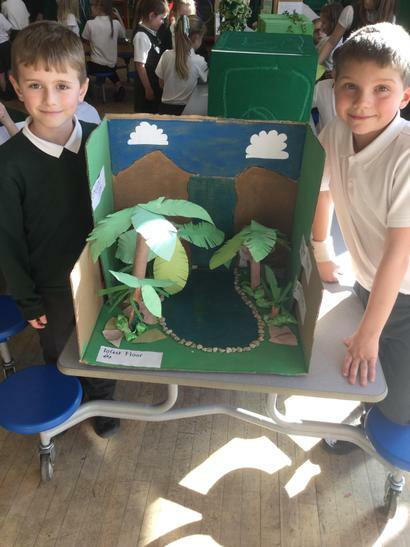 We are very excited to be starting our Rainforest topic . 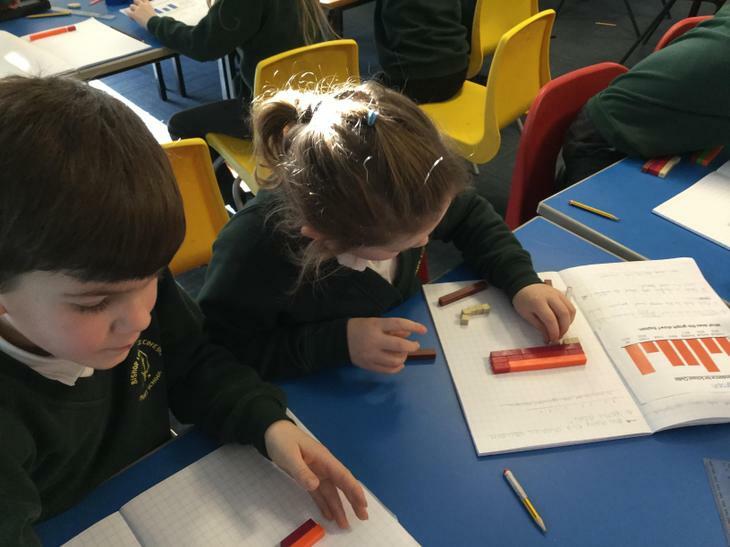 During the course of the week your children will continue to be taught by both of us. 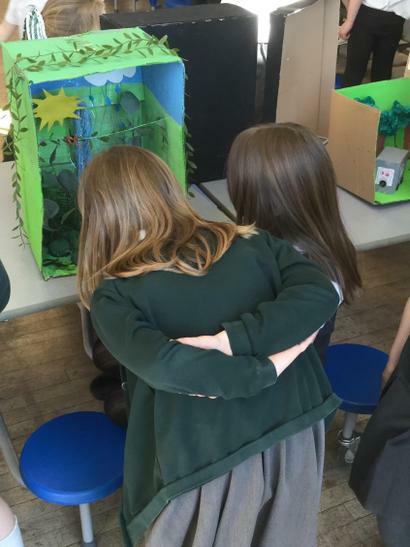 We are working very hard to ensure that the transition between us is seamless. 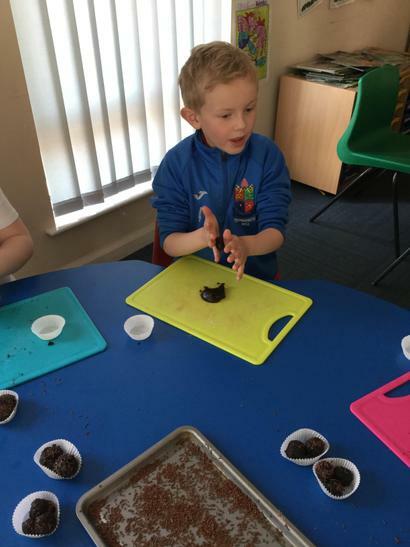 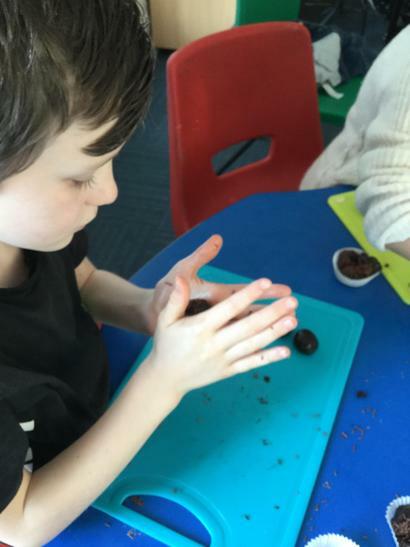 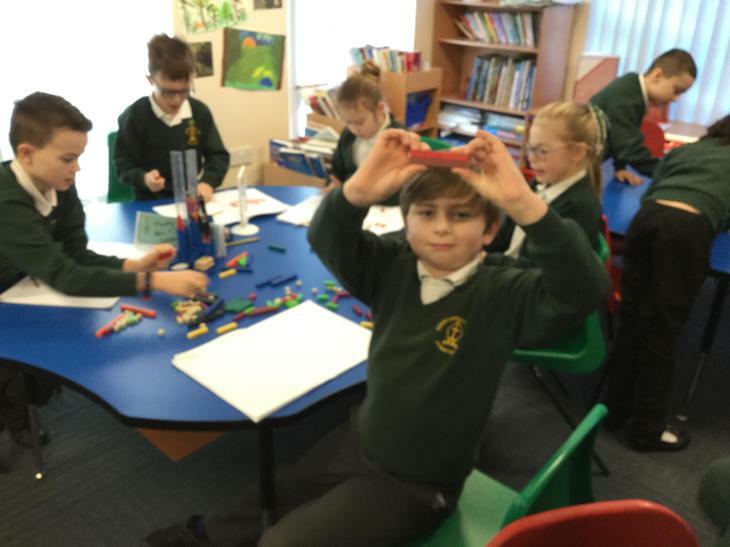 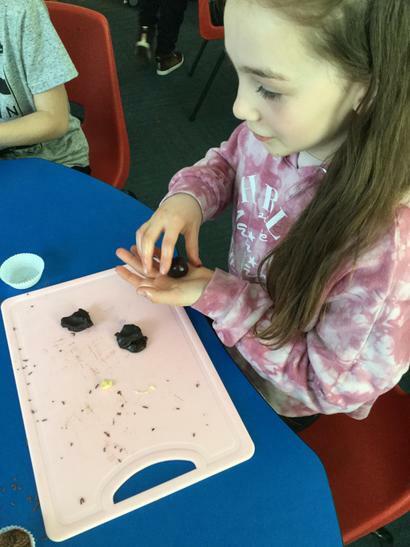 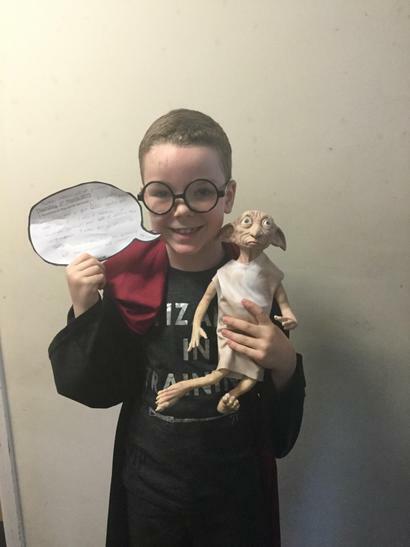 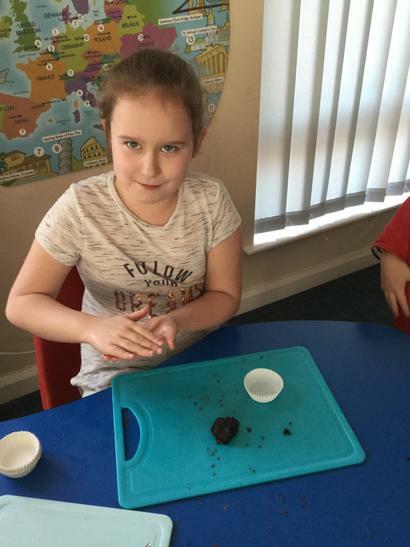 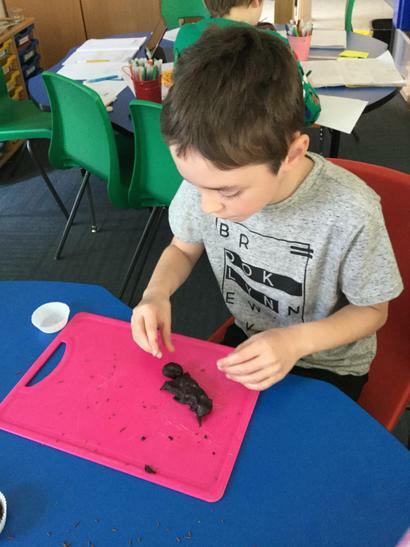 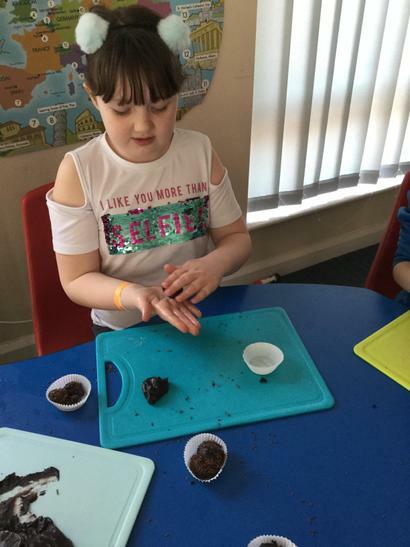 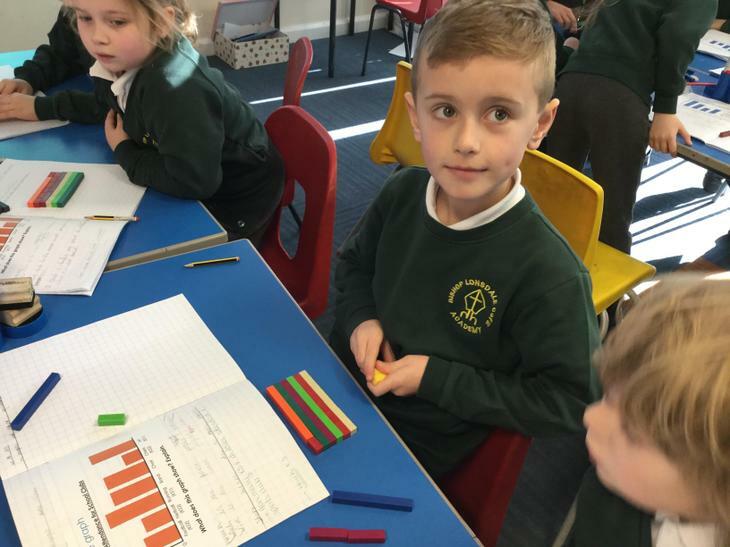 Our continued shared high expectations of your children in terms of behaviour and readiness for learning have been and will continued to be shared with the children. 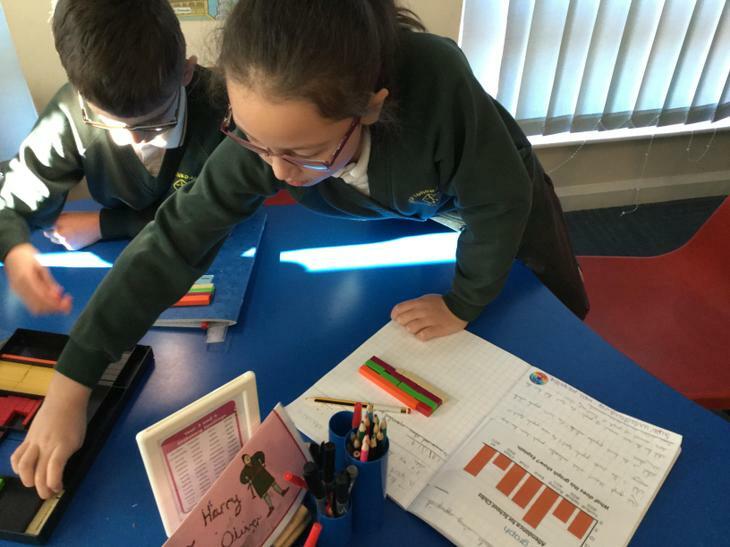 Mrs Jackson our Music expert will also be delivering Music lessons on a Wednesday morning. 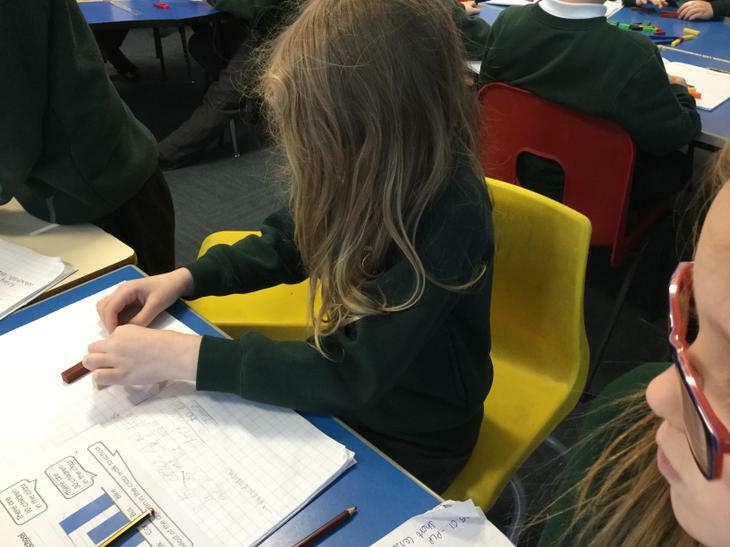 Homework will be given out on a Friday and will alternate between English and Maths. 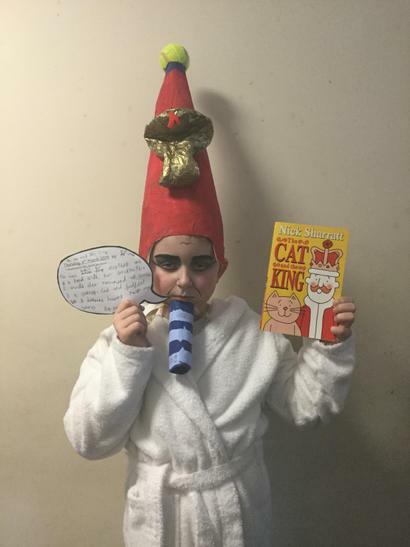 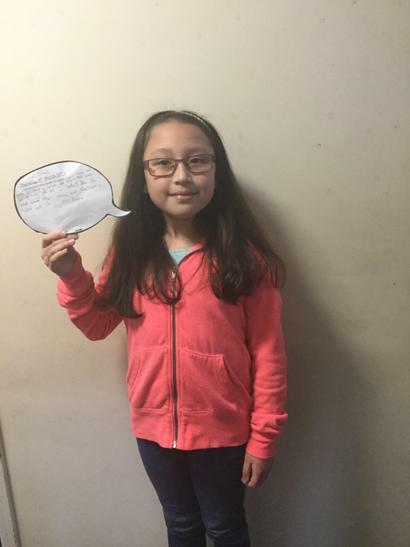 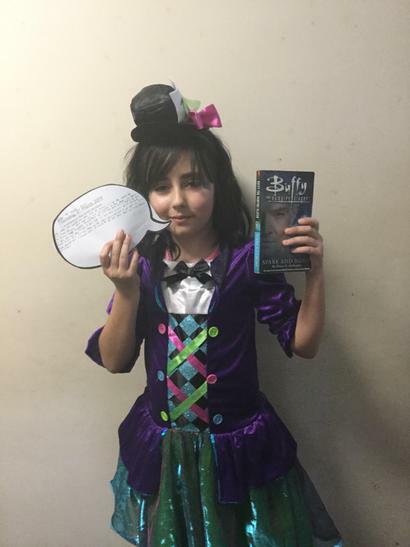 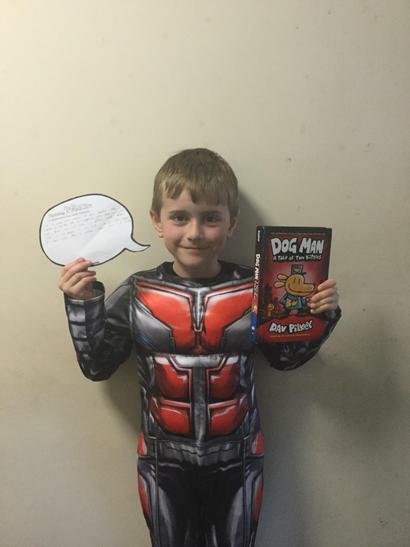 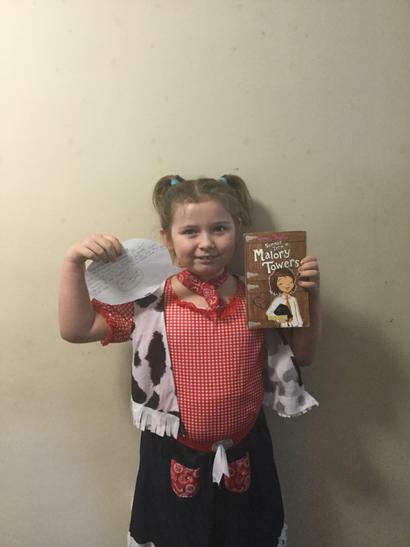 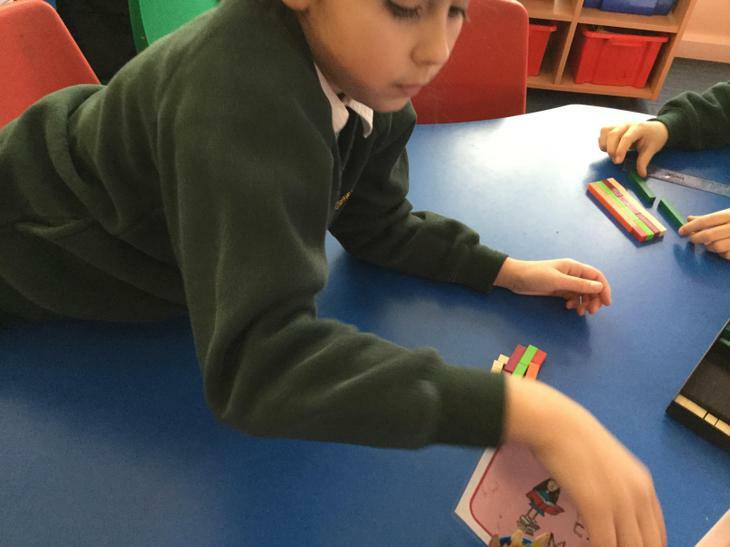 The children will be provided with homework books and we will indicate which page/s need to be completed each week. 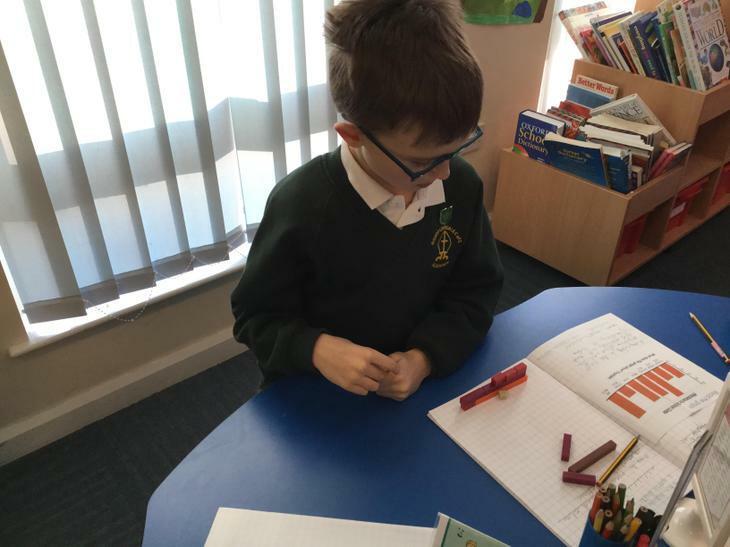 Homework should be returned and completed by Wednesday. 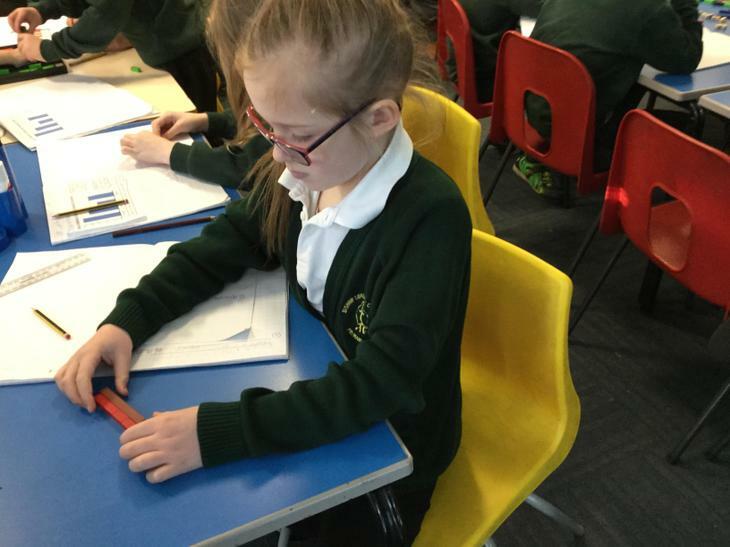 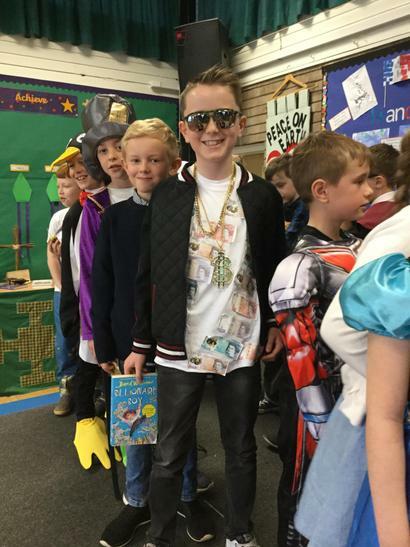 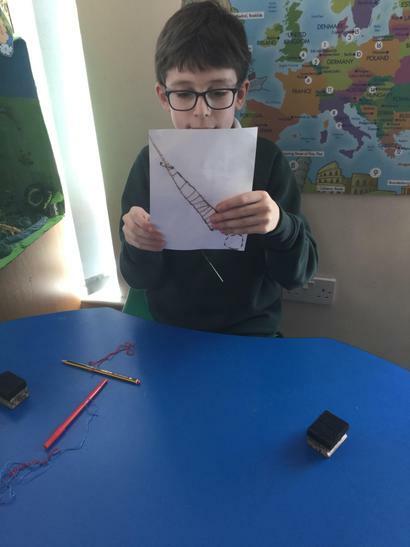 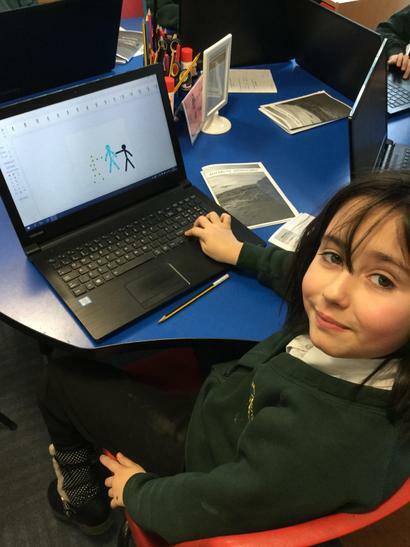 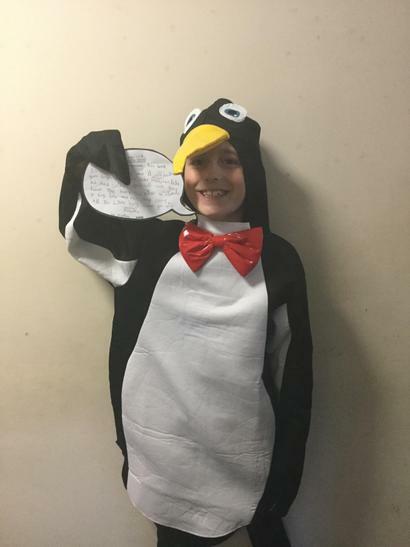 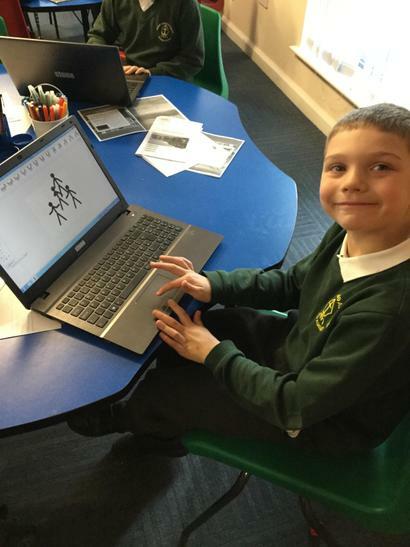 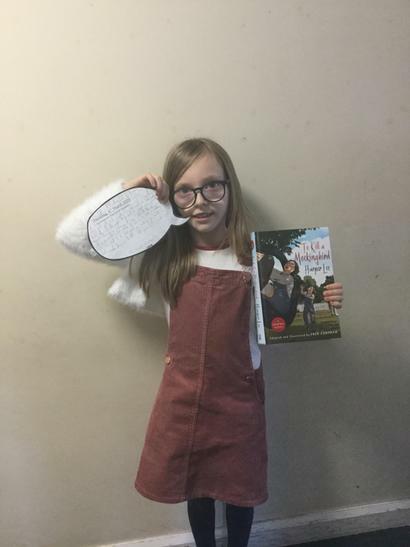 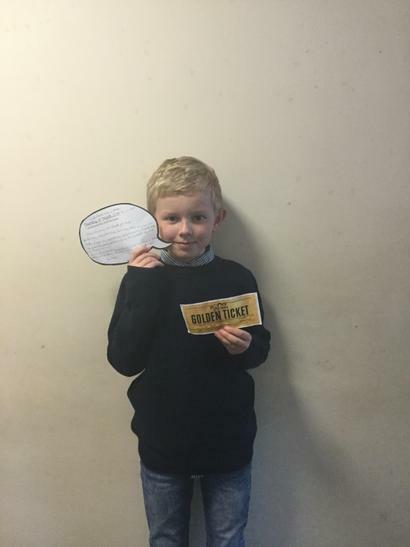 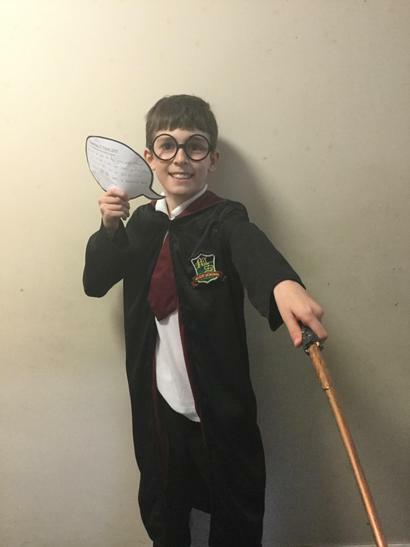 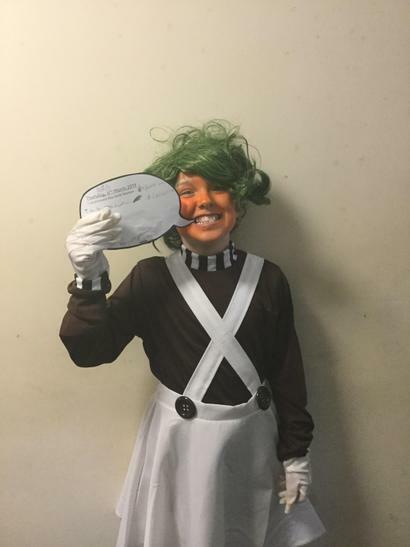 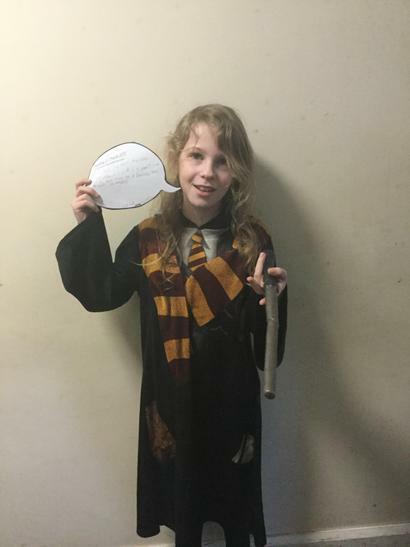 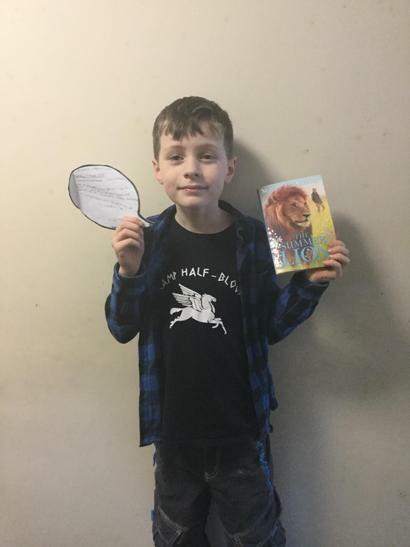 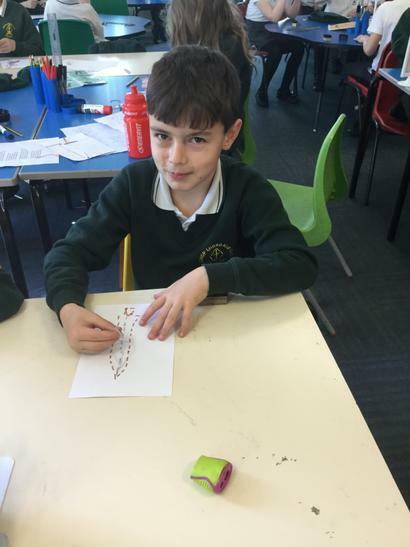 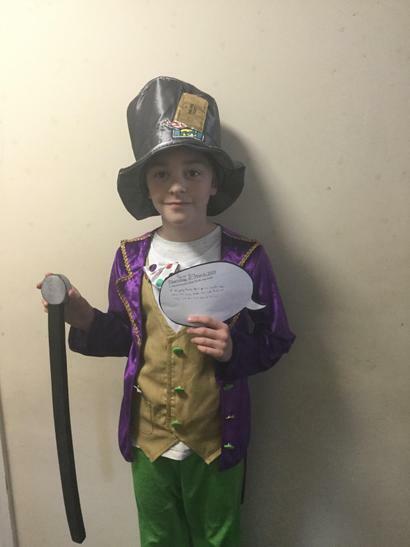 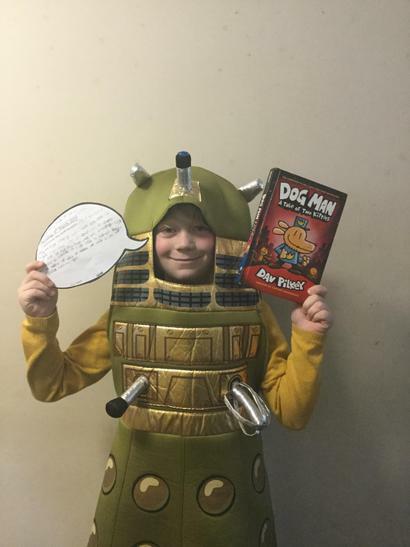 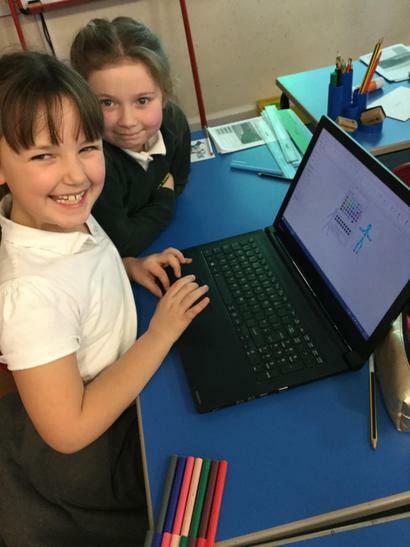 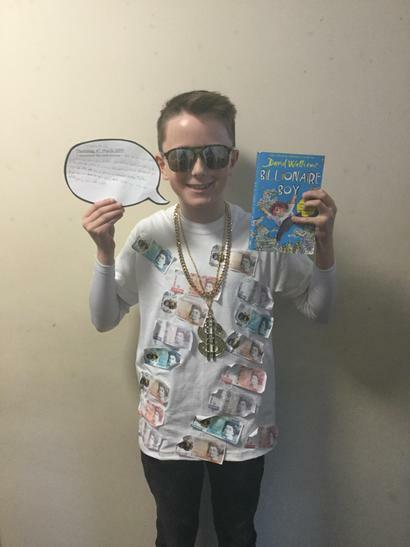 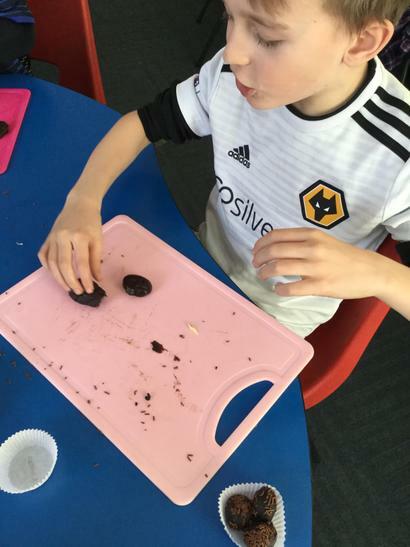 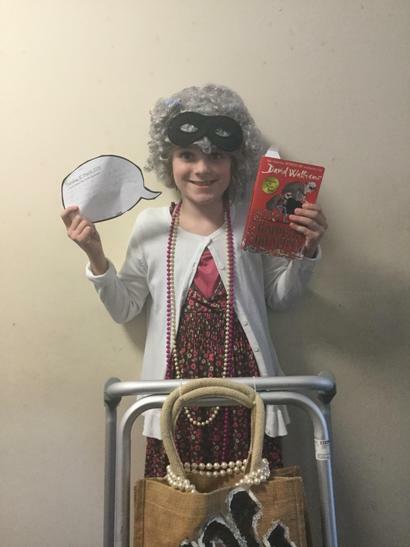 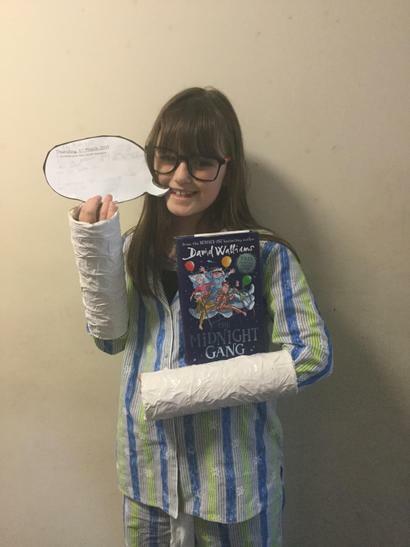 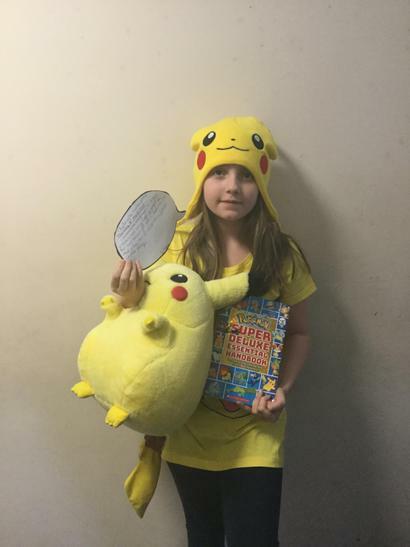 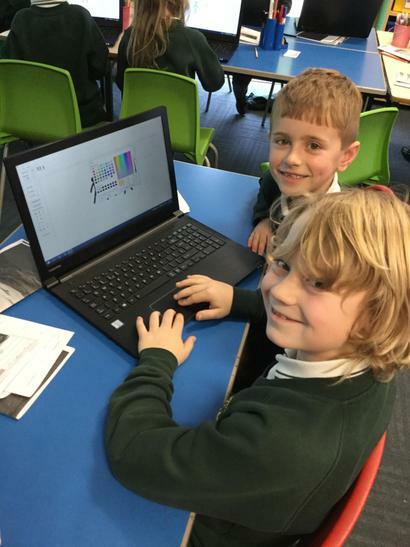 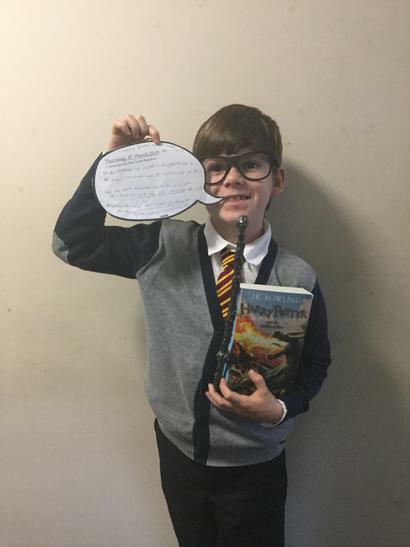 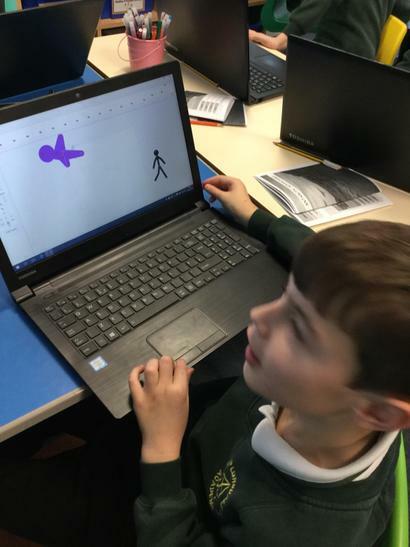 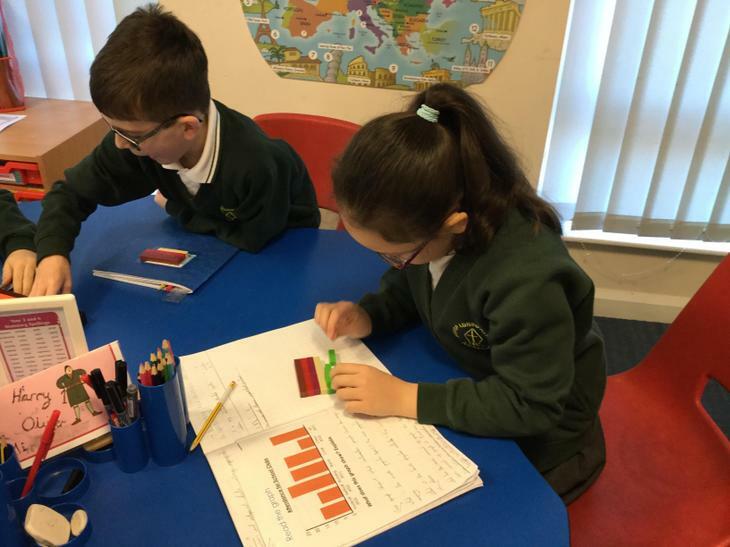 It is important that children are responsible for completing their homework and, as a school, it has been agreed that if it has not been completed that children will be allocated time to complete this during Golden Reward Time on a Friday afternoon. 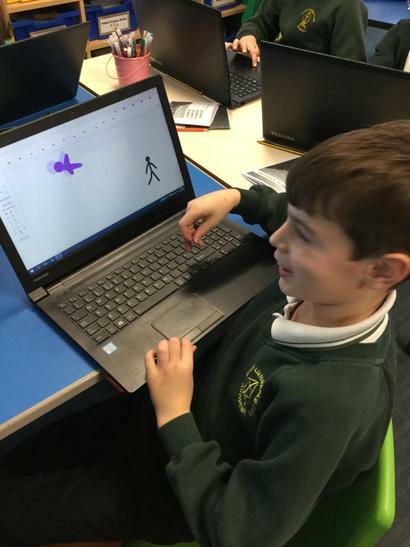 In addition to this, we will be setting a project based homework during the course of the term; more information will follow. 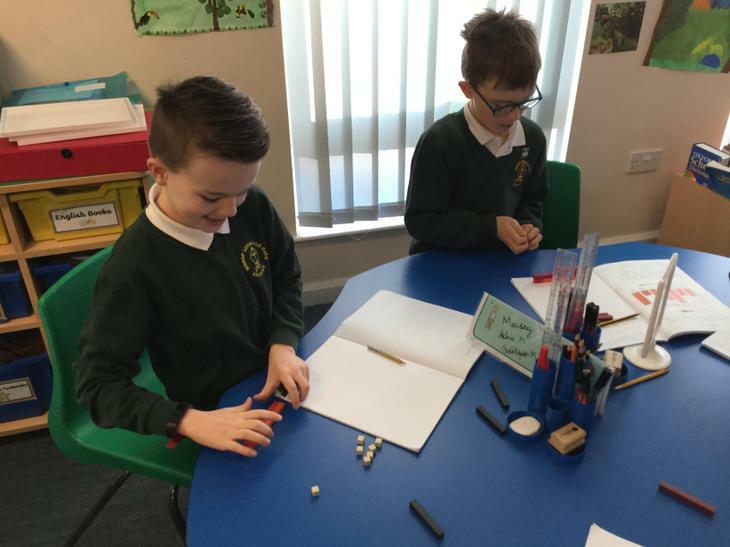 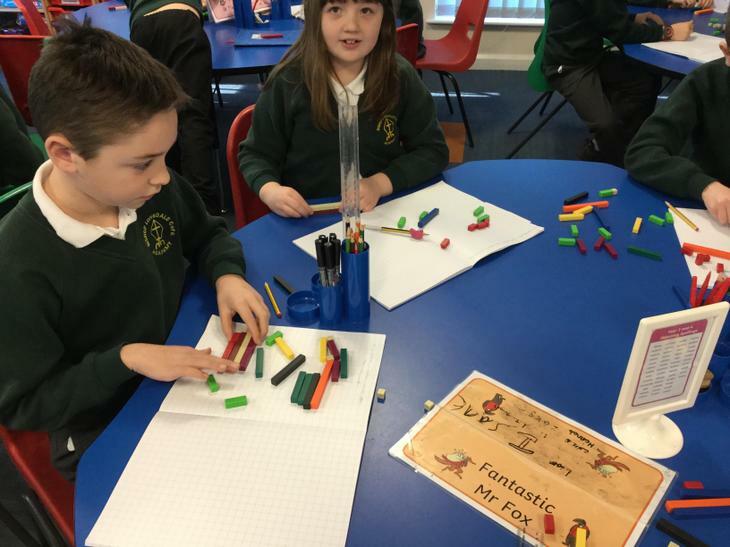 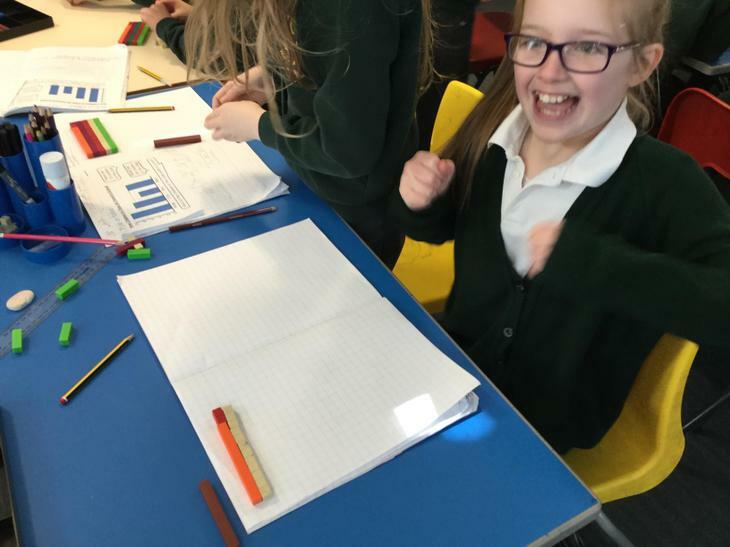 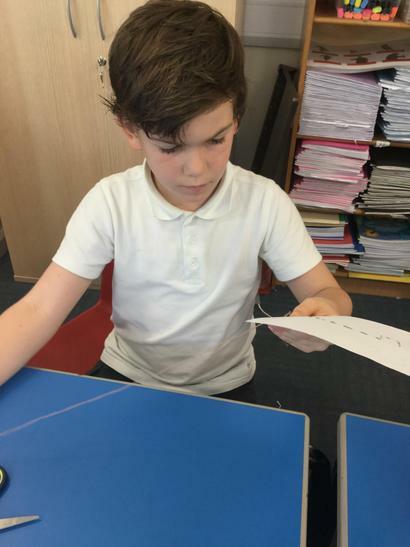 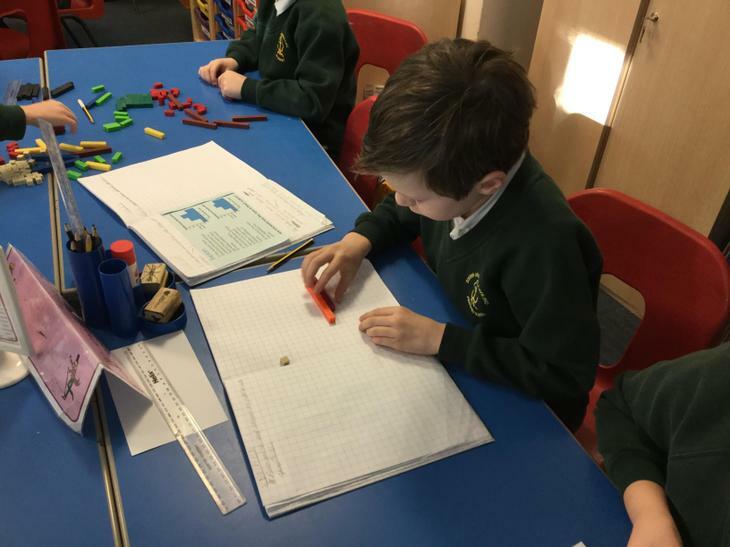 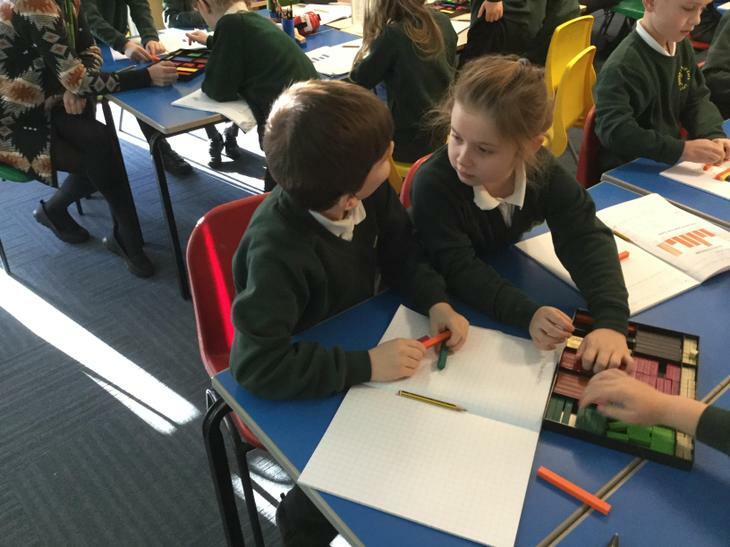 Finally, the children have already shown great passion this year to become confident mathematicians with their multiplication facts. 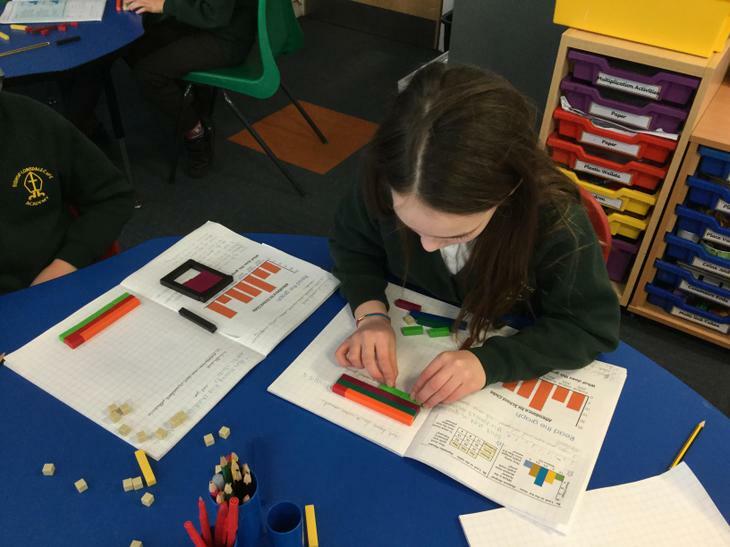 At the end of this academic year the children will be assessed on their knowledge of all multiplication and division facts up to 12 x 12. 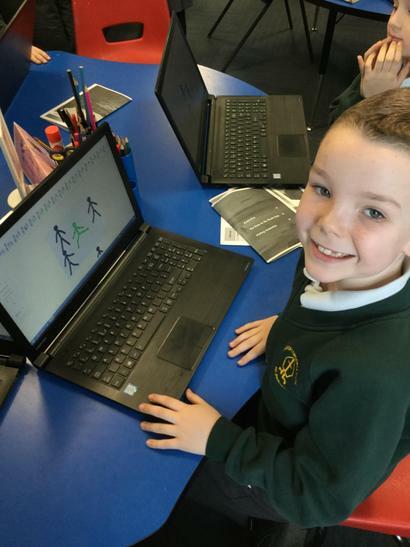 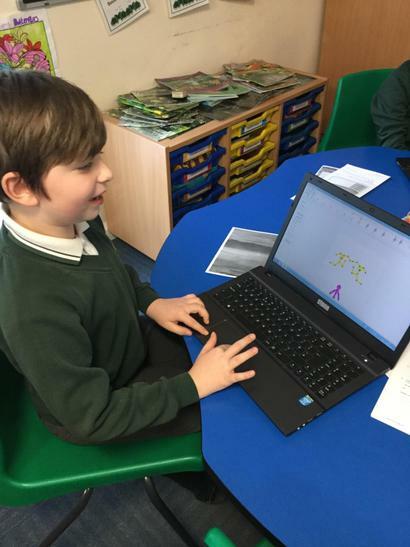 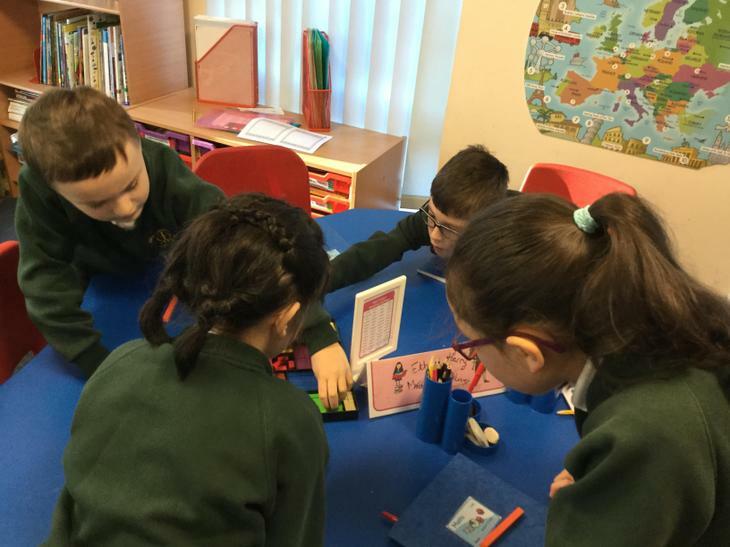 Last year the children were introduced to ‘TT Rockstars’ and next week we will recap with the children how to login to play the multiplication-based games at home. 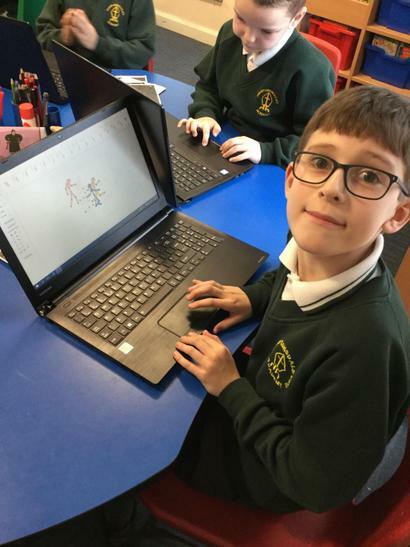 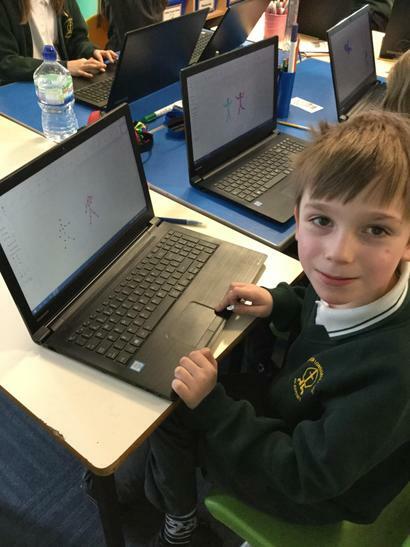 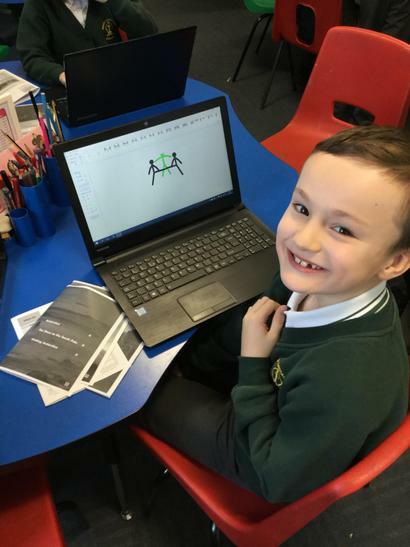 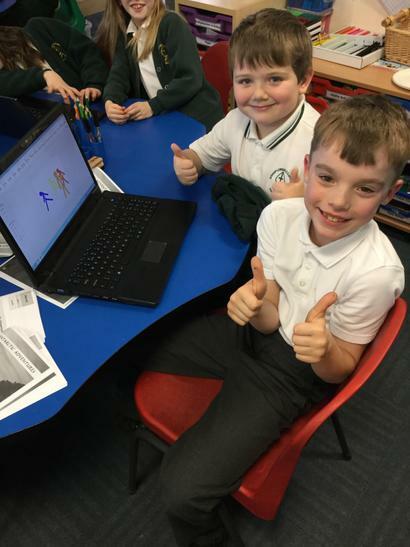 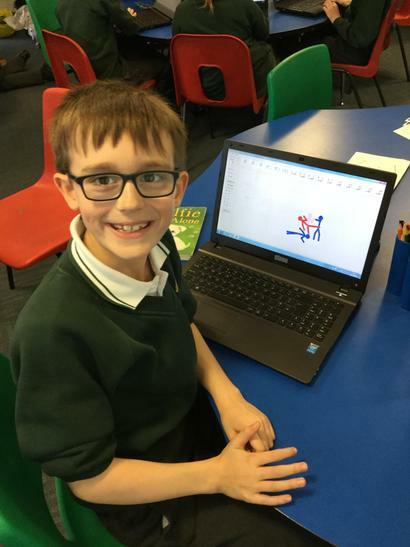 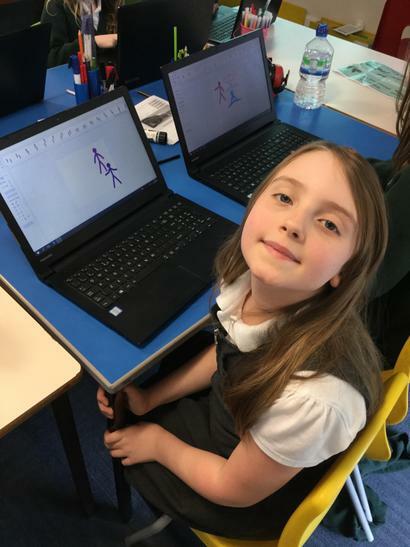 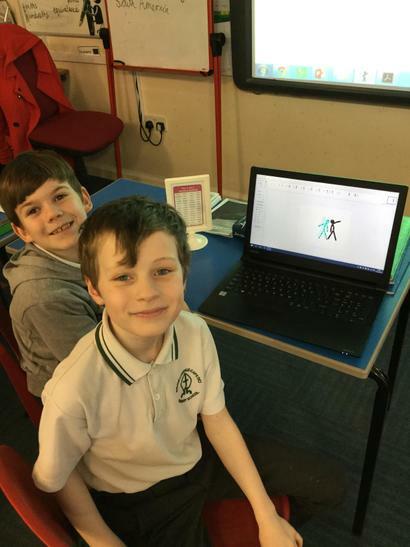 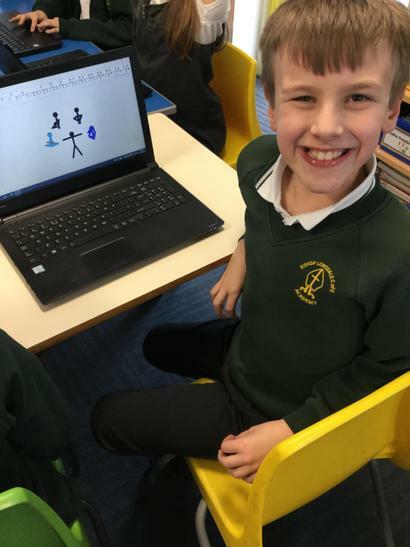 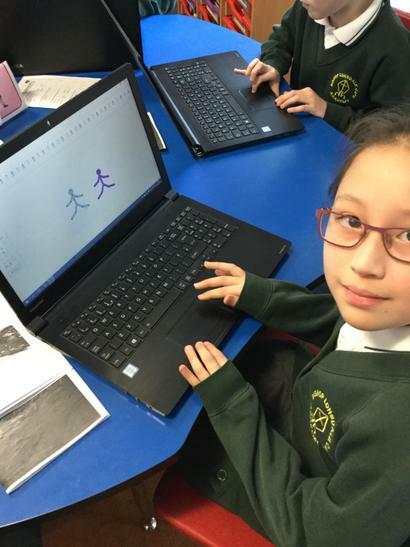 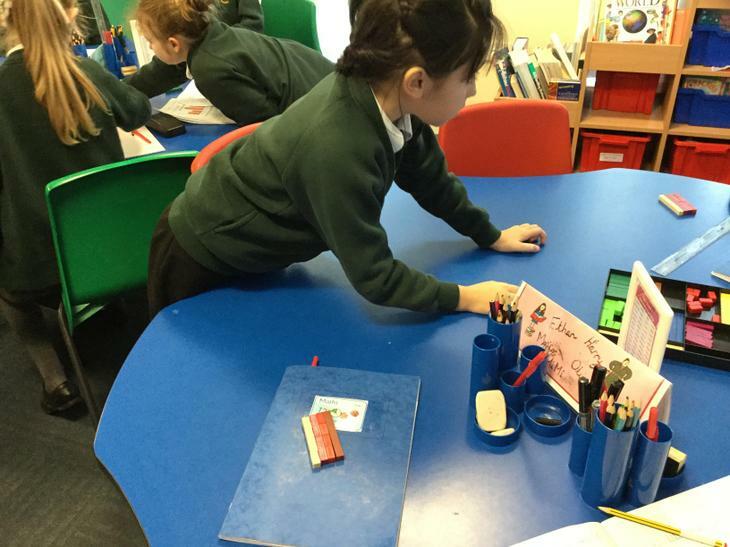 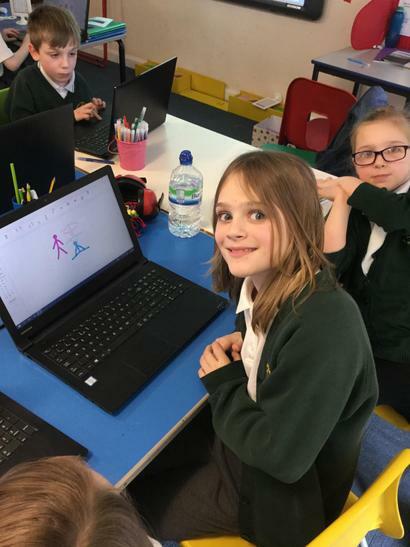 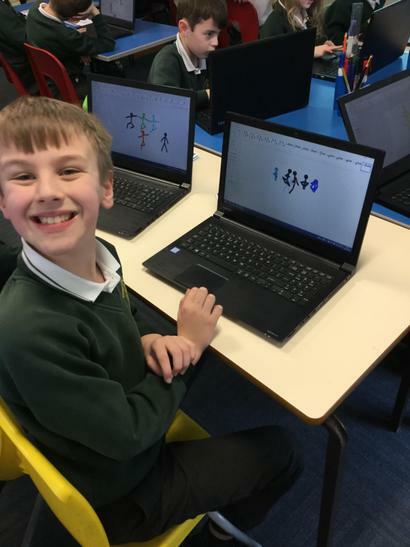 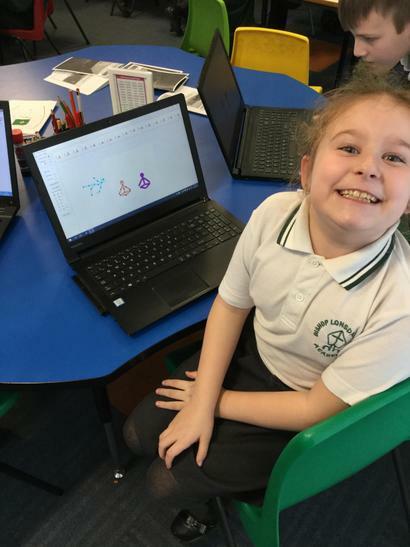 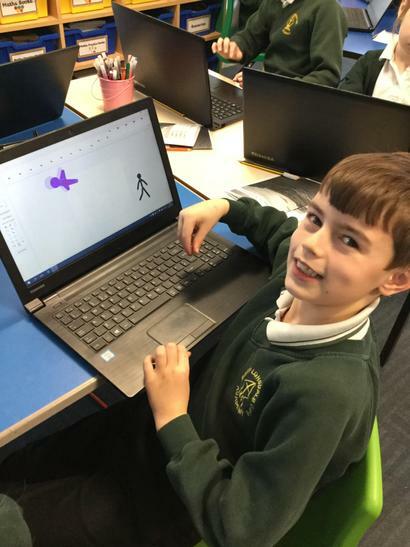 In addition, in school we will support the children with regular practise of their tables and a personal competition to beat your own times and scores! 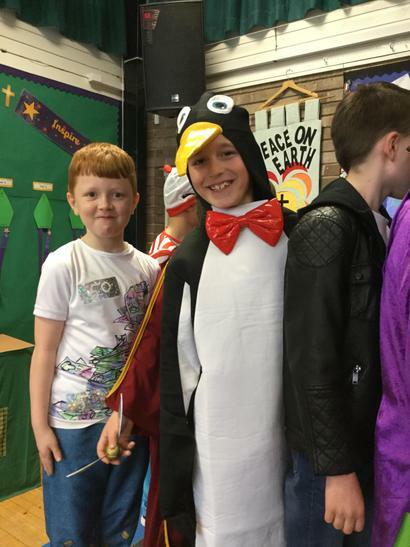 PE lessons will take place on a Monday, please ensure appropriate clothing is sent in so the children are warm during this inclement weather. 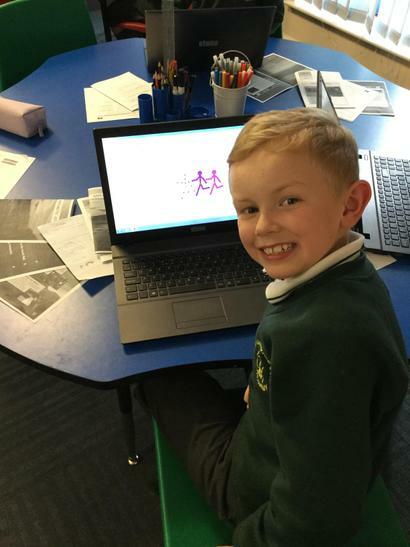 As always if you have any queries or need to speak to us then please don't hesitate to do so. 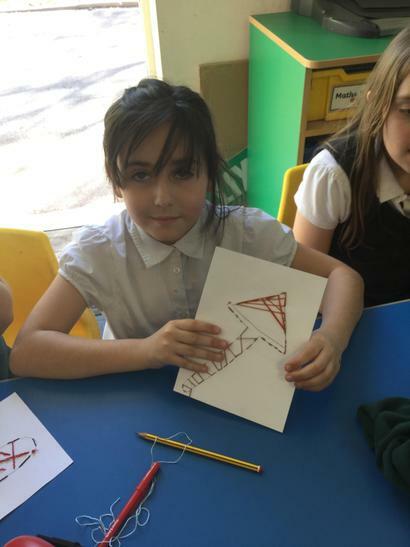 We look forward to a very exciting year ahead and thank you in advance for all your continued support. 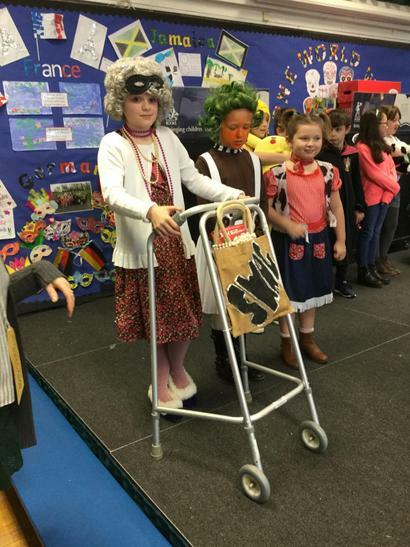 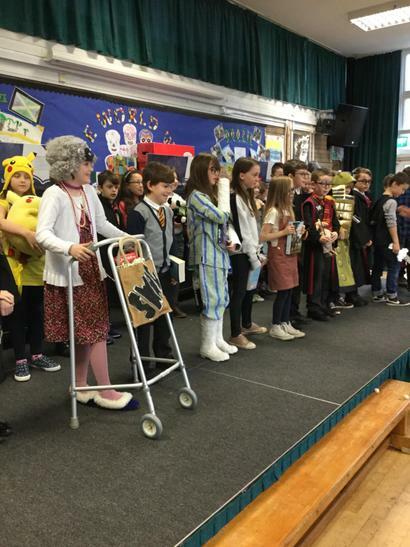 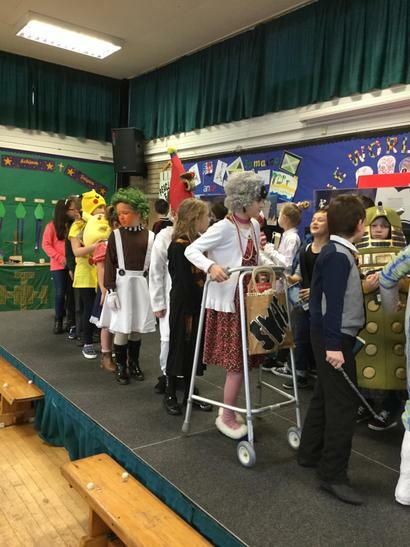 Mrs C Jones and Mrs E Bates and the Year 4 team. 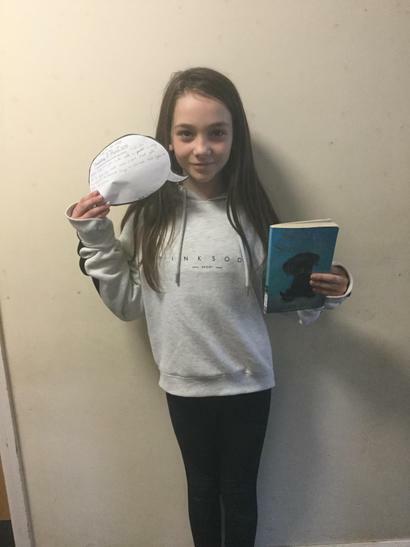 We love to READ ... Click this link to the Book Trust to find your ideal book. 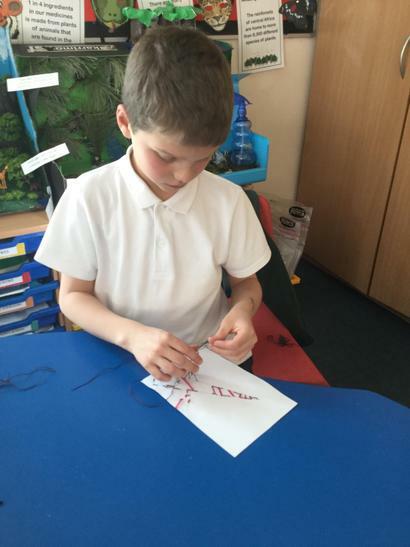 During Shakespeare week we have been studying Macbeth. 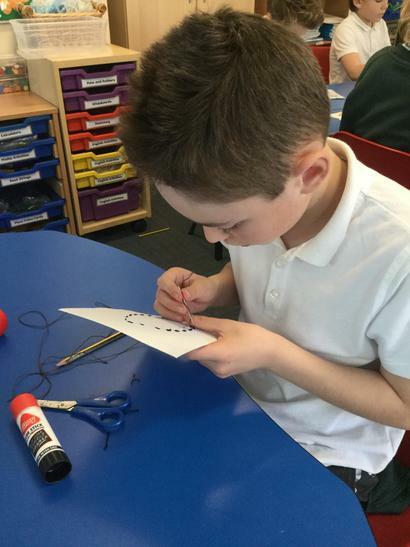 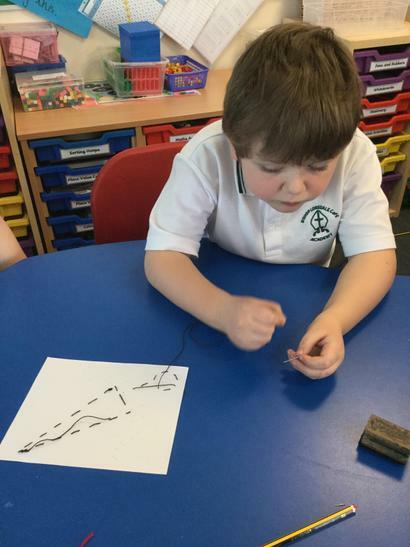 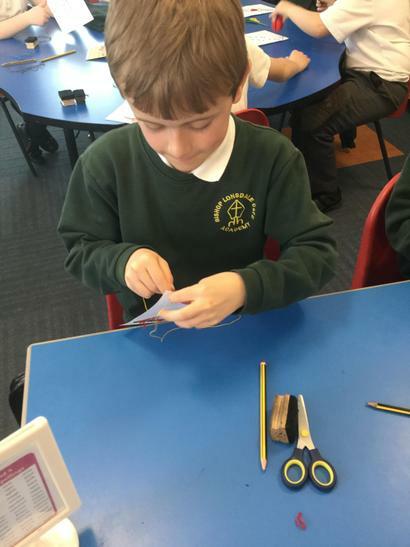 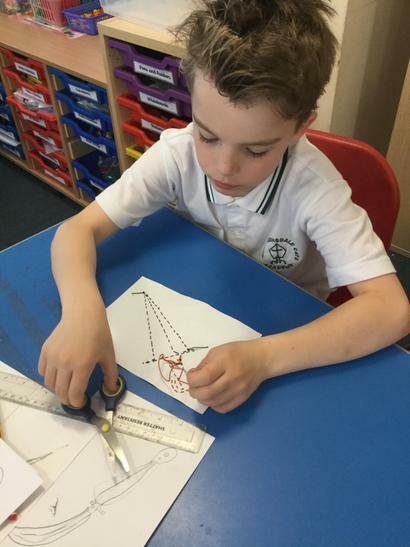 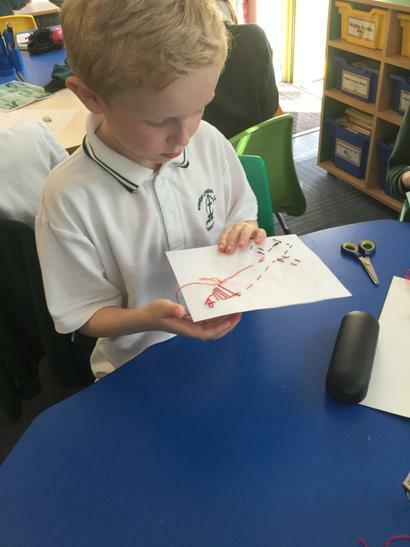 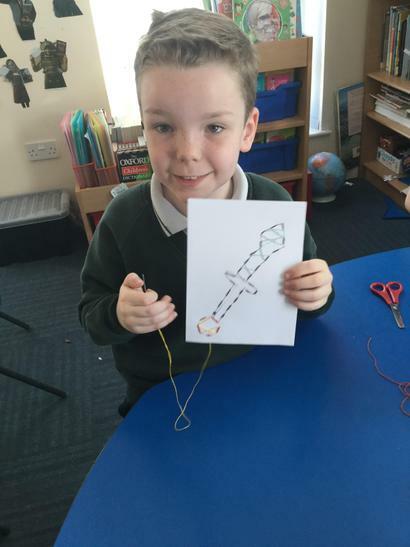 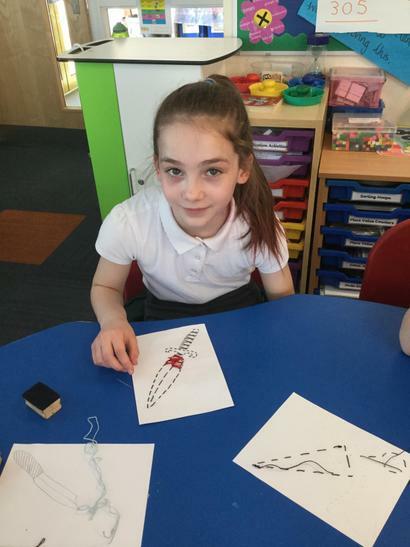 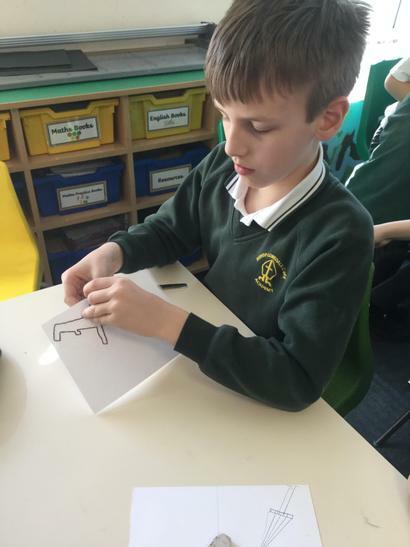 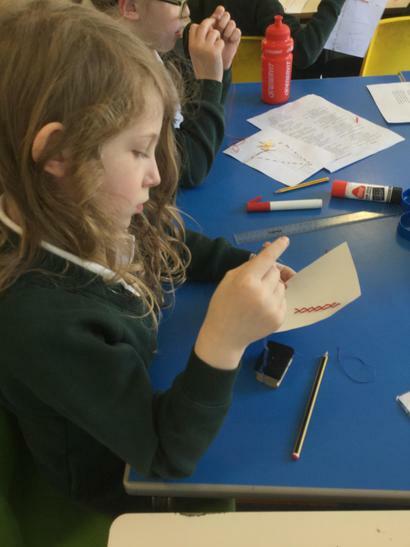 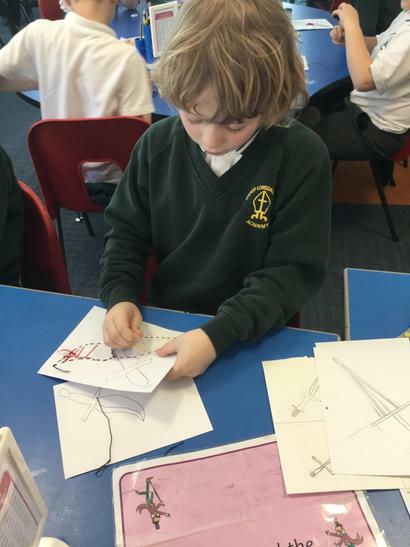 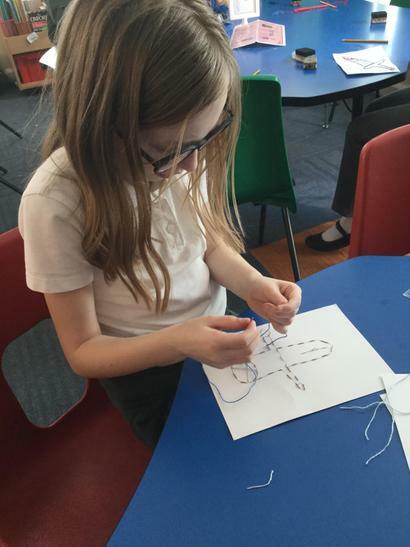 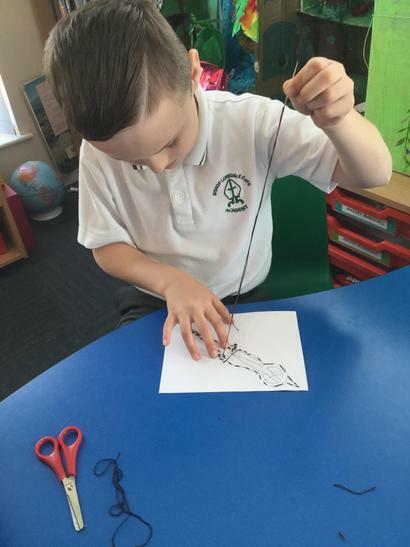 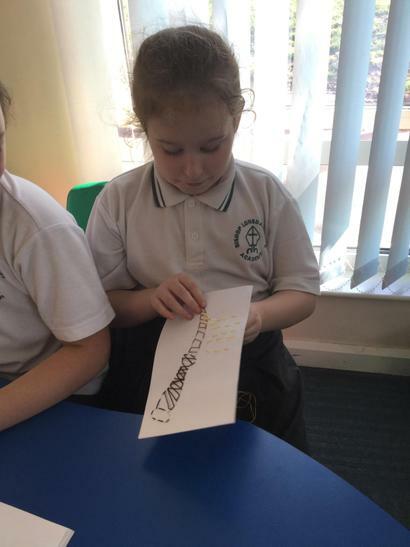 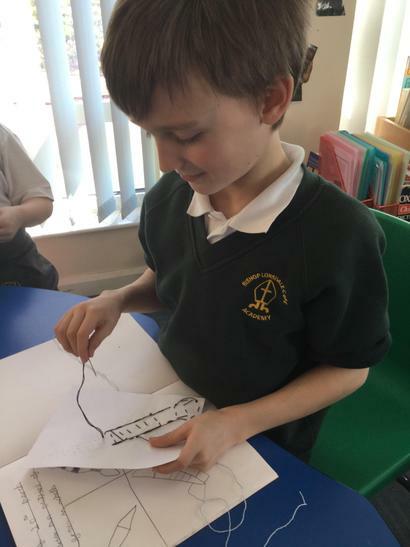 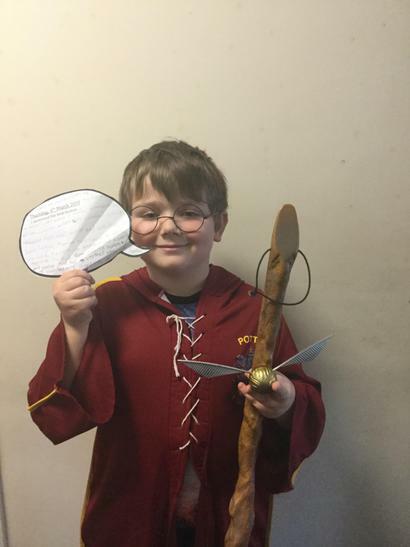 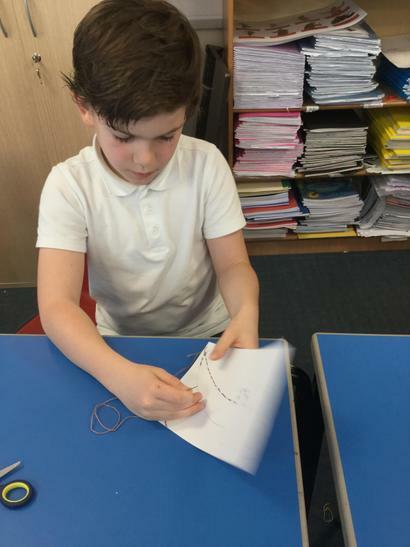 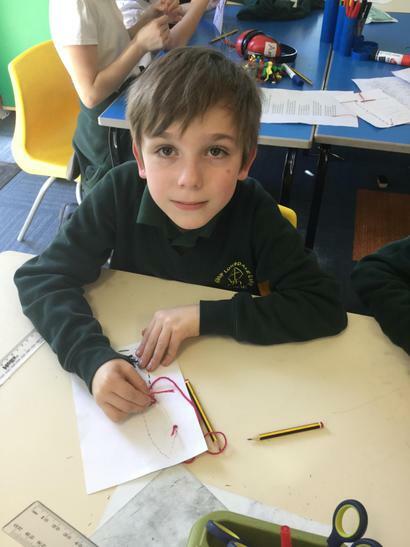 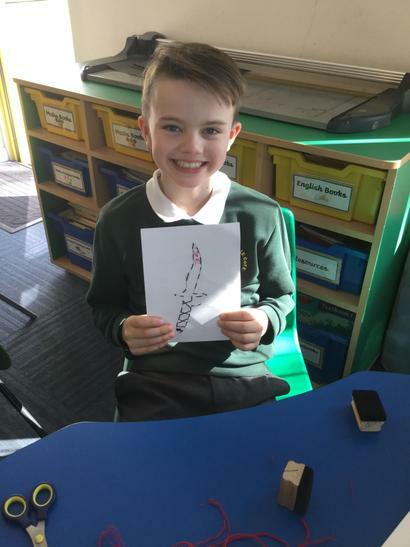 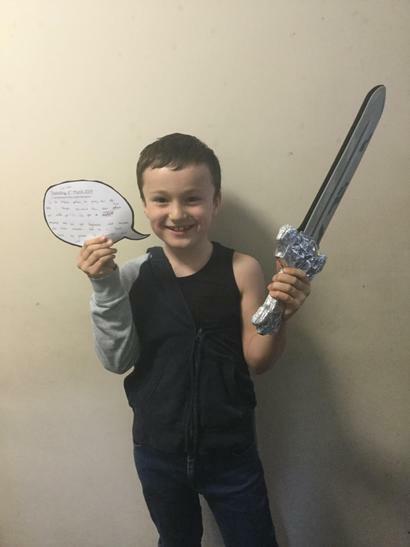 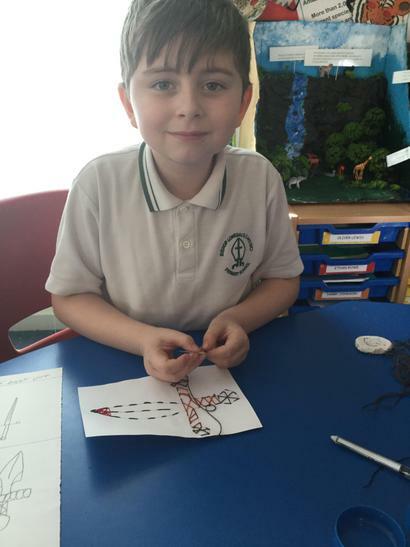 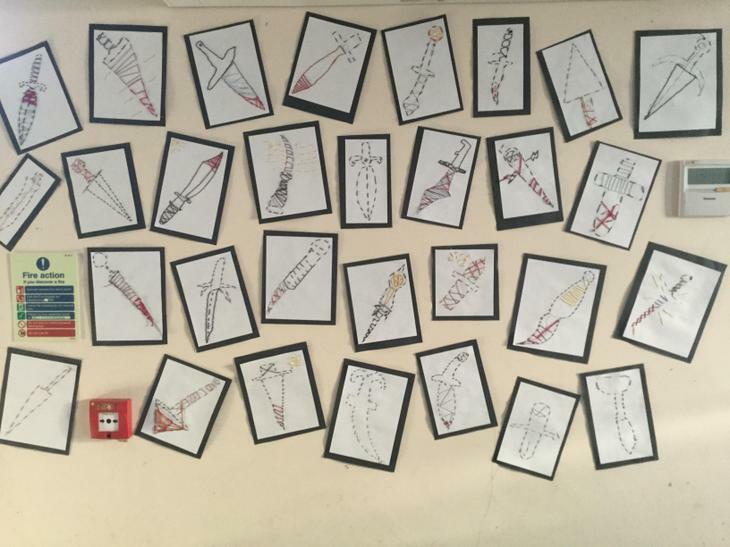 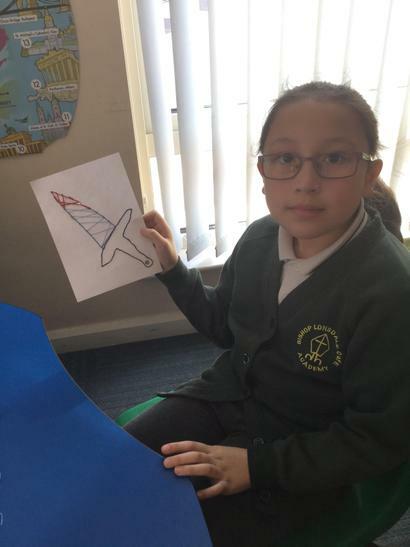 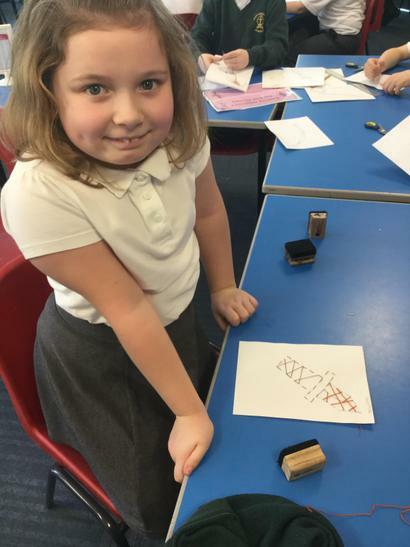 Inspired by the story and the ruthless act of Macbeth killing King Duncan, the children designed a dagger on paper then used sewing skills to complete their design. 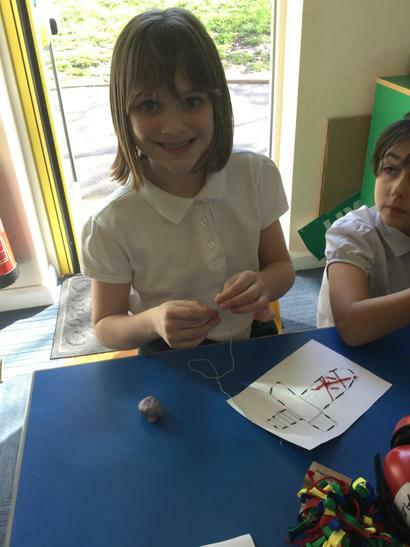 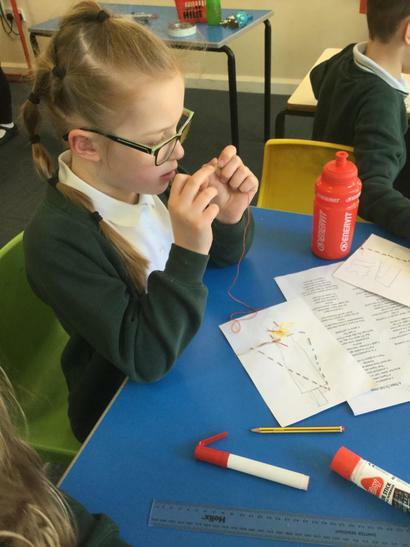 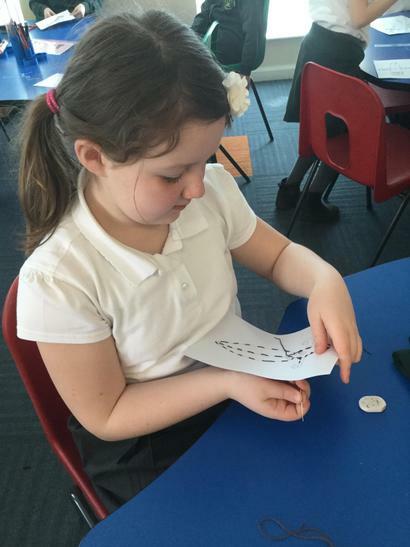 The children were thrilled with their success at developing their sewing skills. 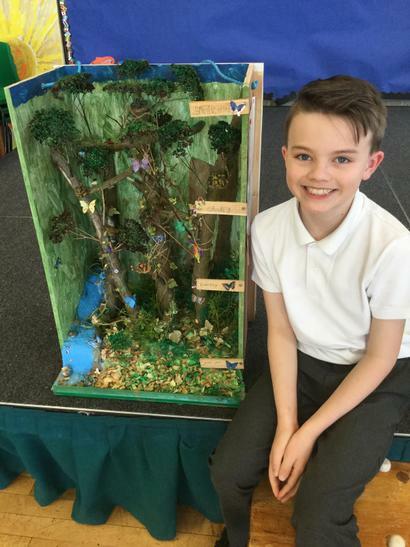 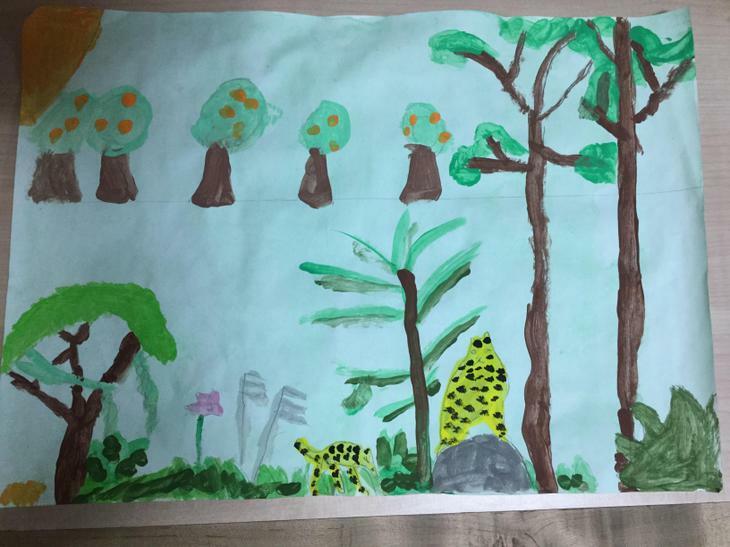 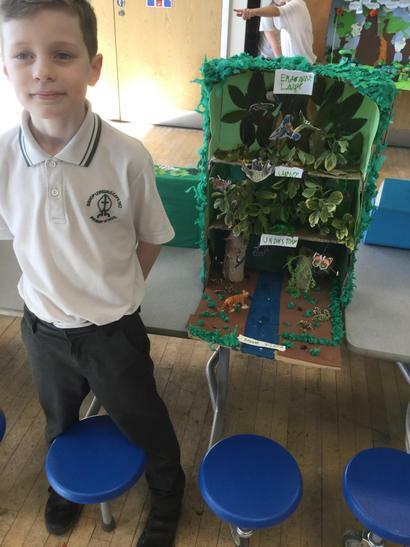 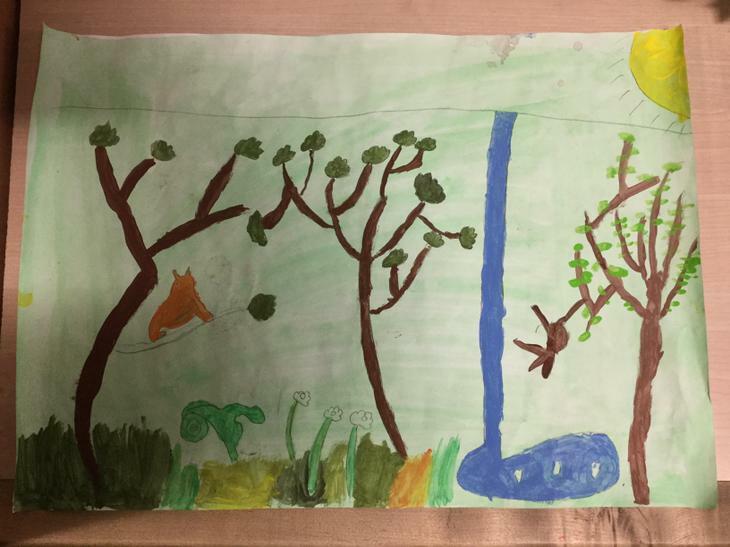 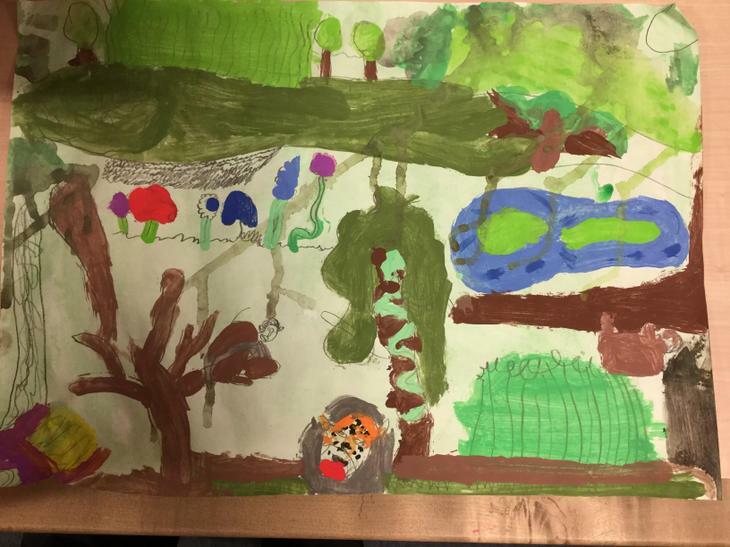 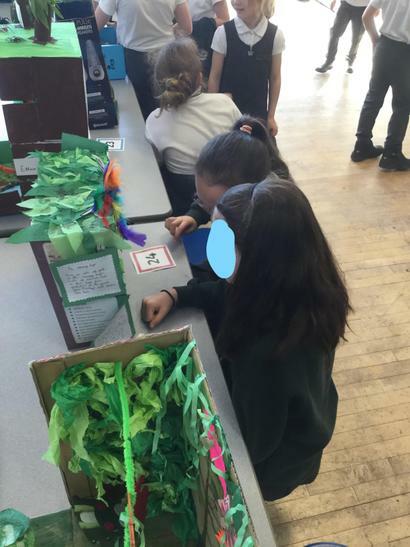 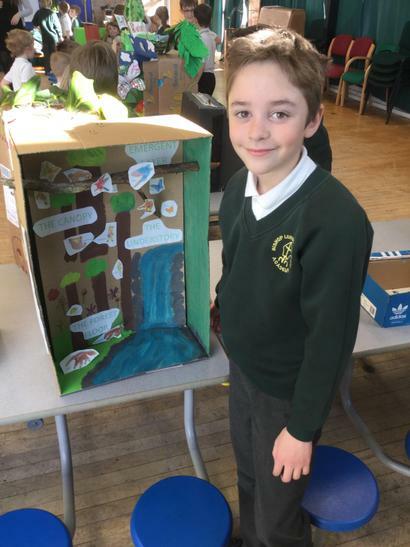 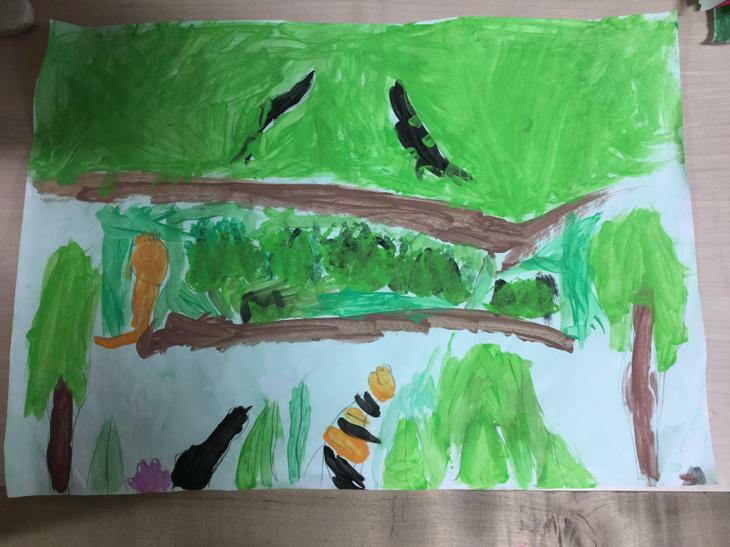 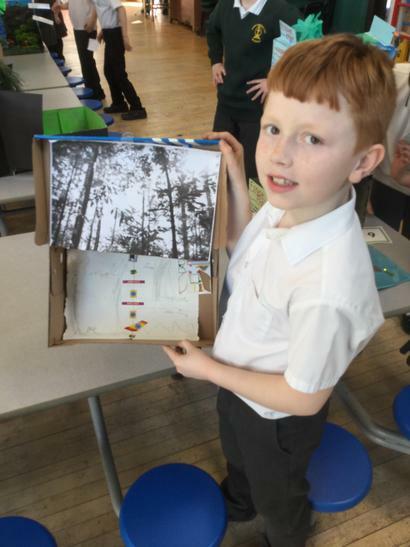 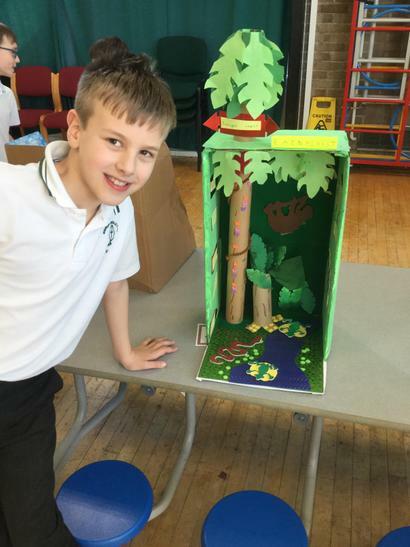 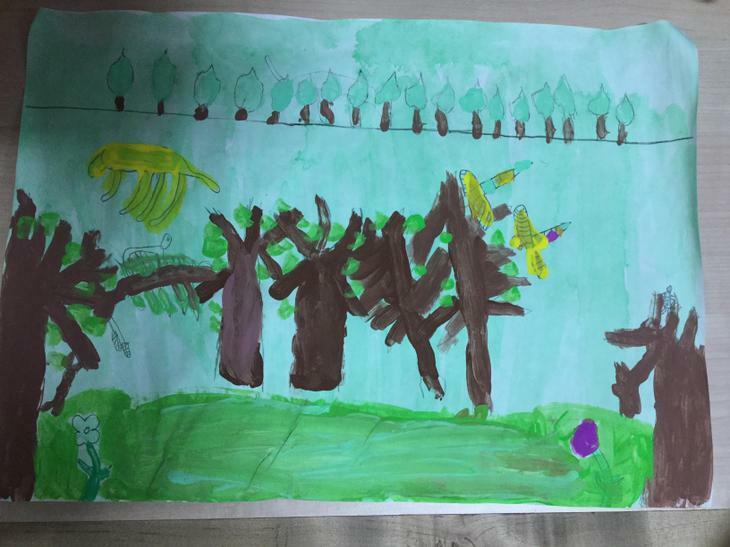 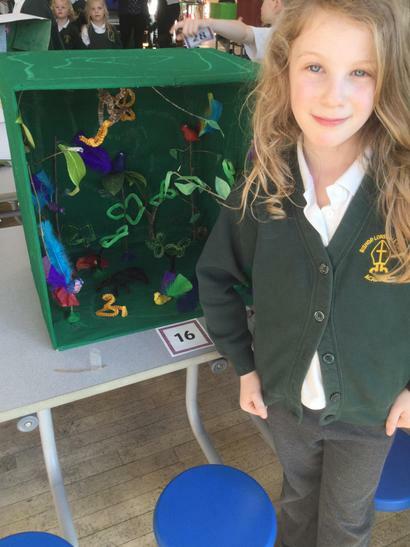 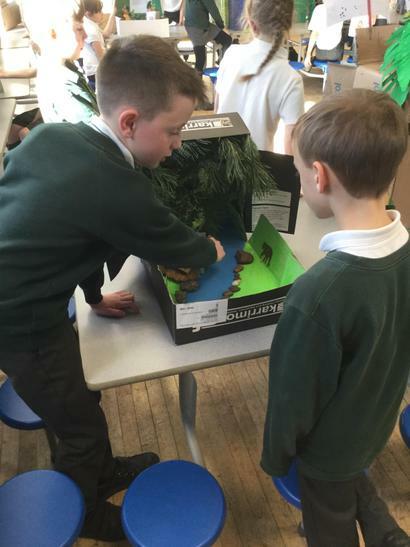 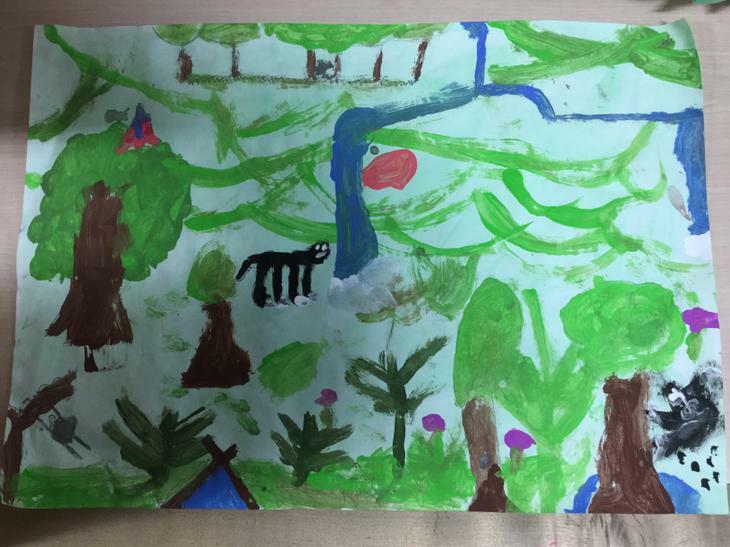 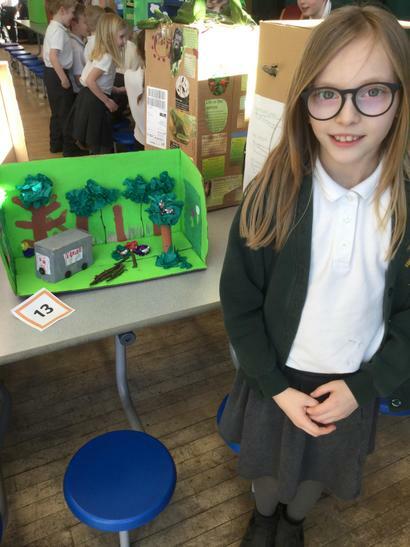 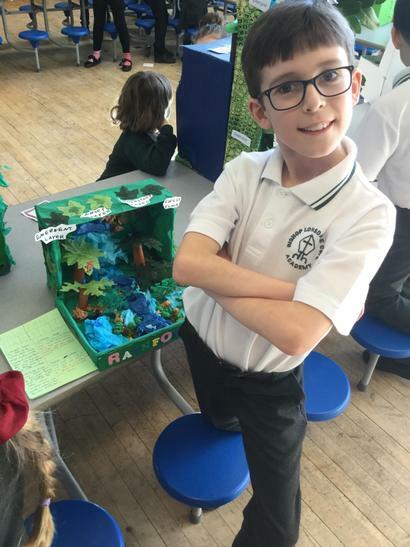 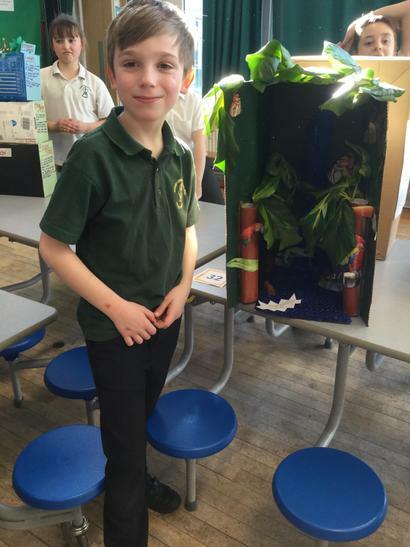 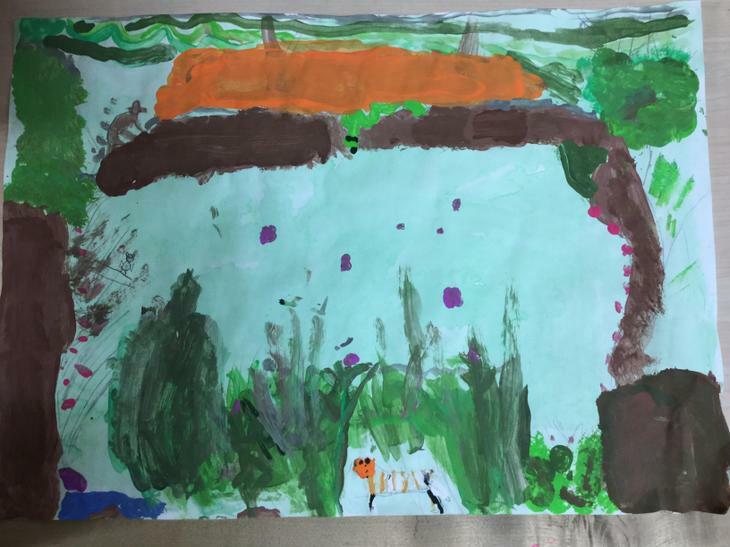 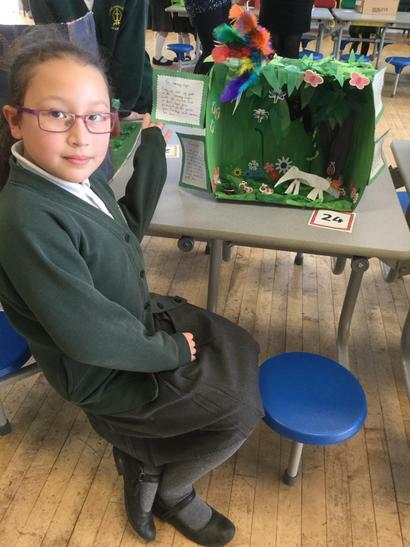 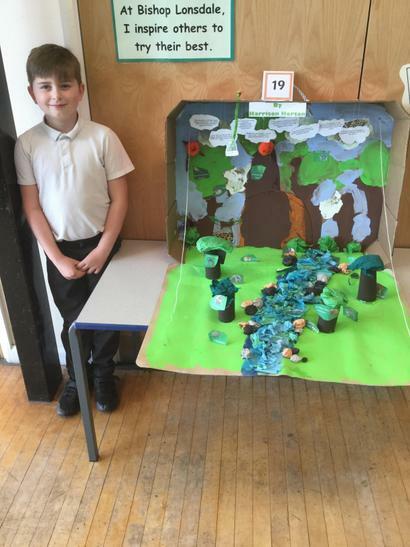 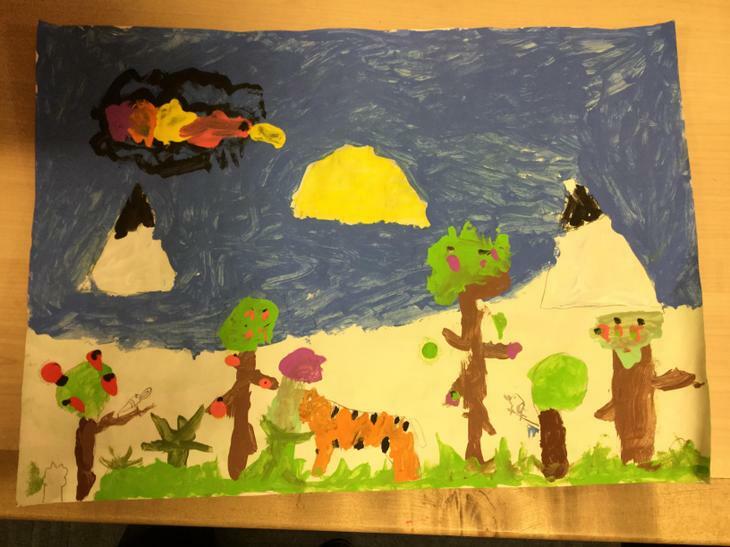 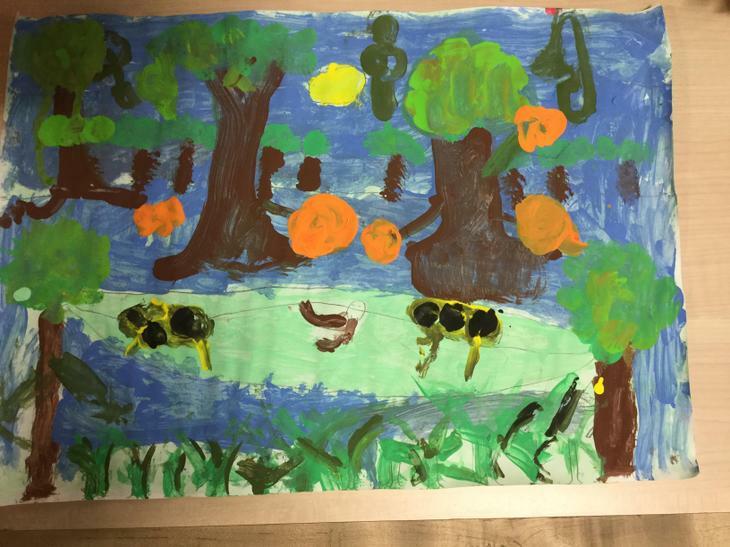 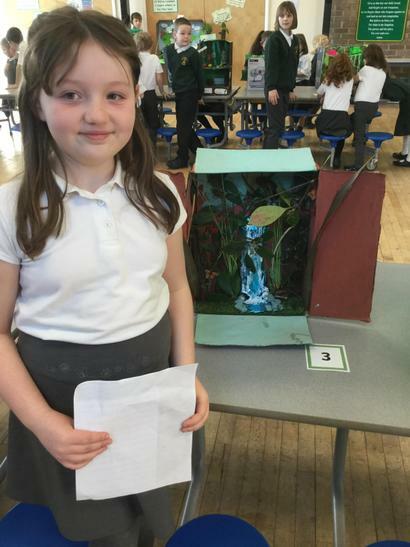 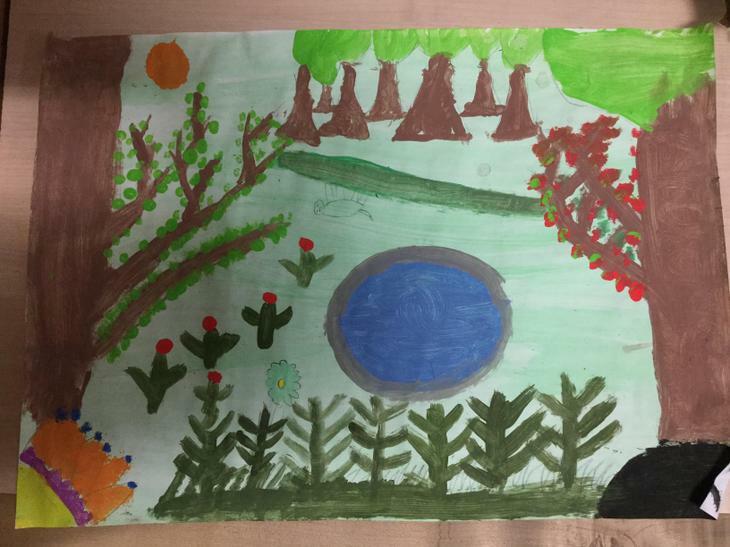 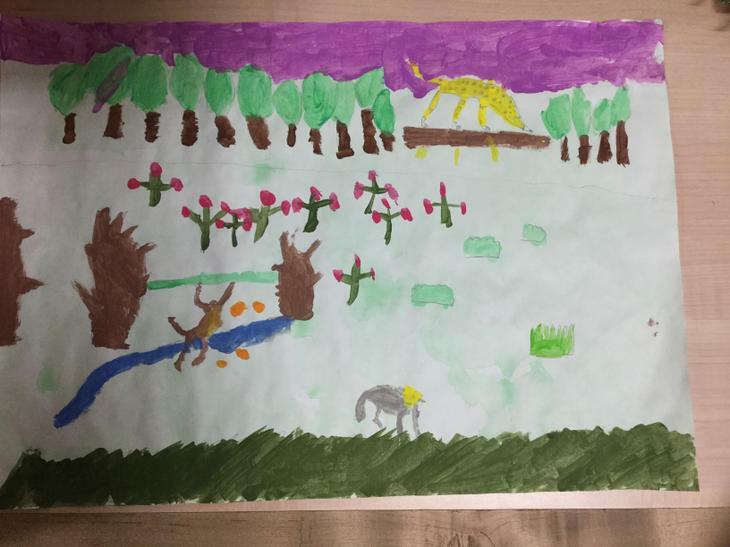 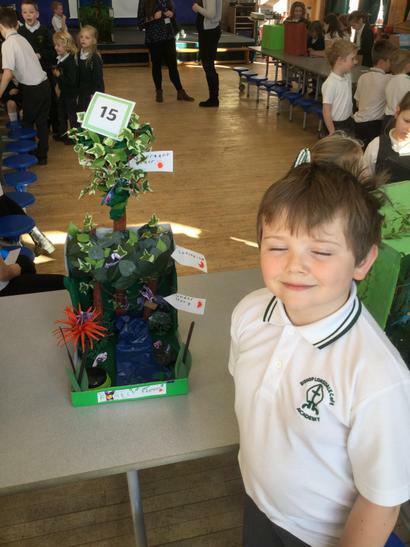 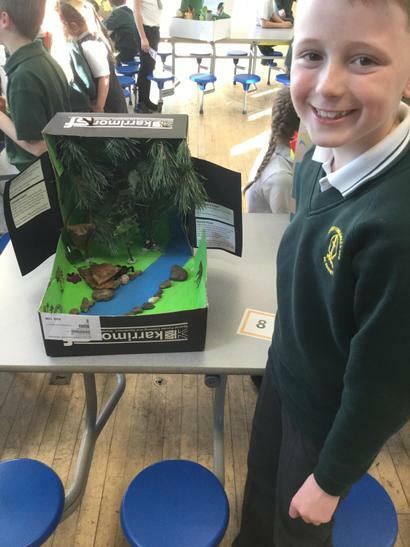 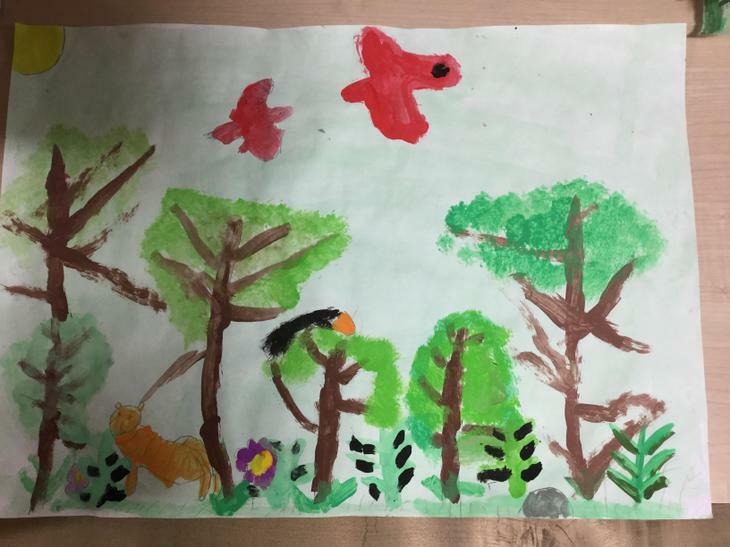 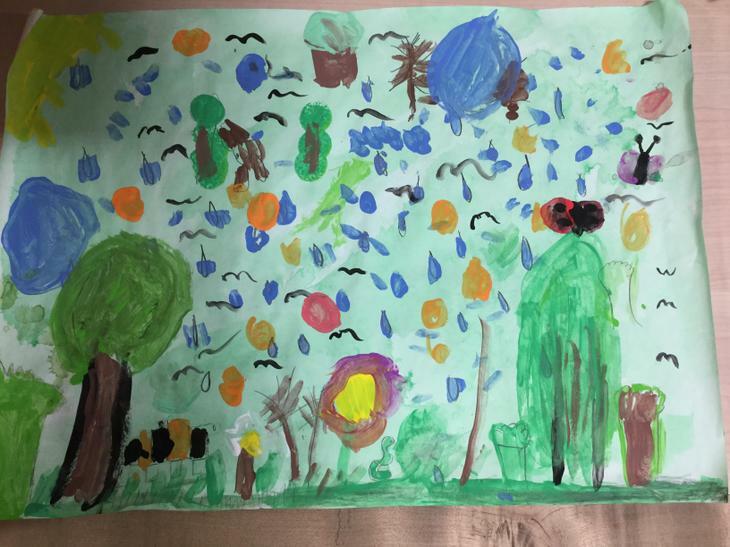 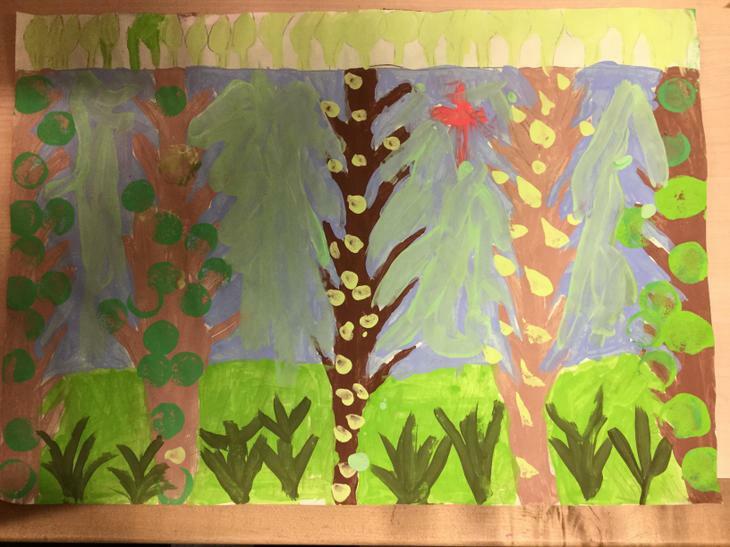 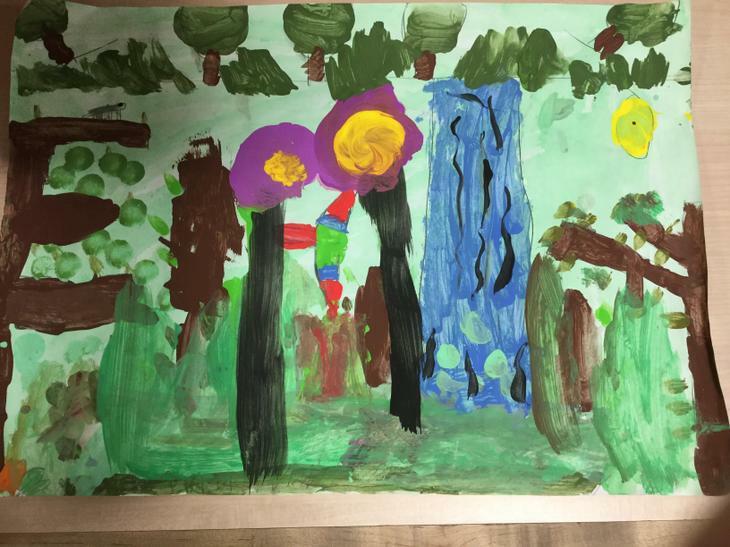 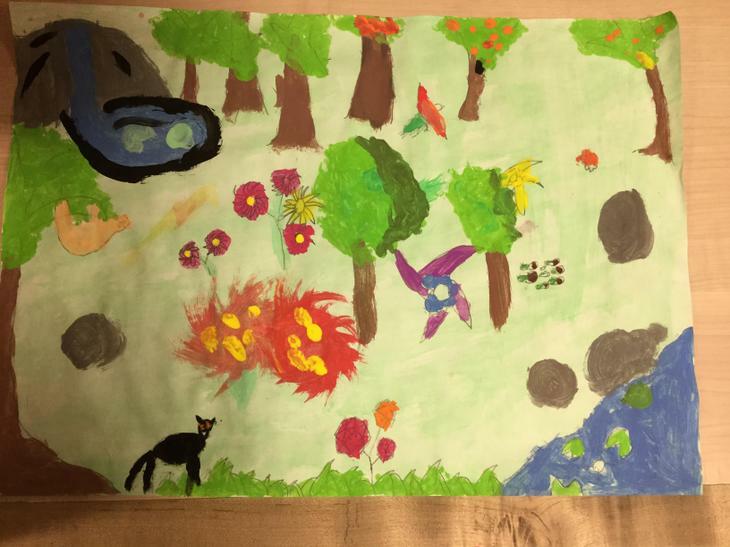 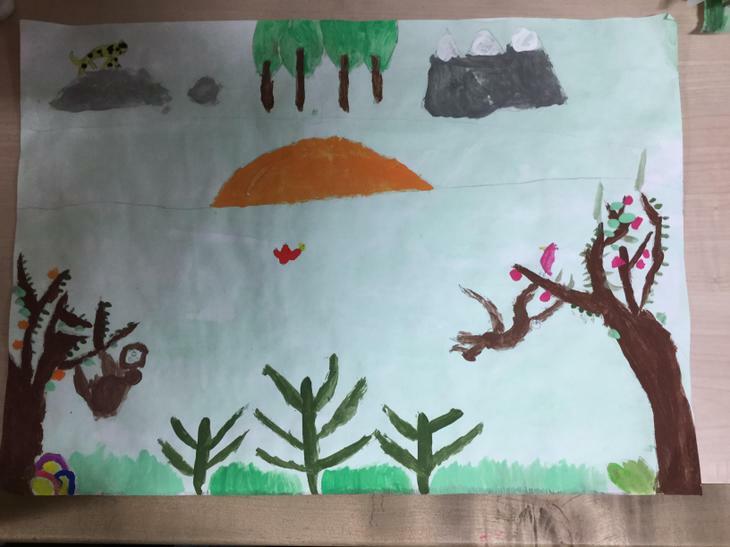 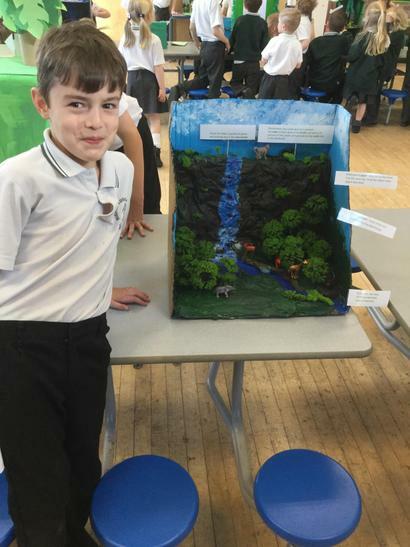 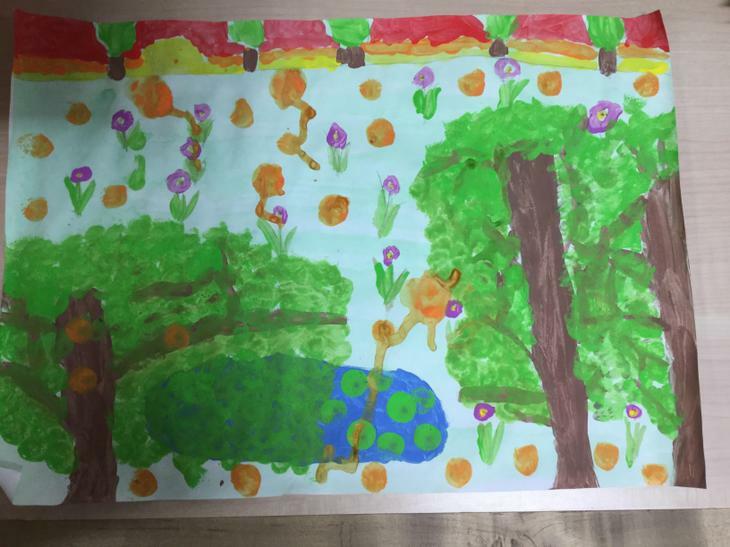 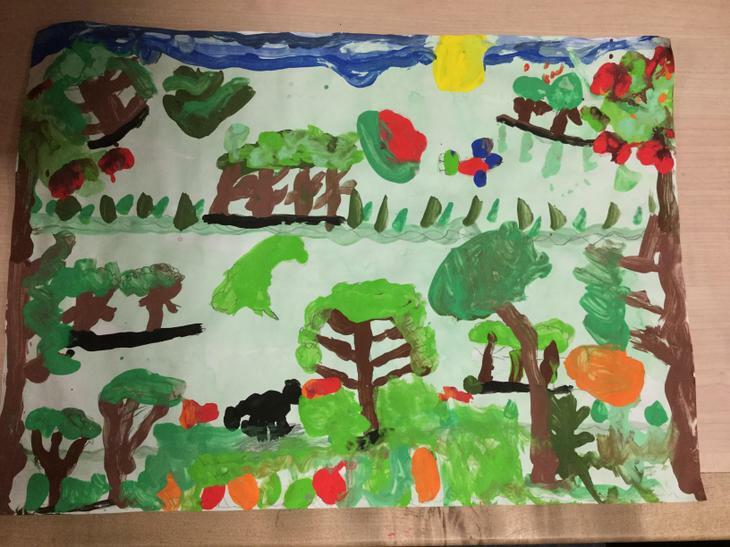 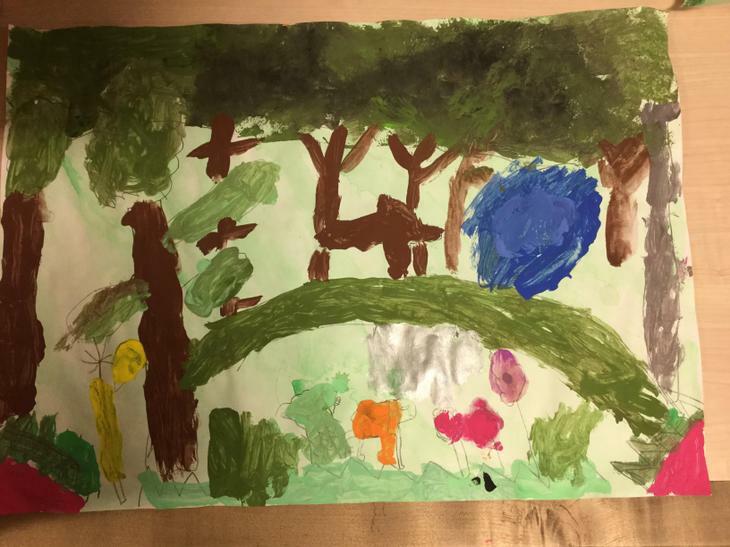 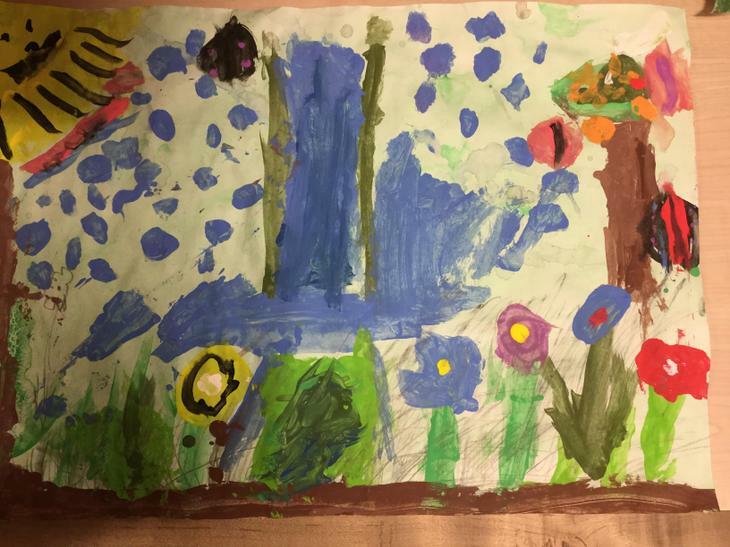 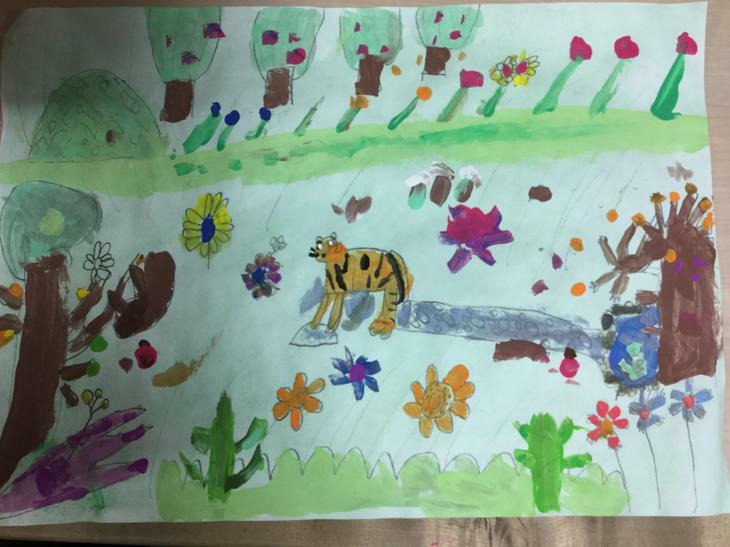 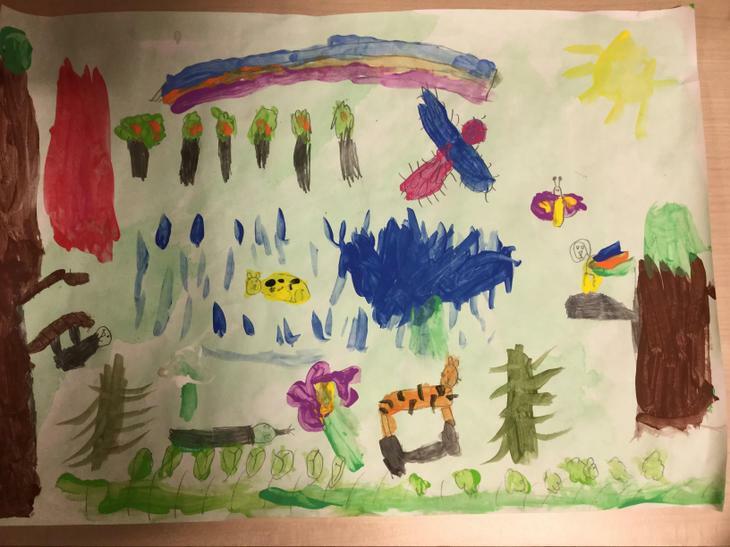 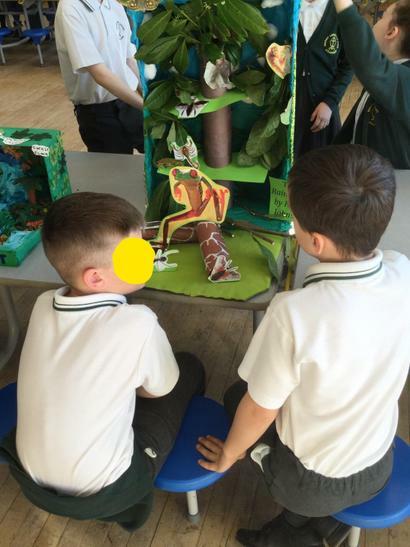 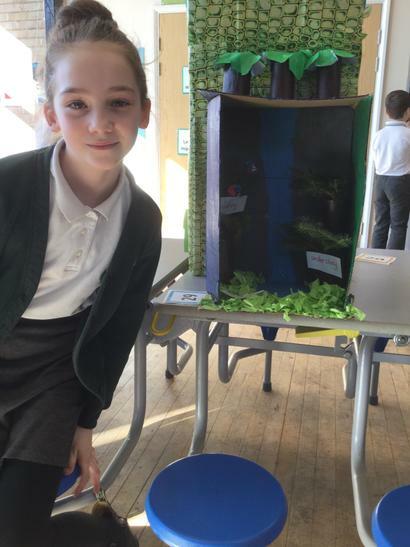 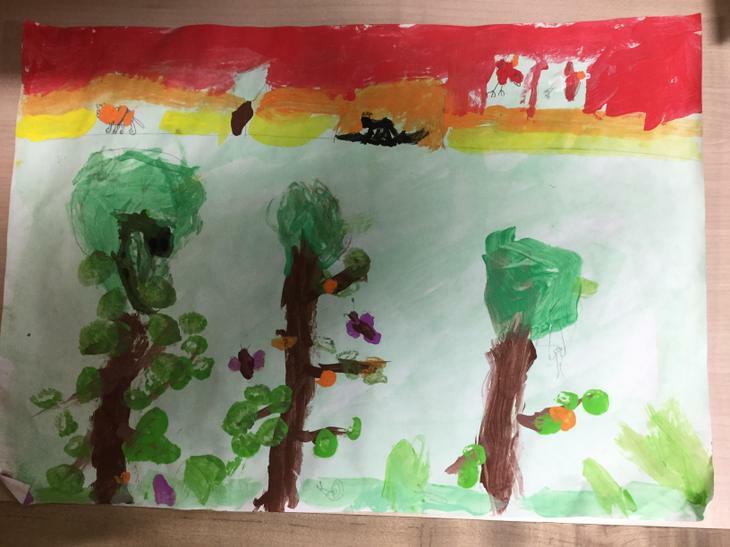 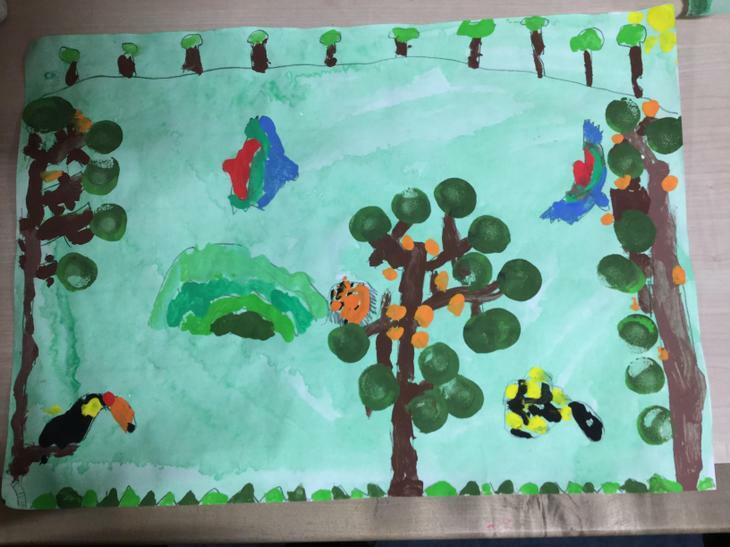 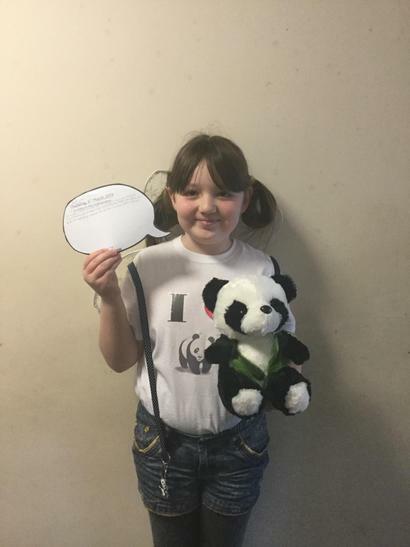 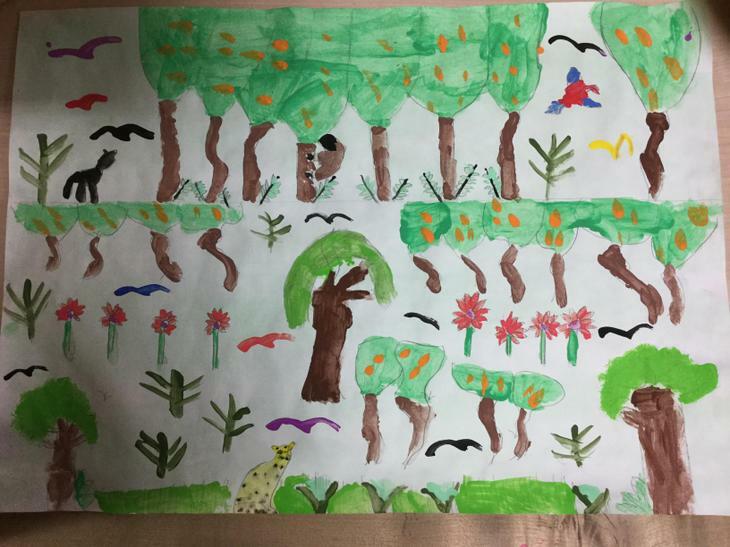 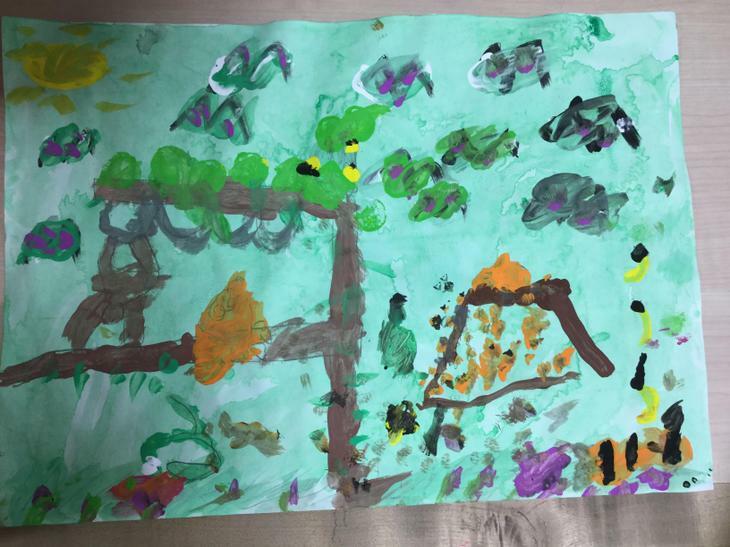 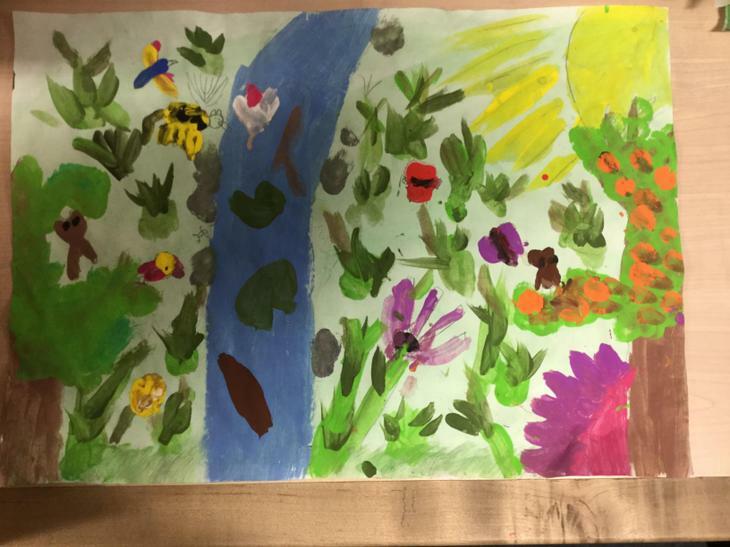 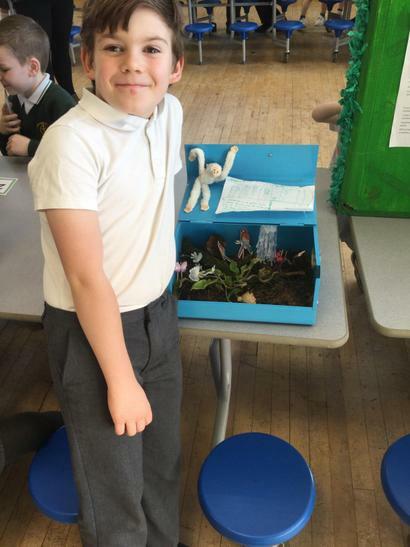 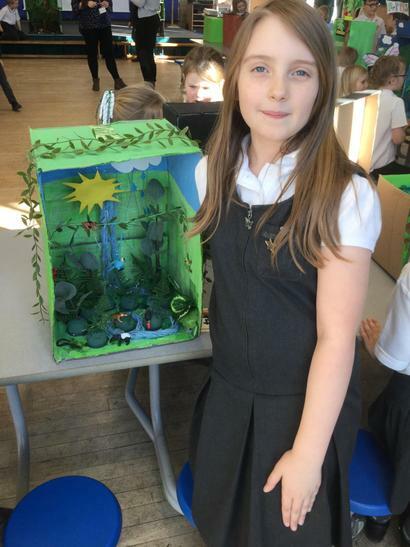 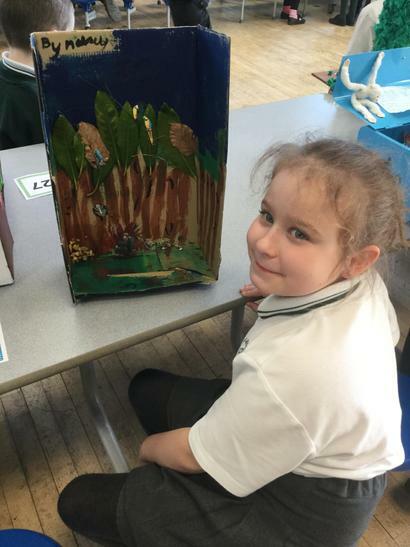 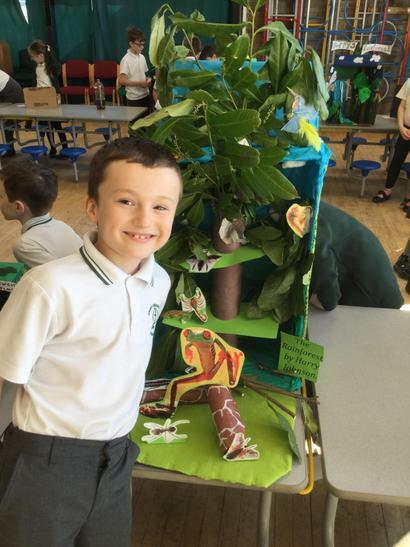 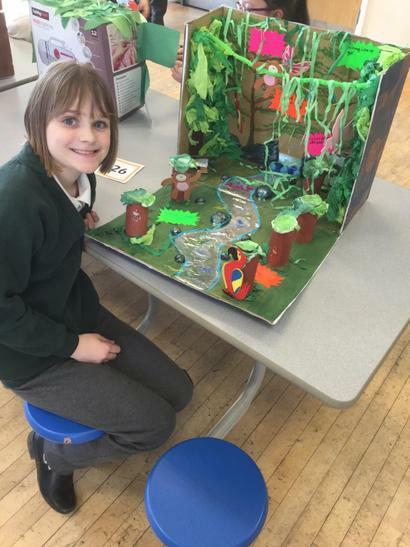 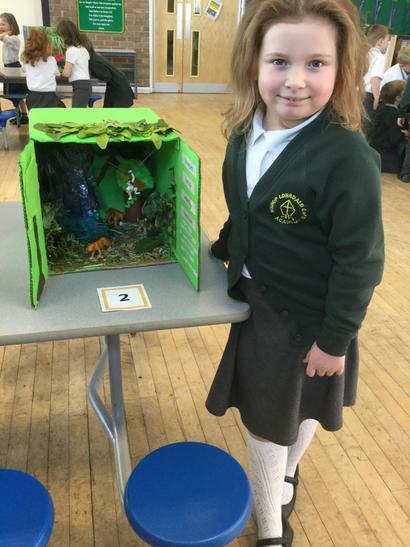 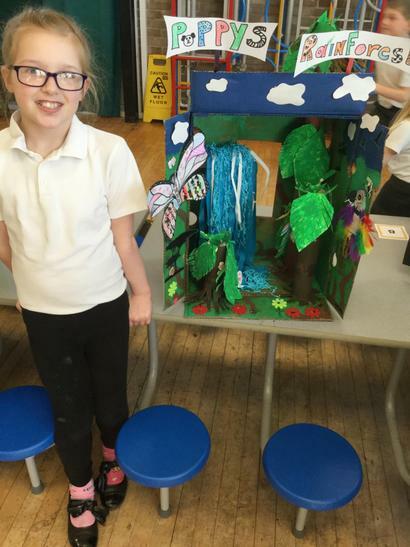 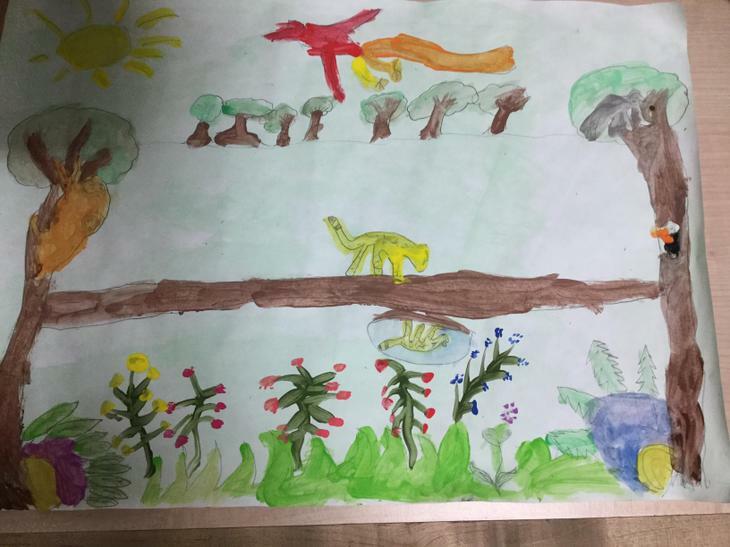 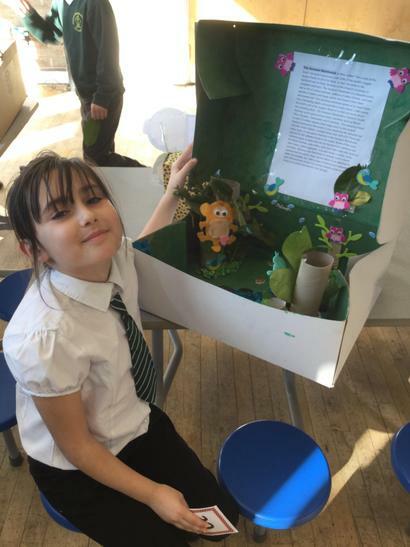 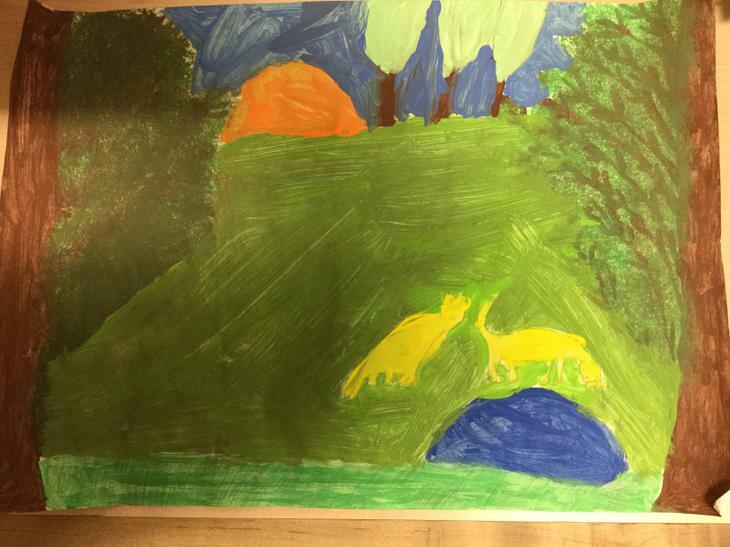 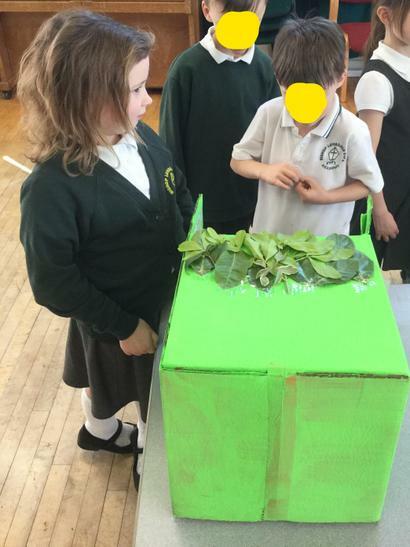 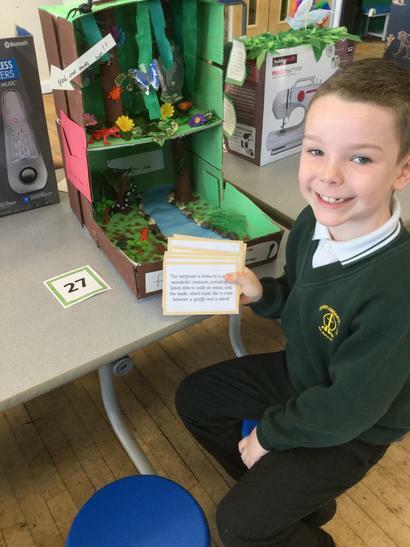 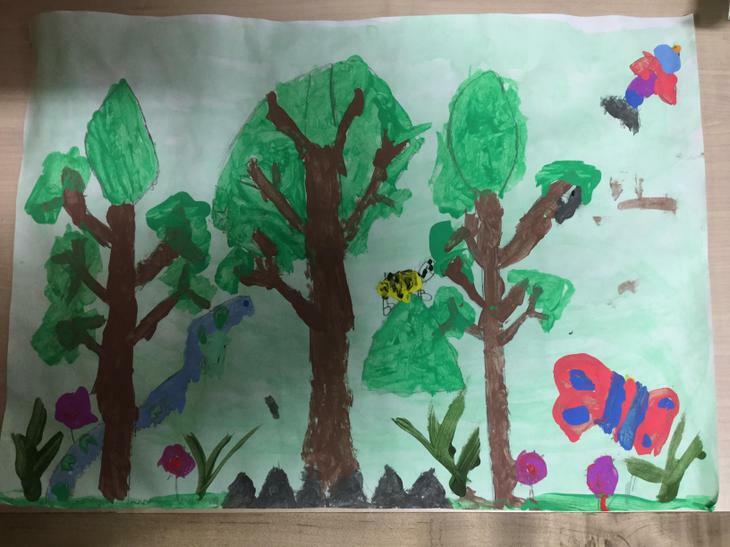 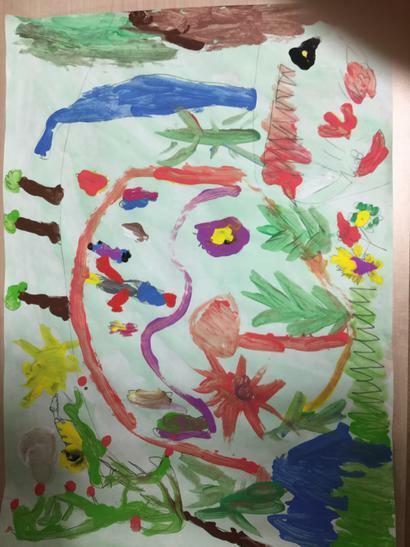 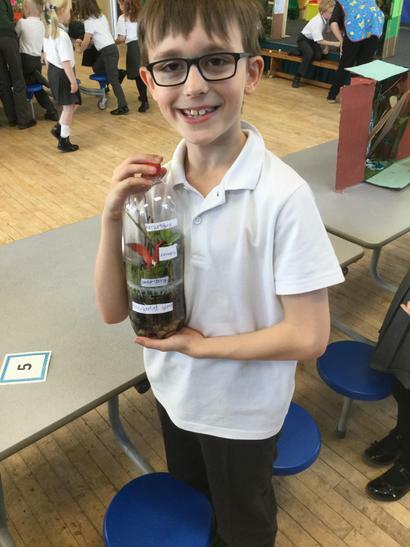 As part of our Spring Term Rainforest topic, the children all produced projects to show the structure of a rainforest. 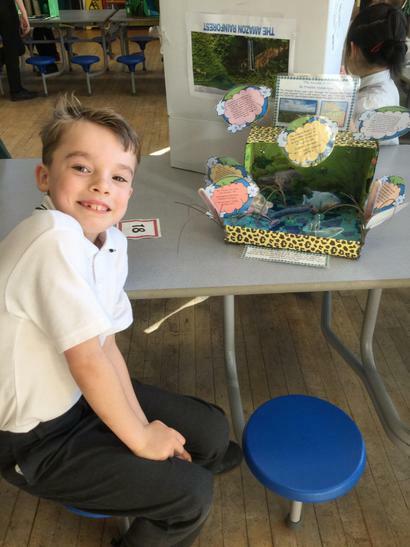 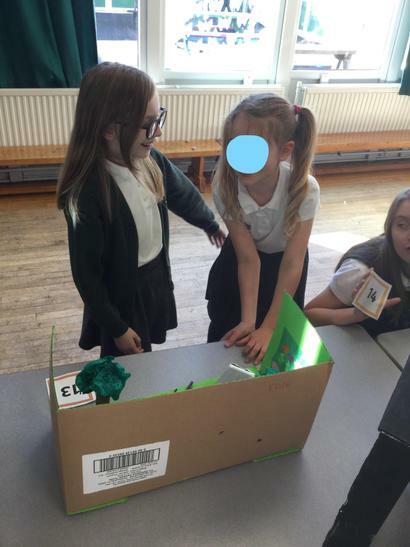 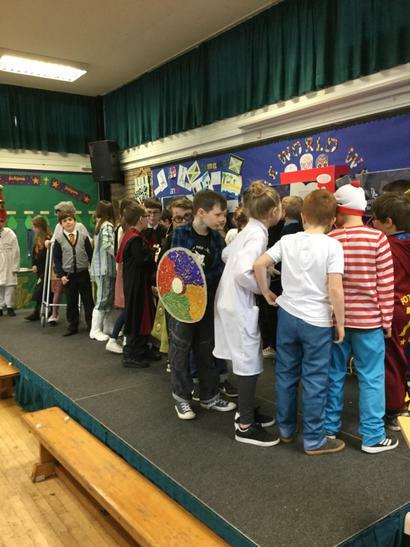 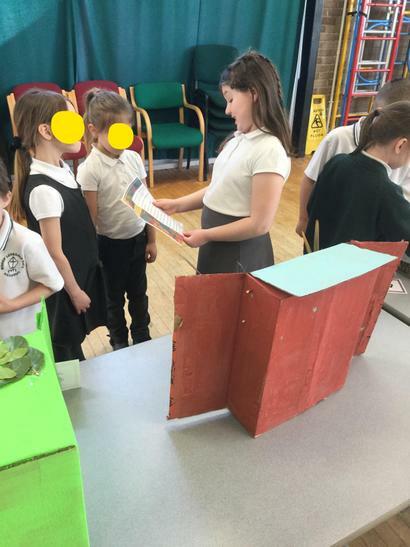 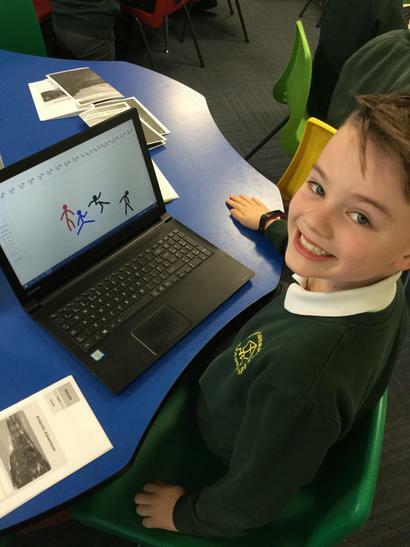 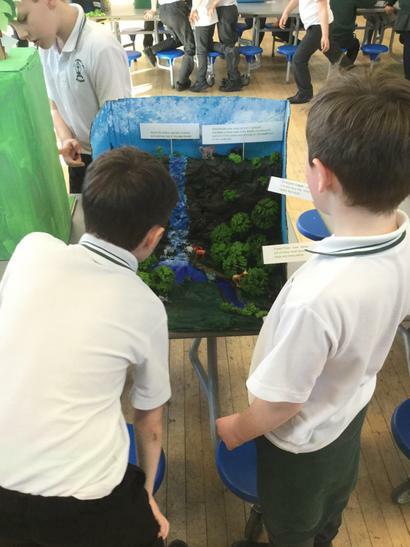 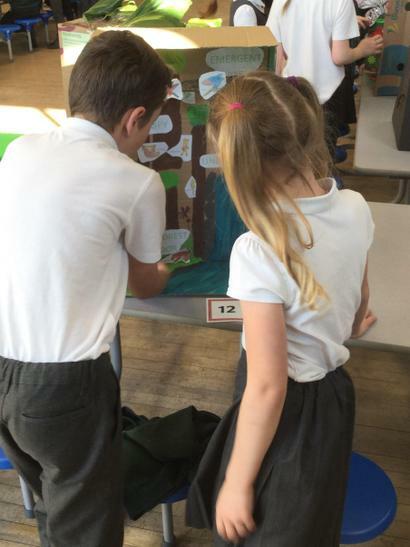 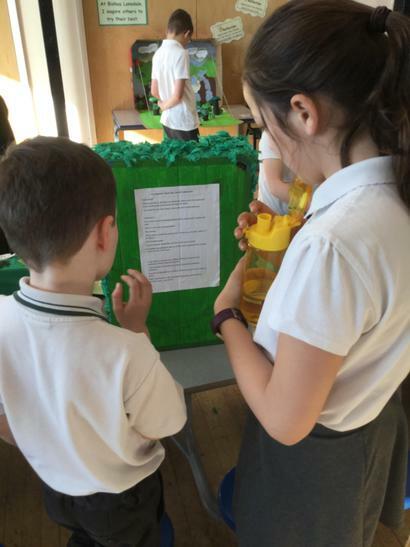 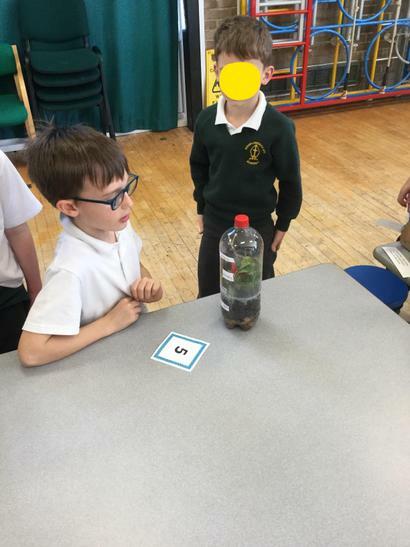 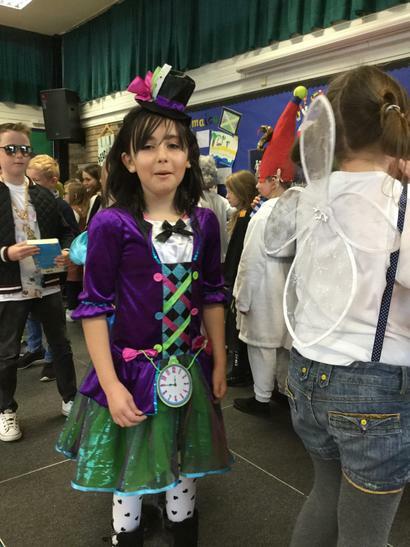 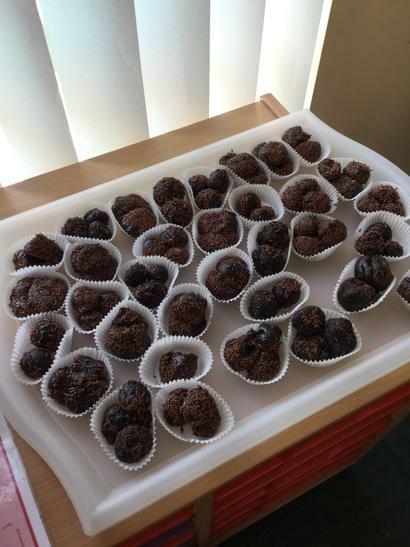 The children had the opportunity to present their models to the rest of the school and their parents during a showcase afternoon. 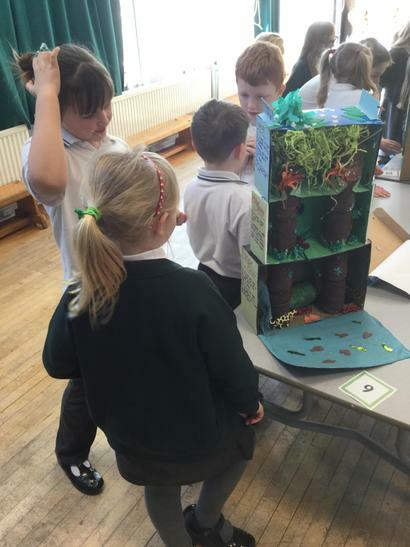 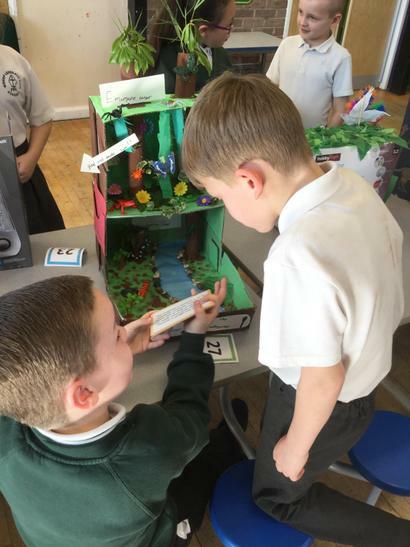 We were really impressed with the knowledge the children shared during the afternoon and their impressive models. 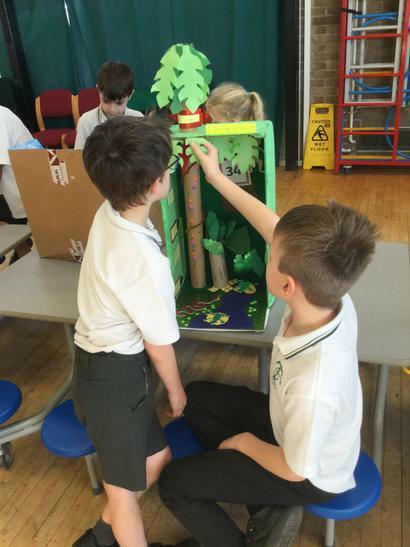 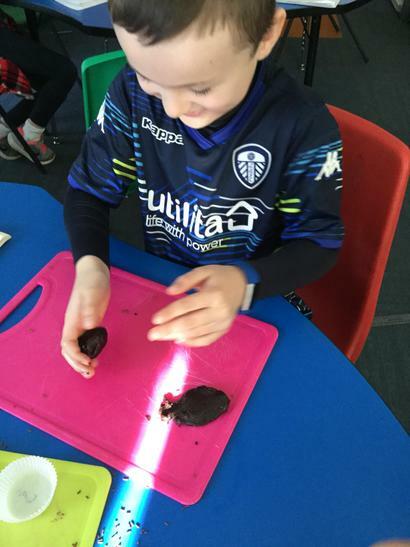 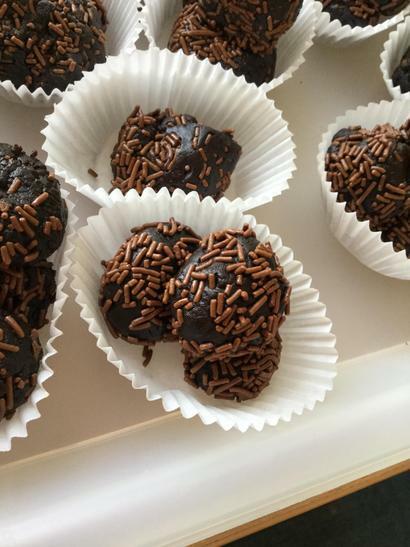 During One World Week the children learnt about Brazil, comparing and contrasts lifestyles. 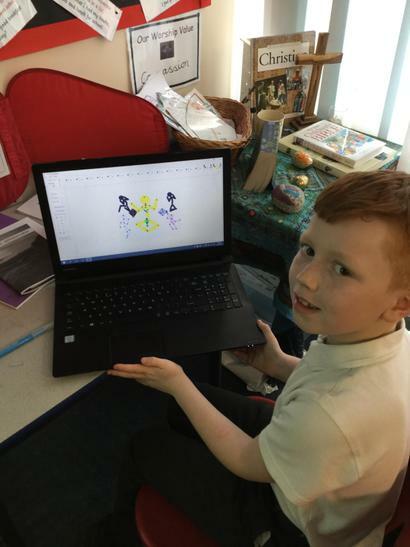 We discovered the importance of carnivals in Brazil and used this as inspiration to create exciting animations of carnival dancers. 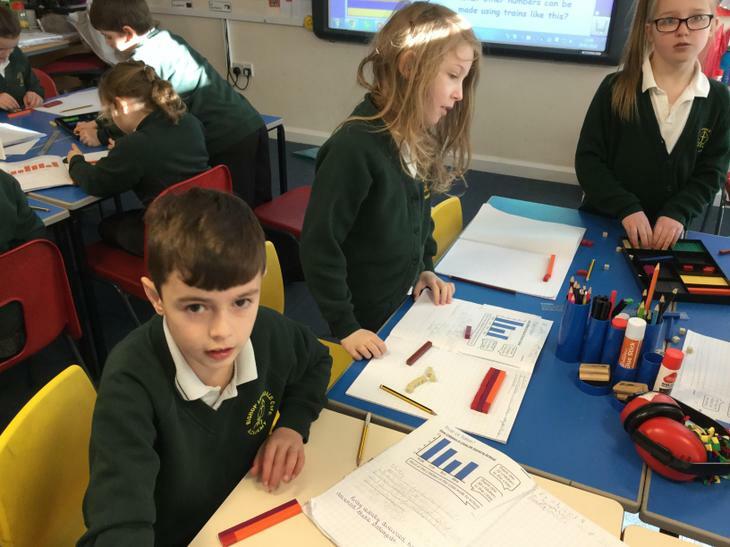 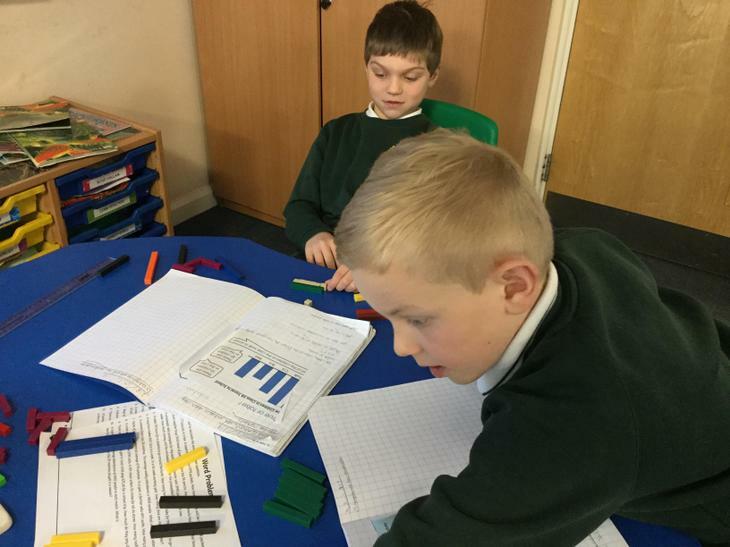 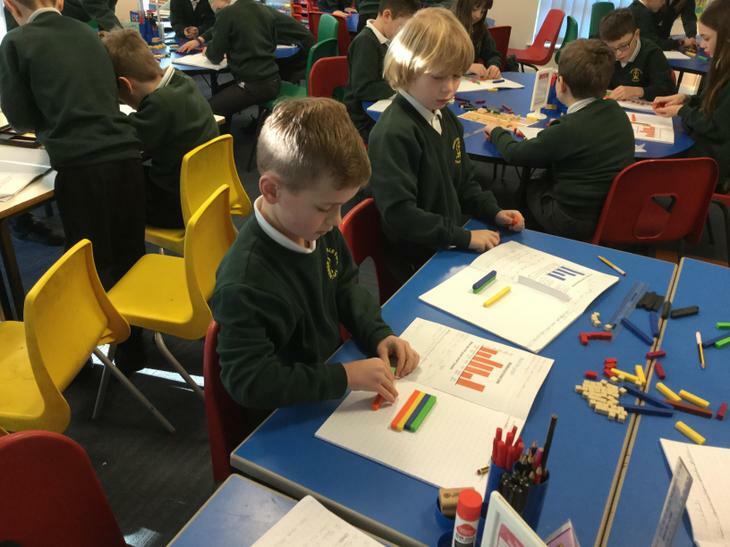 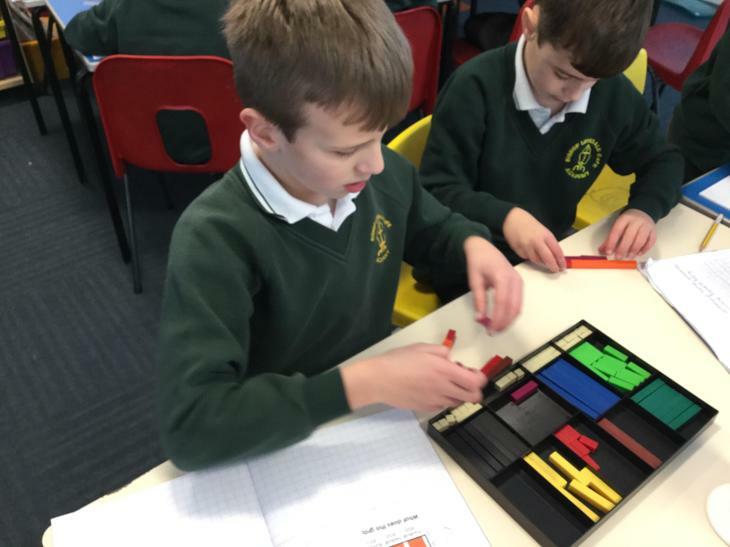 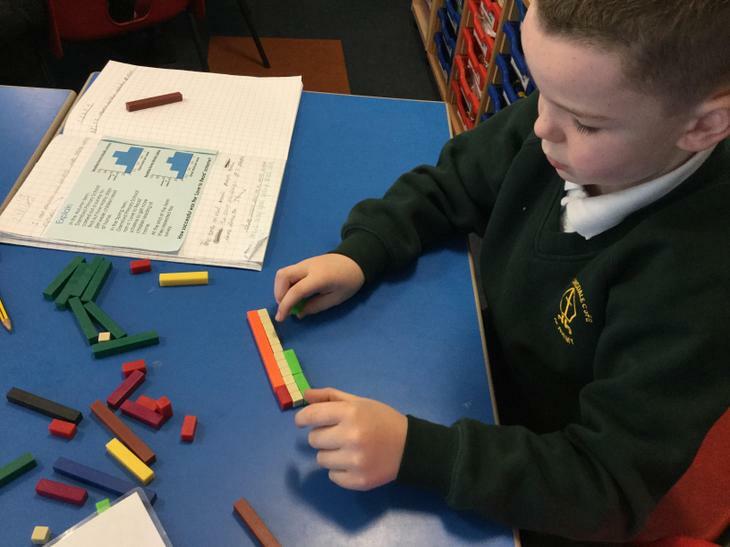 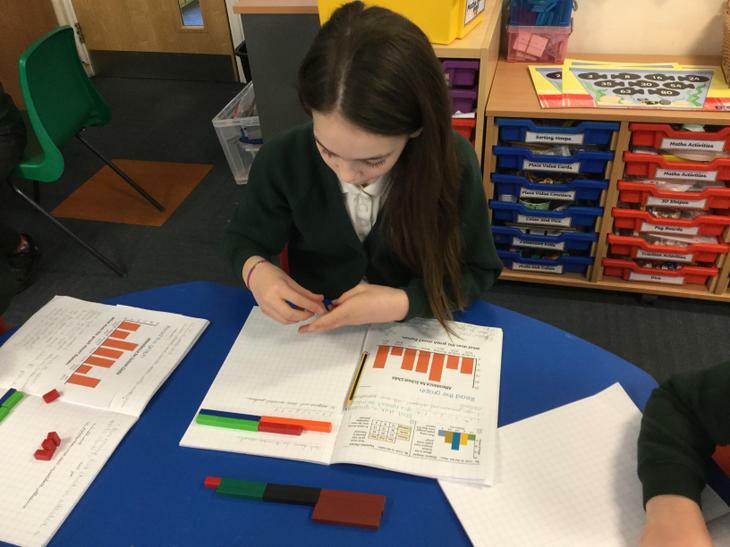 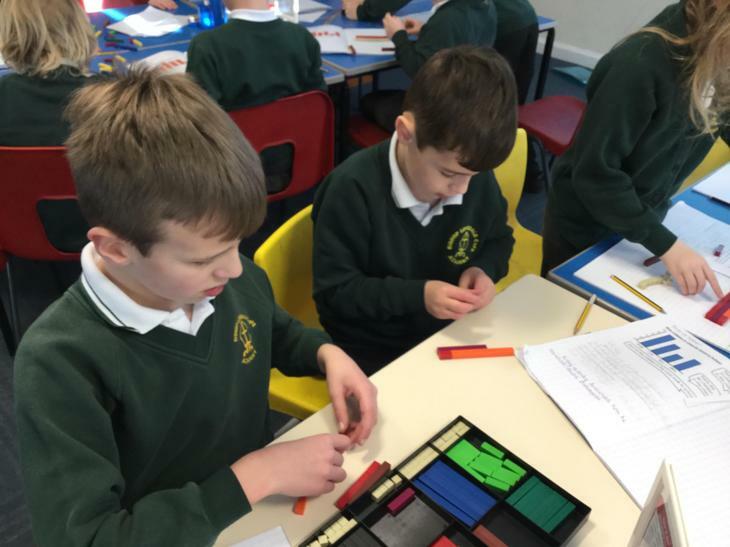 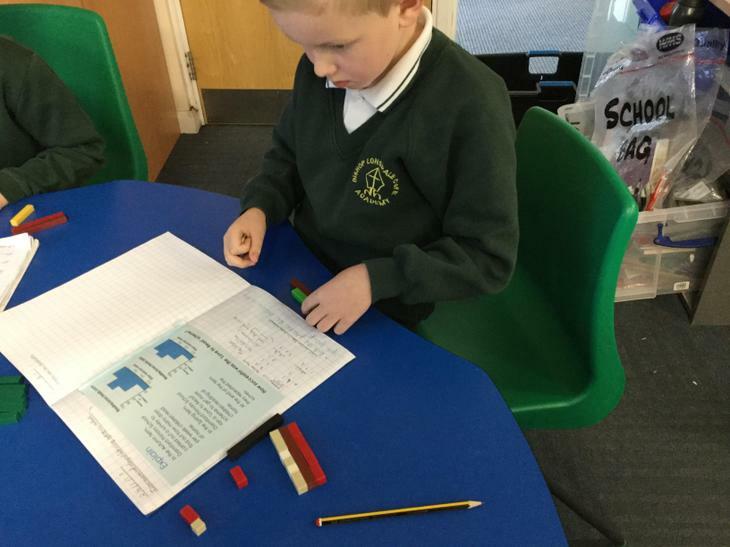 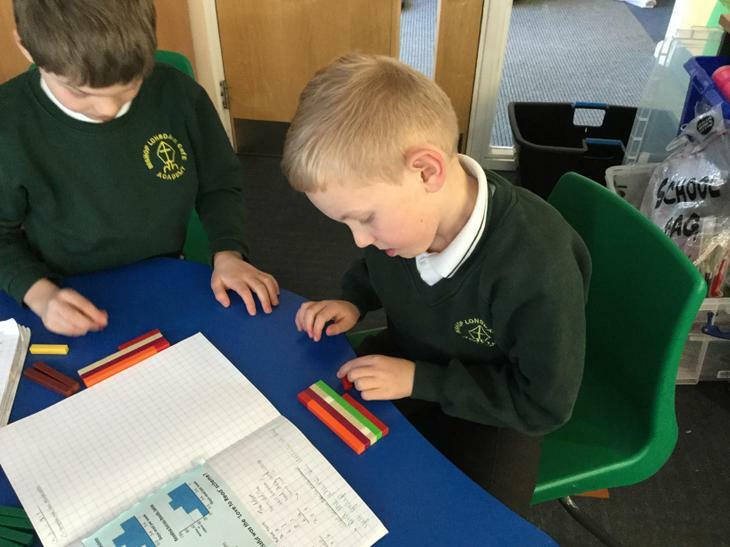 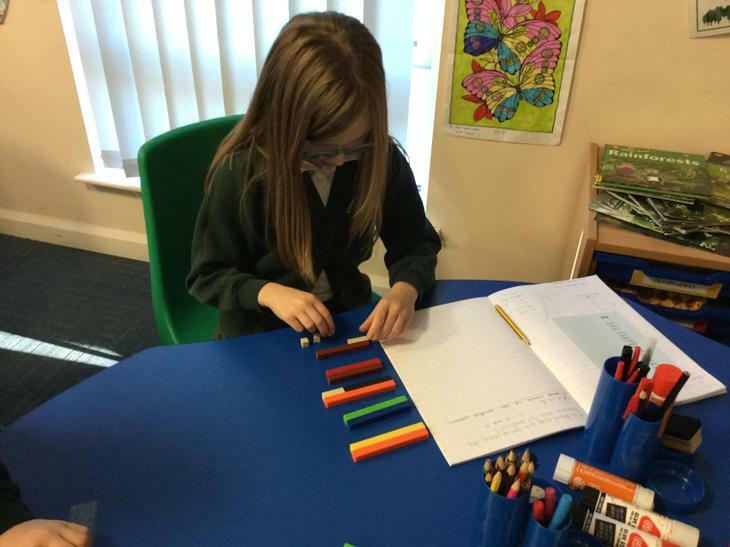 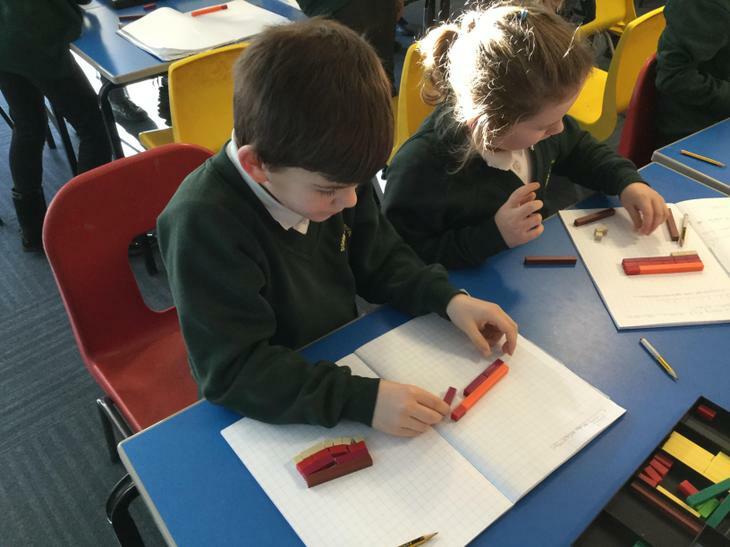 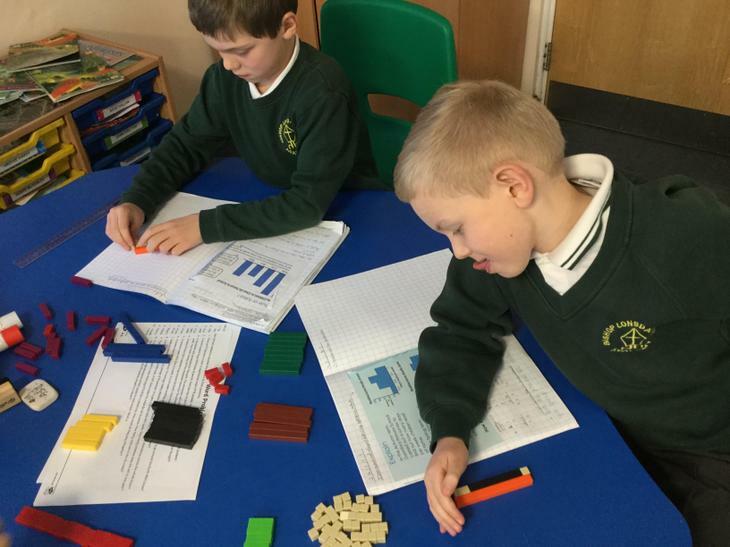 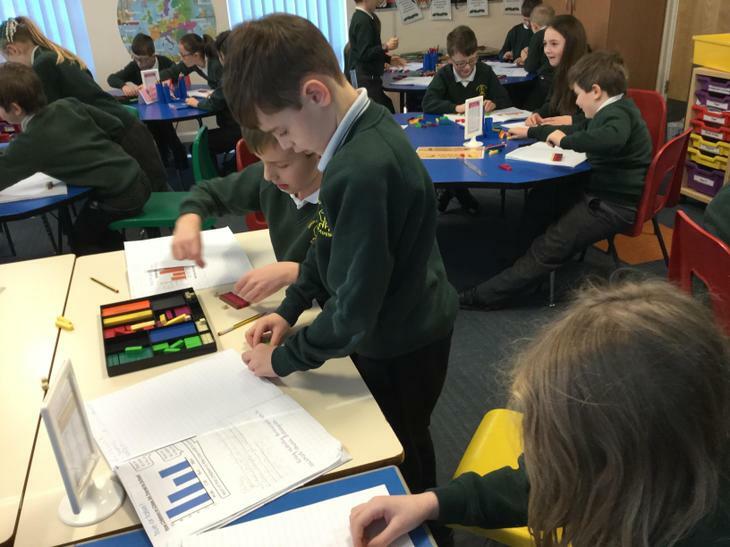 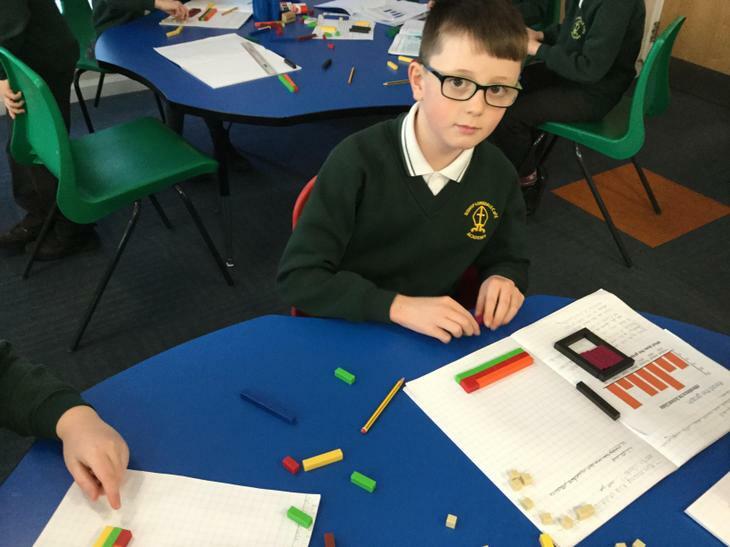 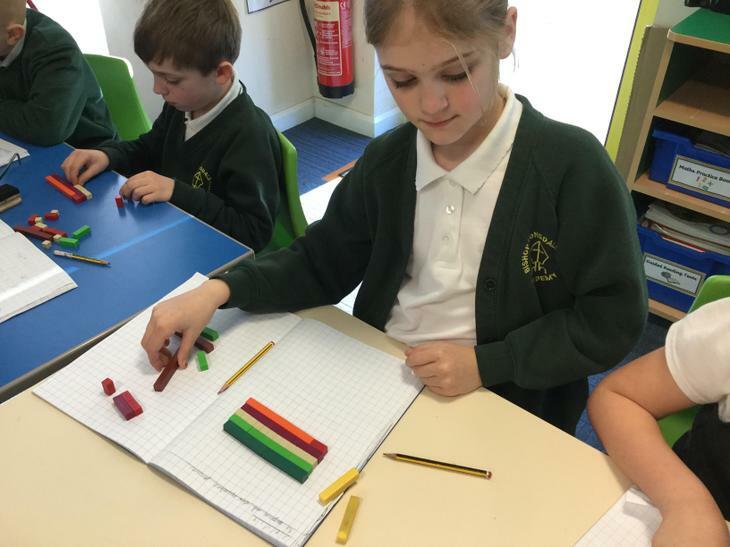 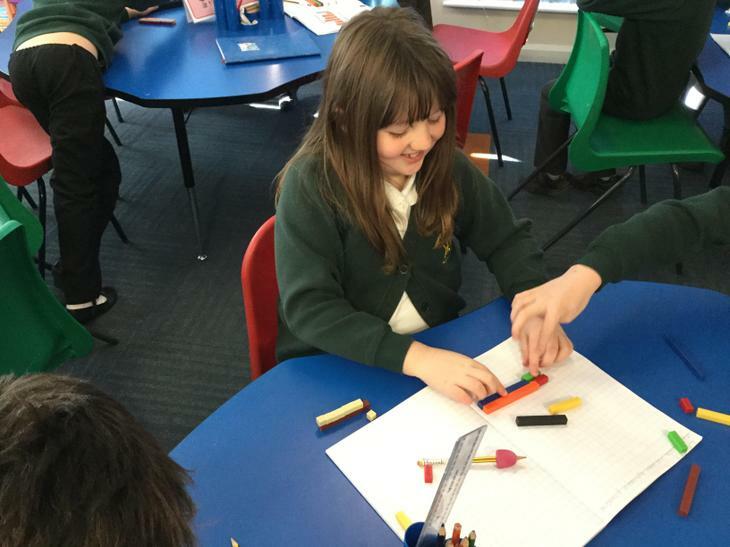 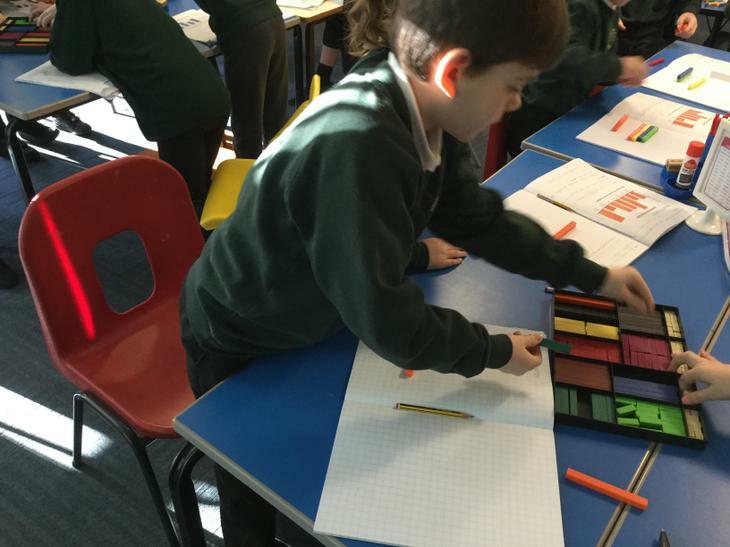 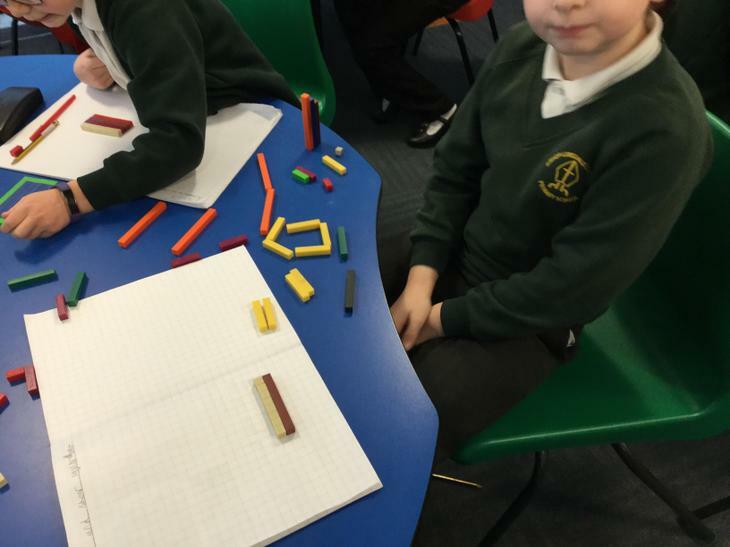 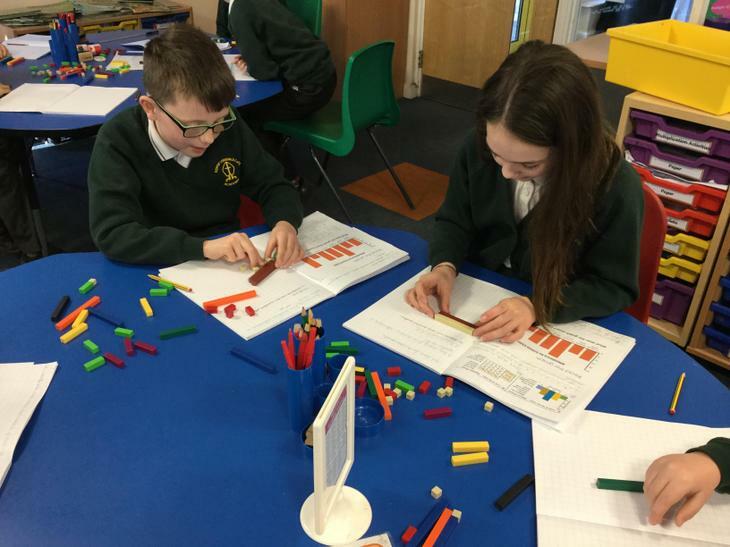 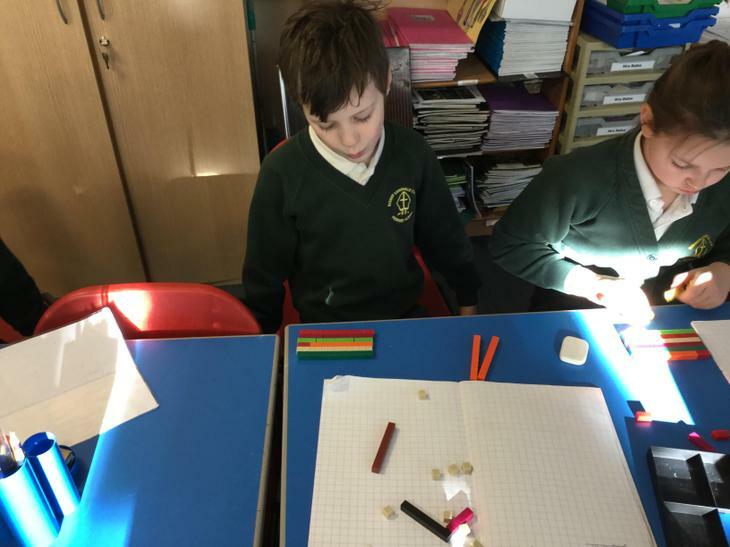 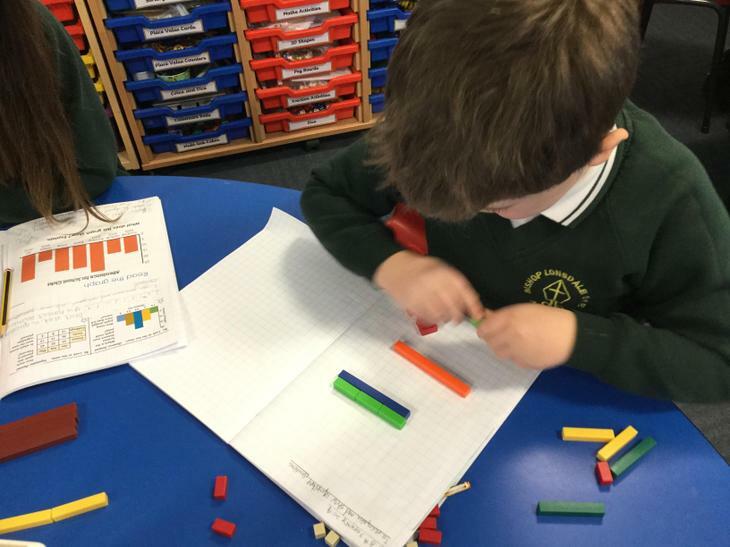 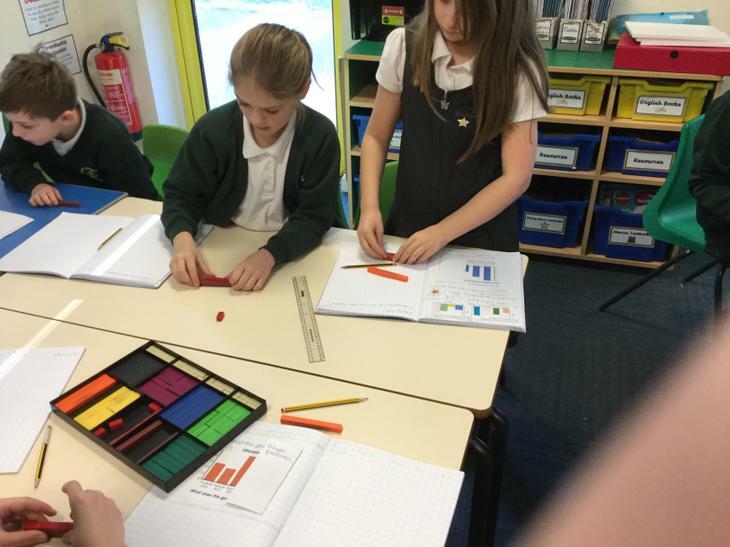 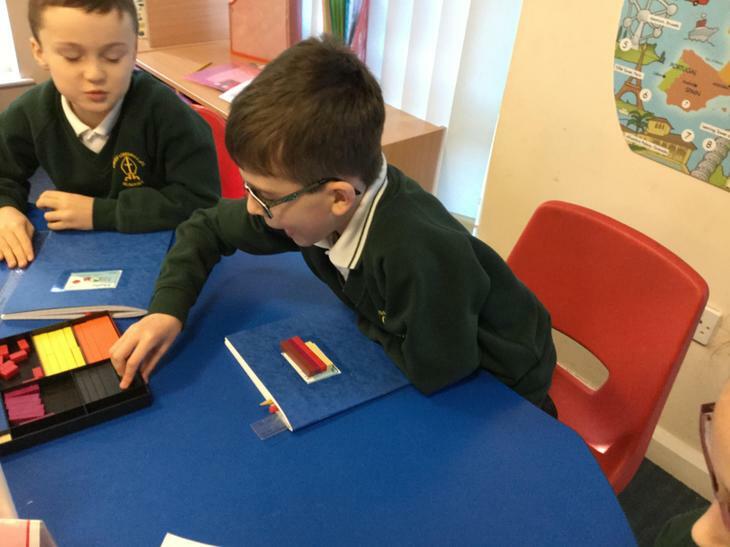 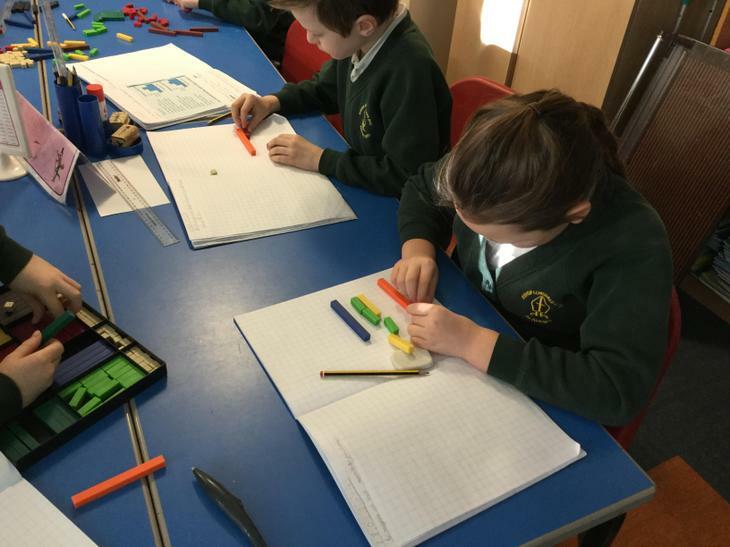 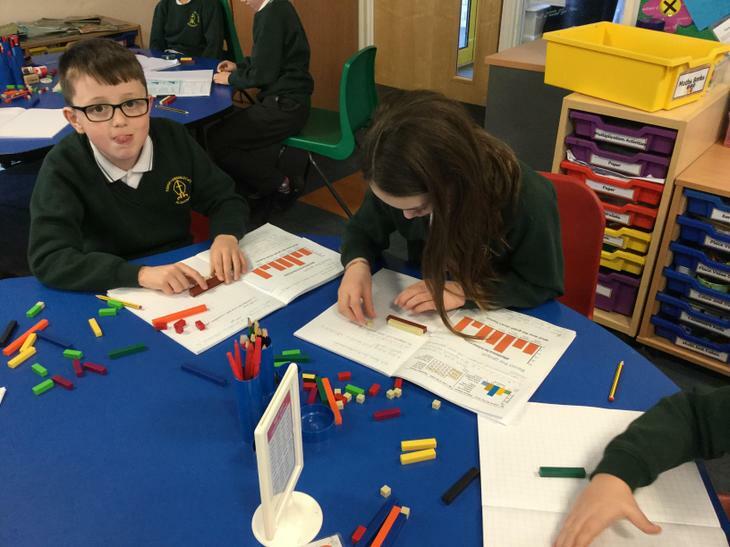 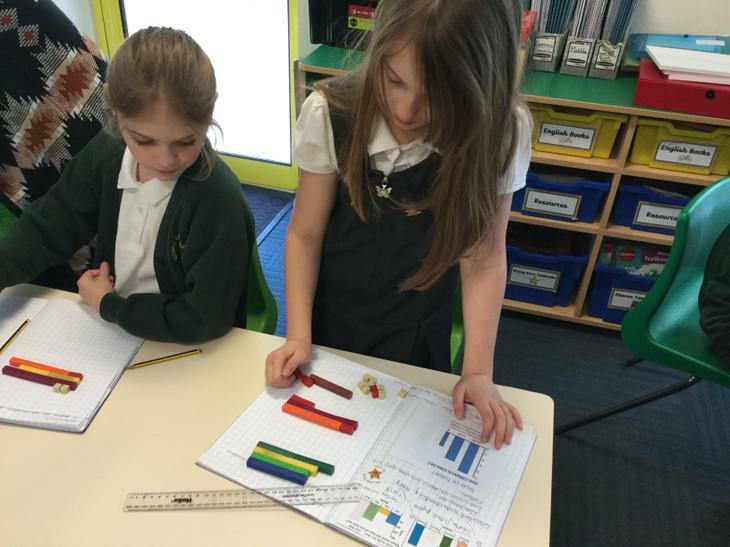 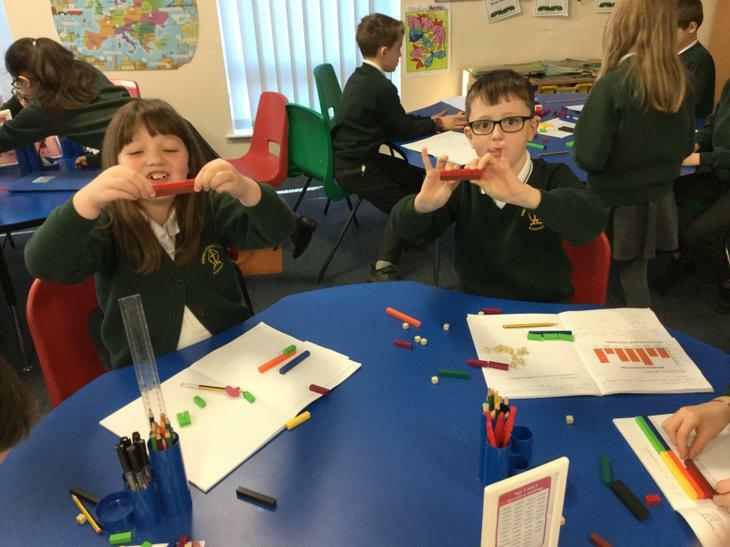 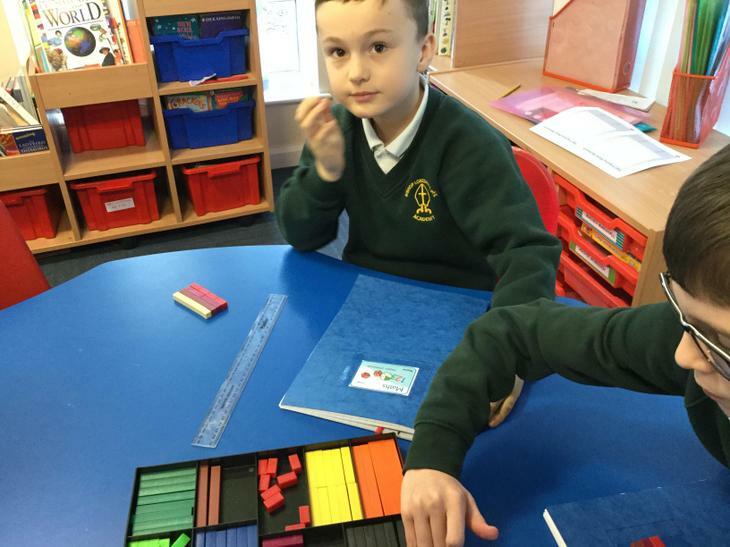 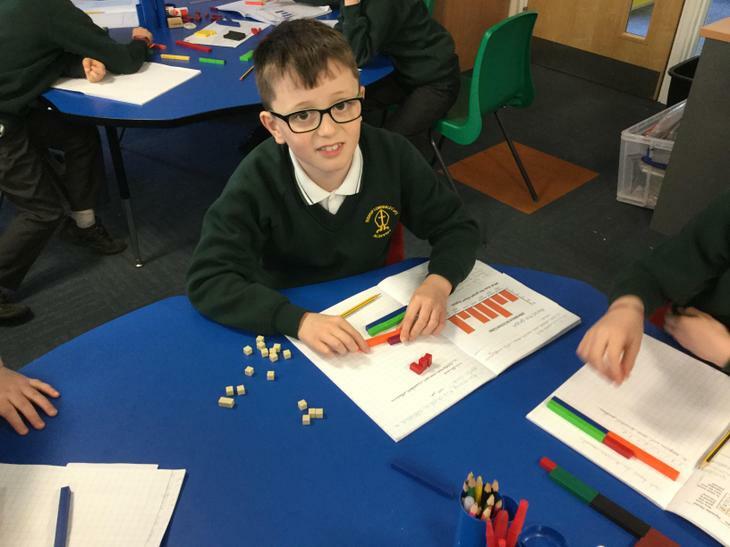 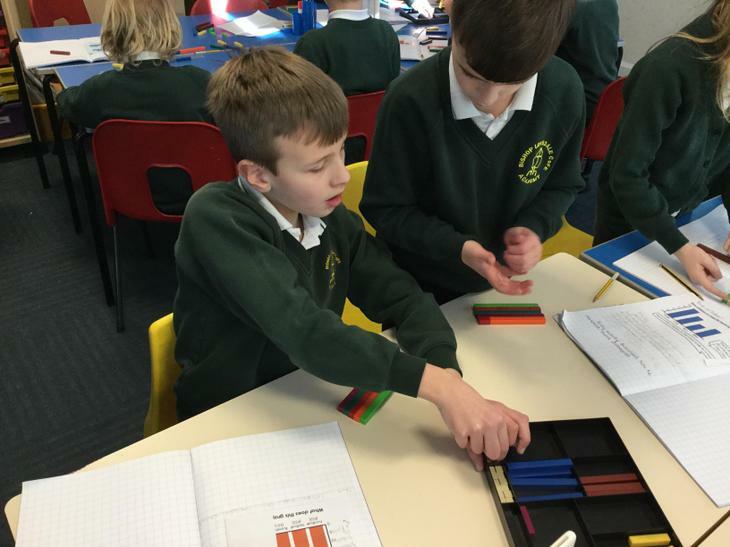 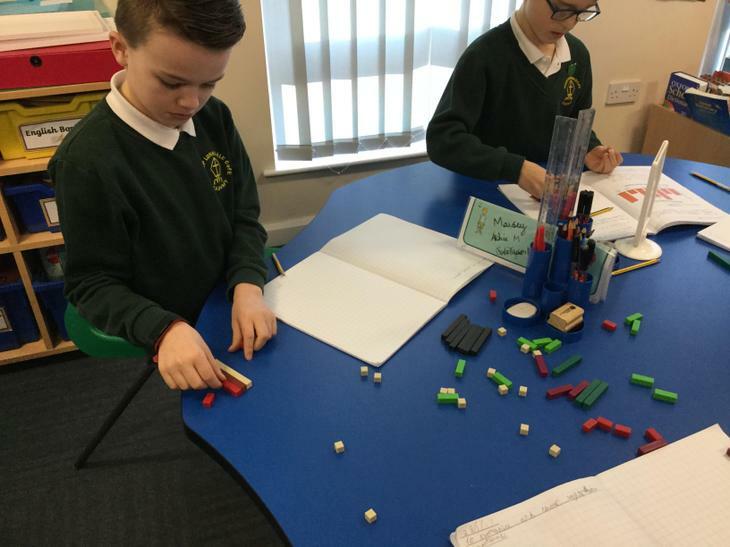 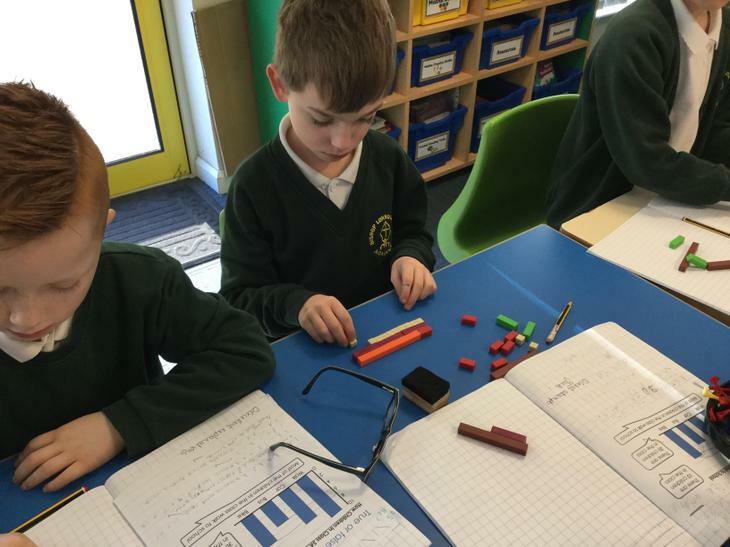 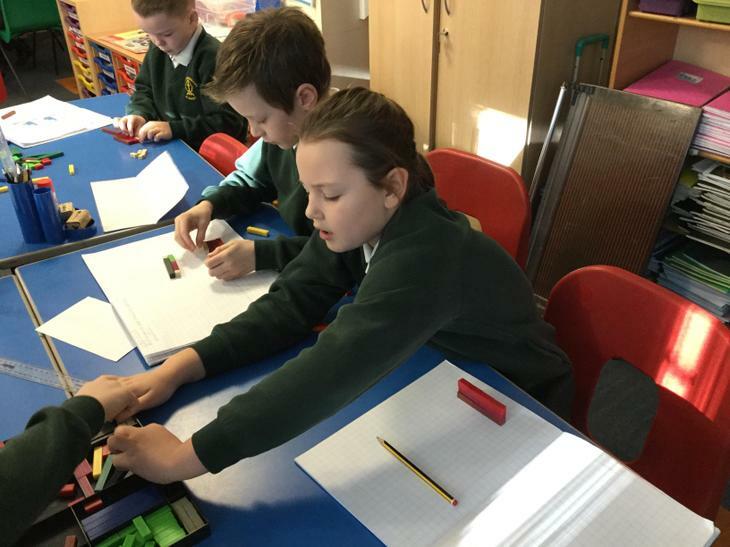 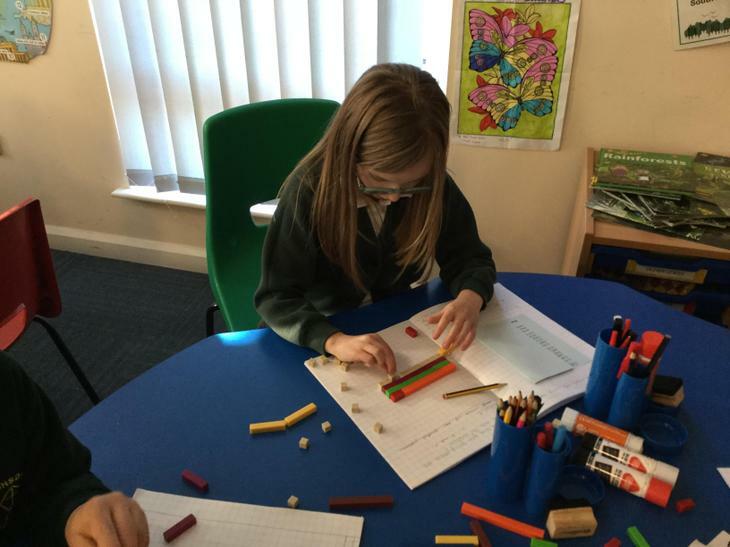 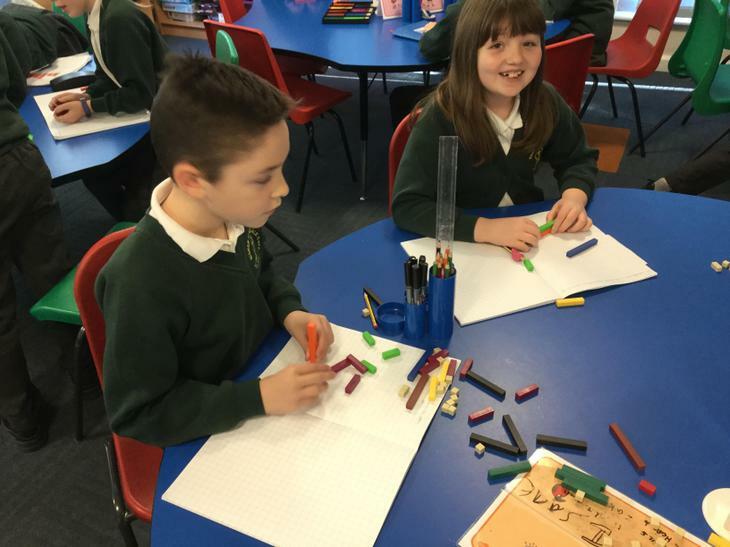 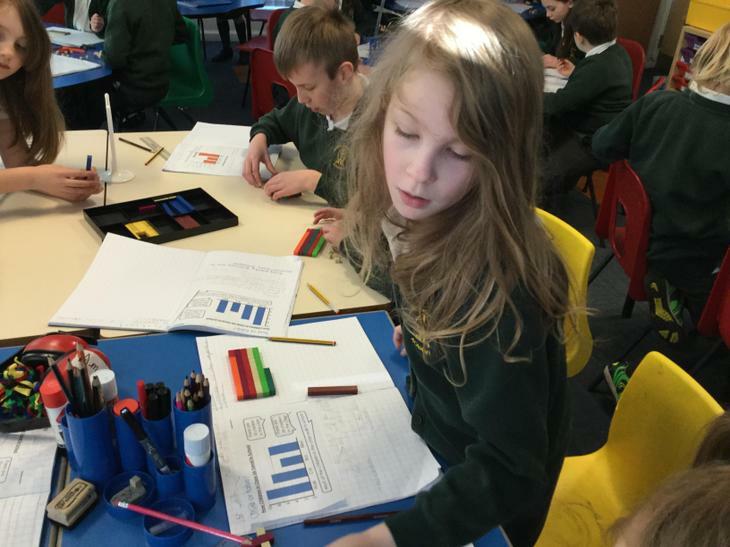 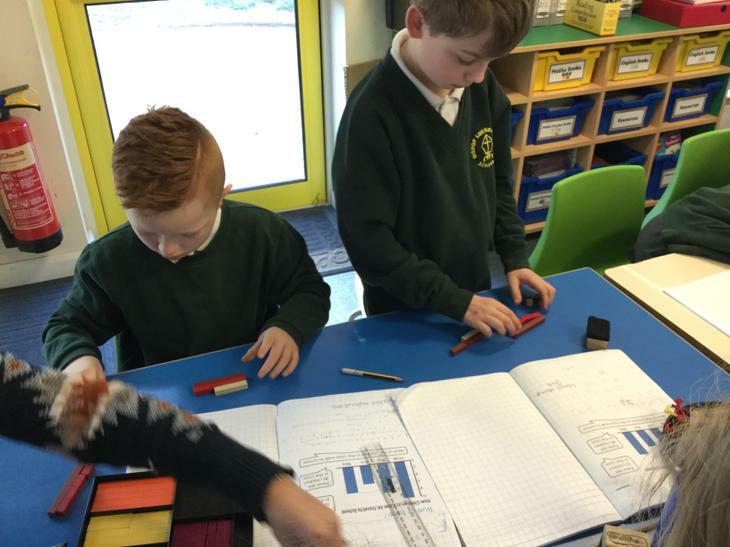 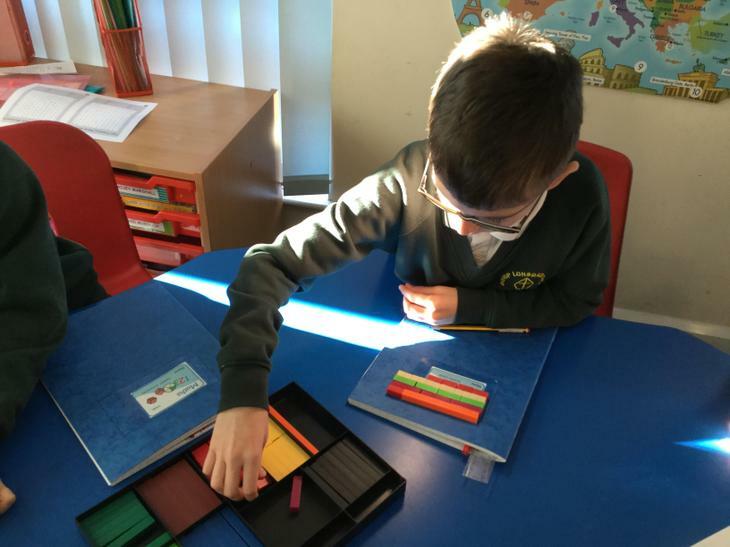 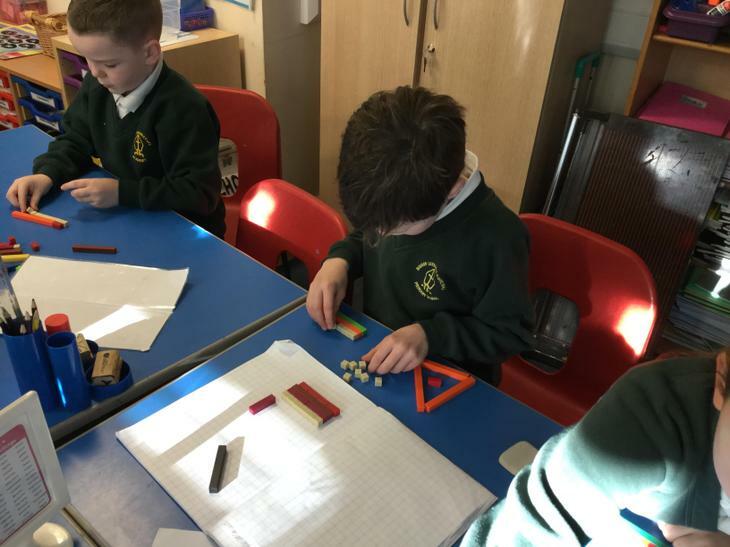 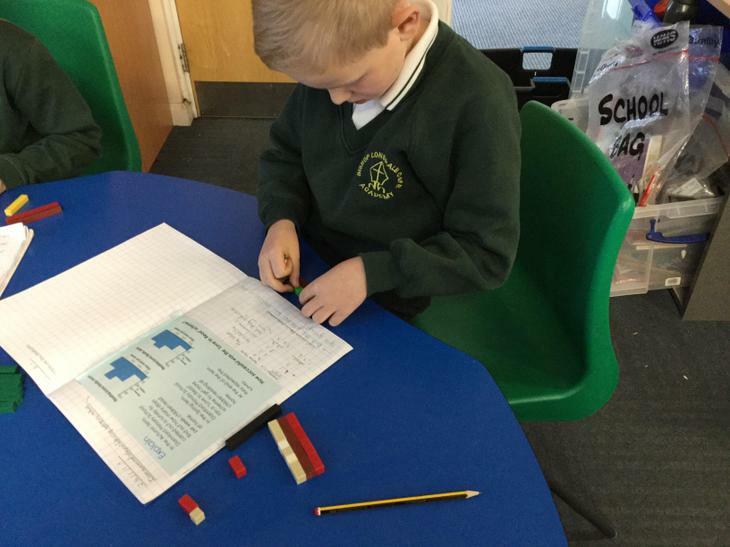 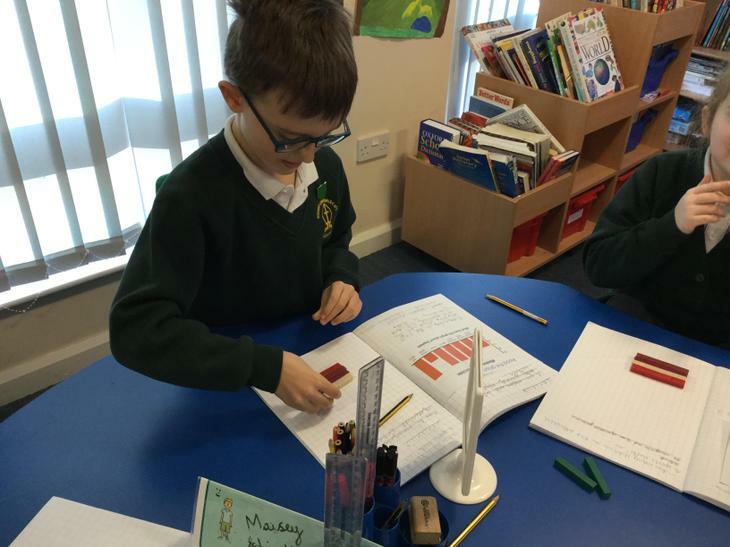 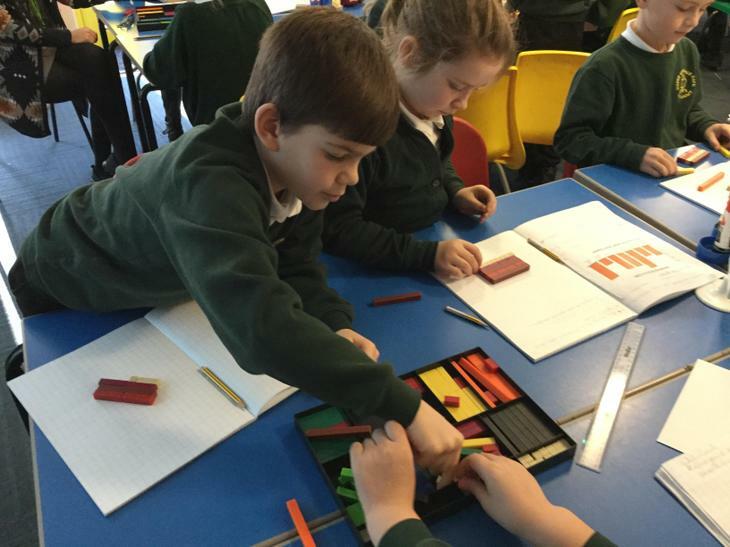 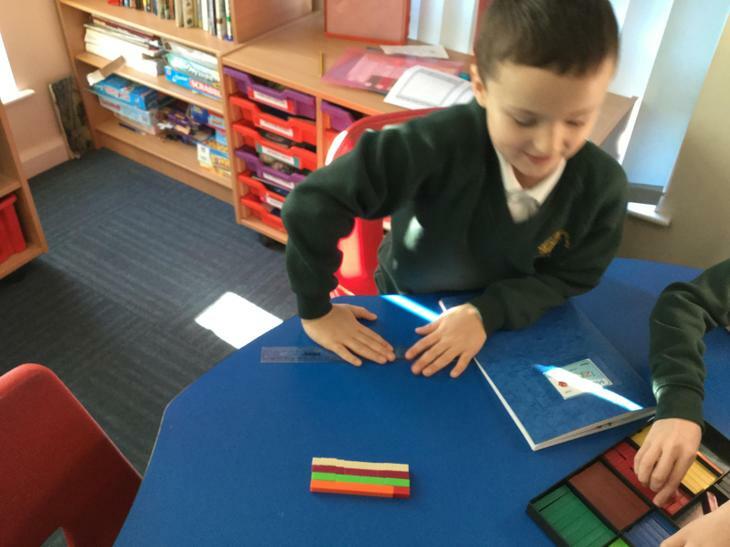 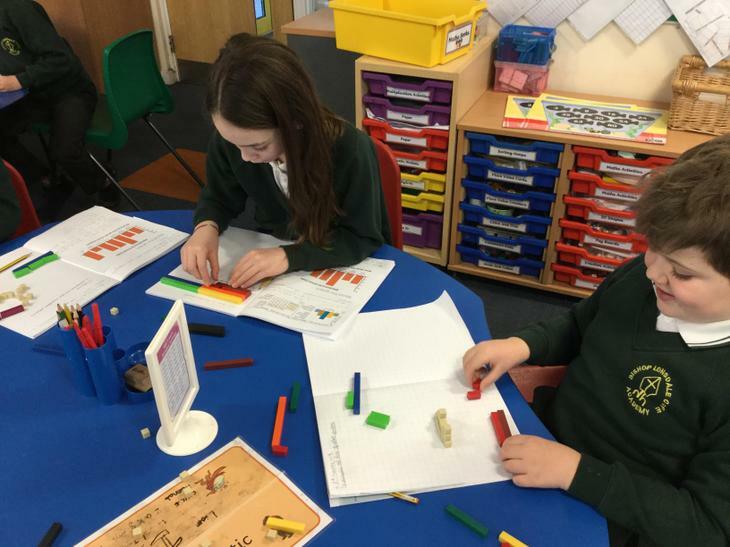 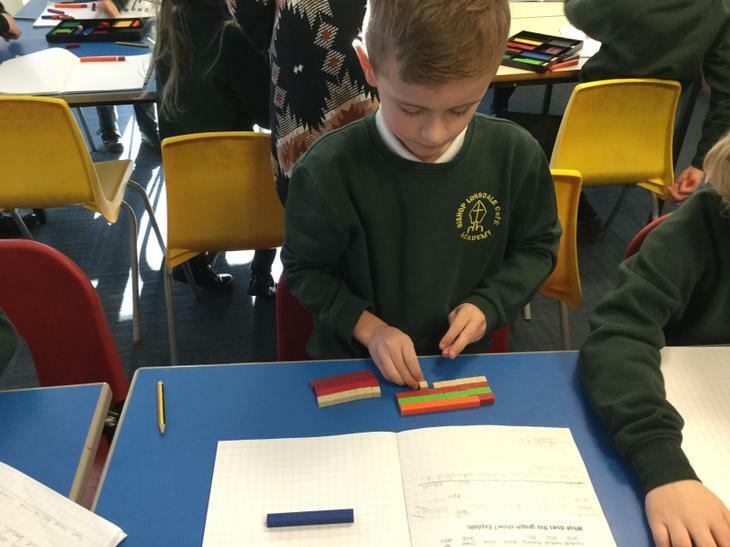 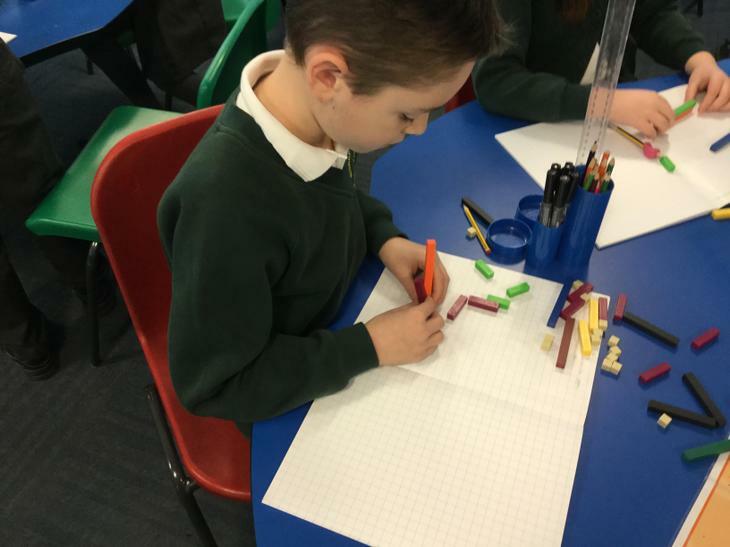 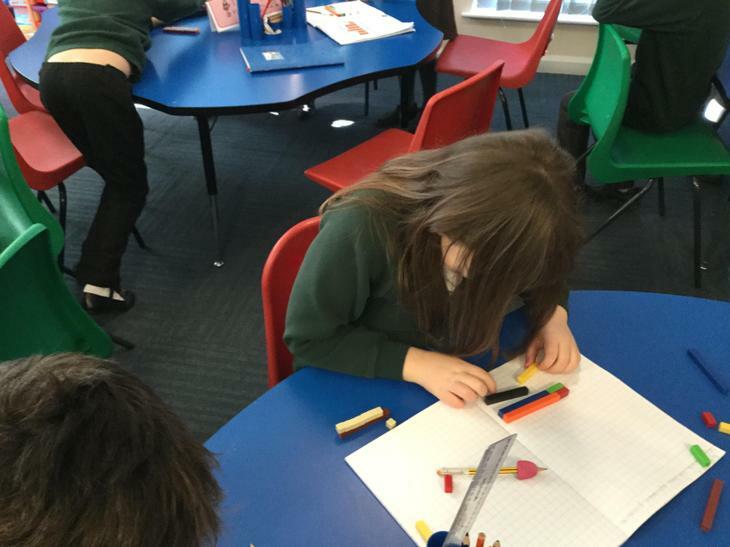 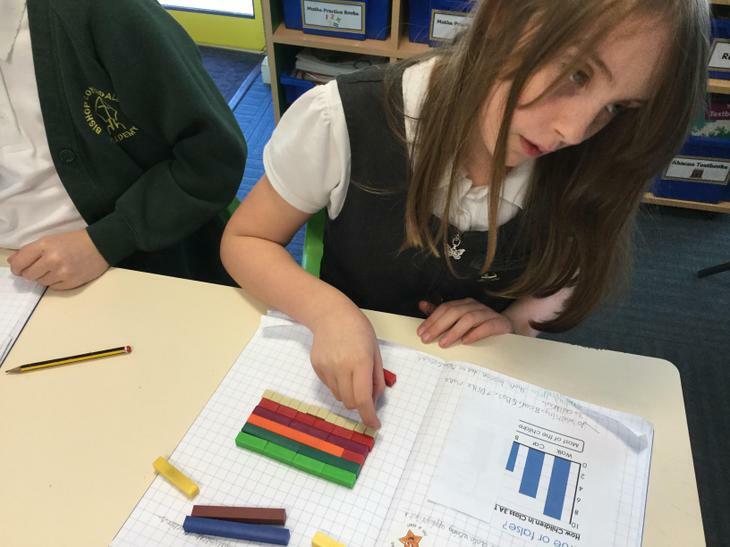 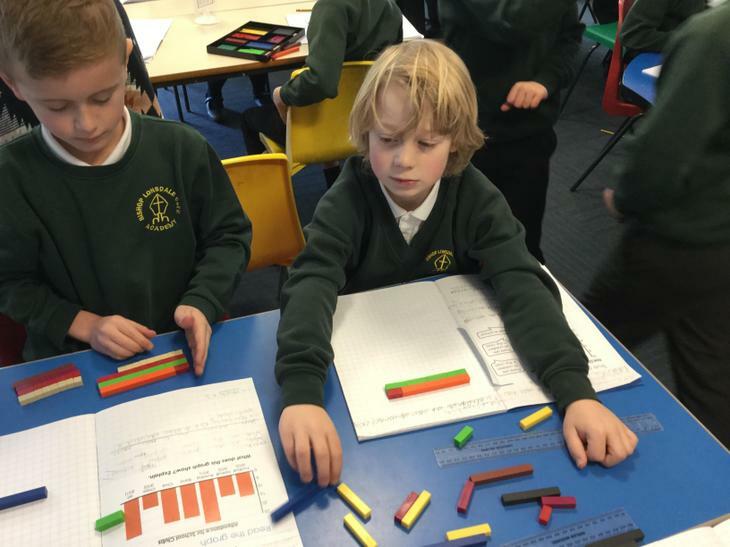 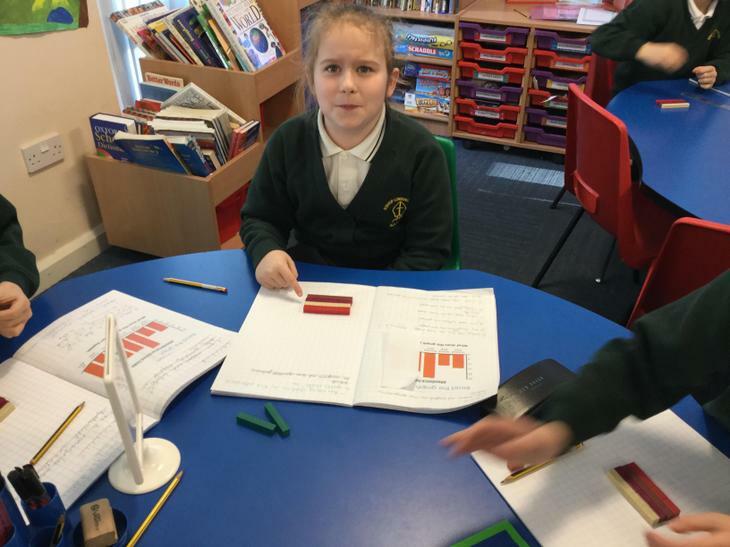 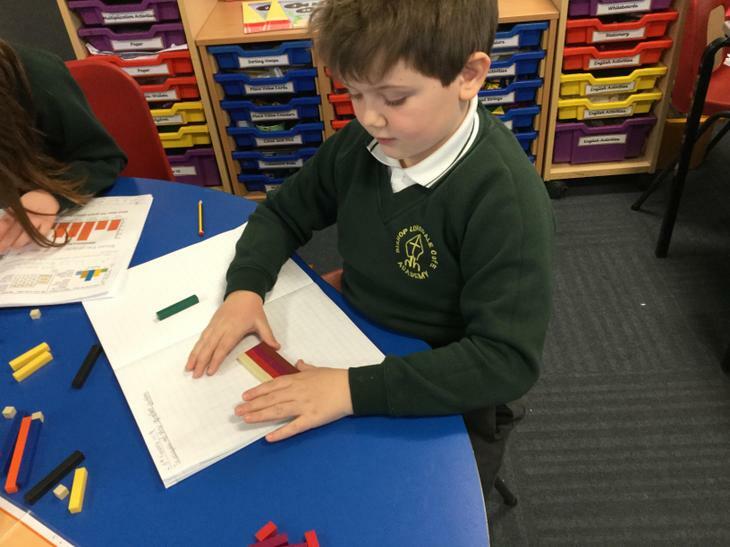 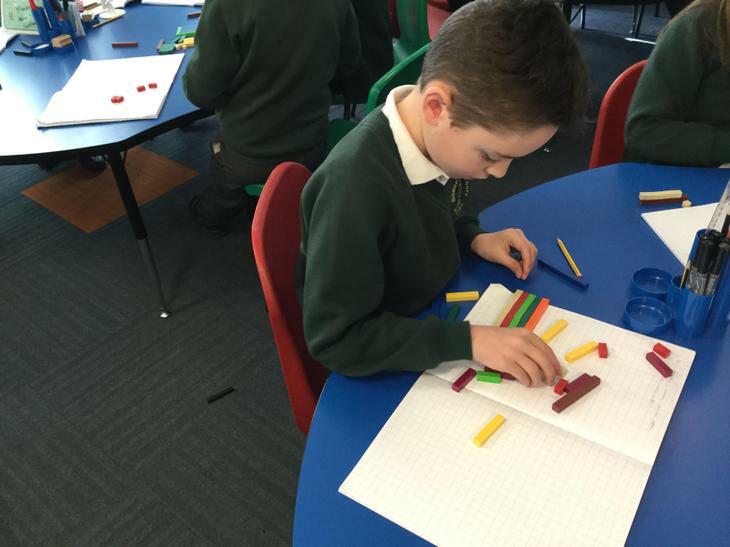 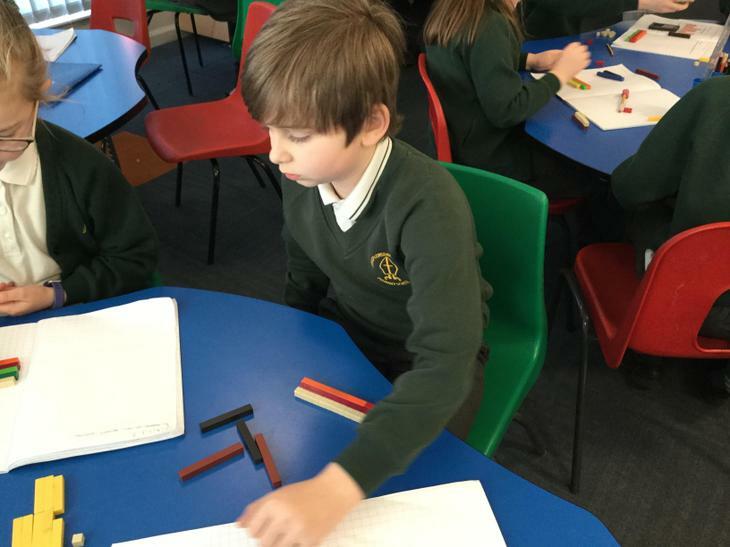 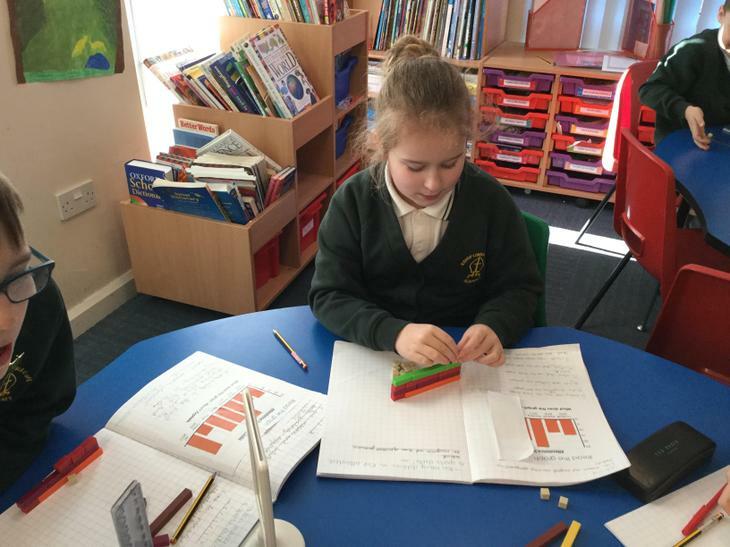 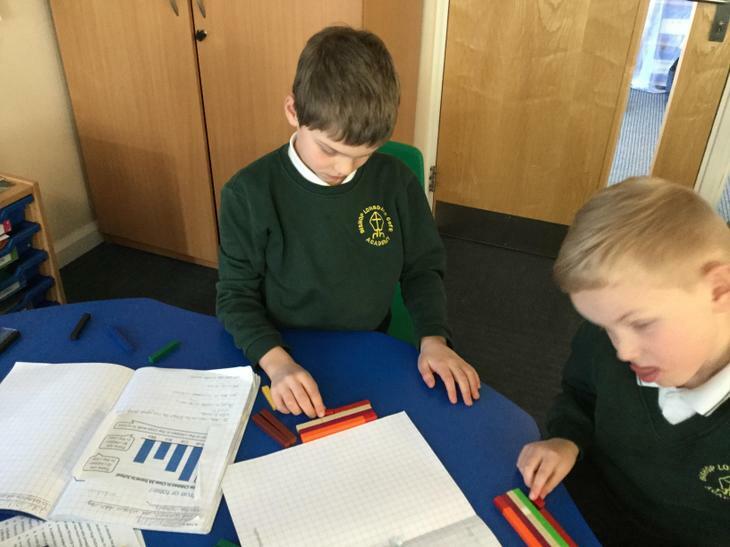 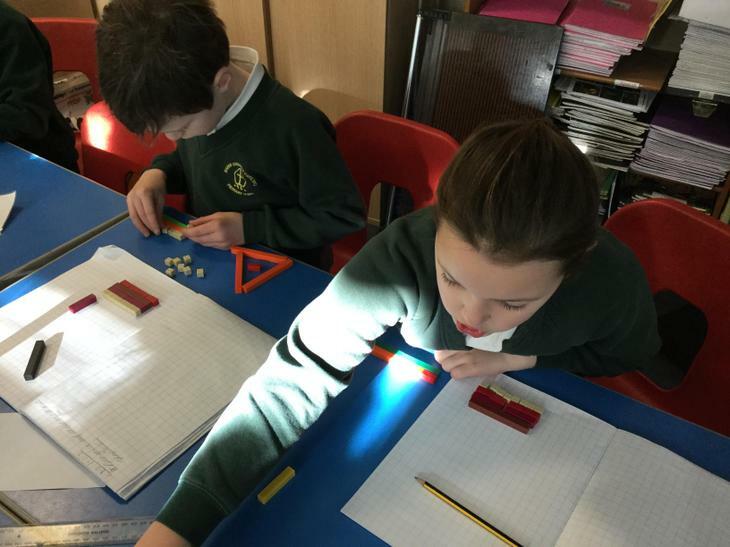 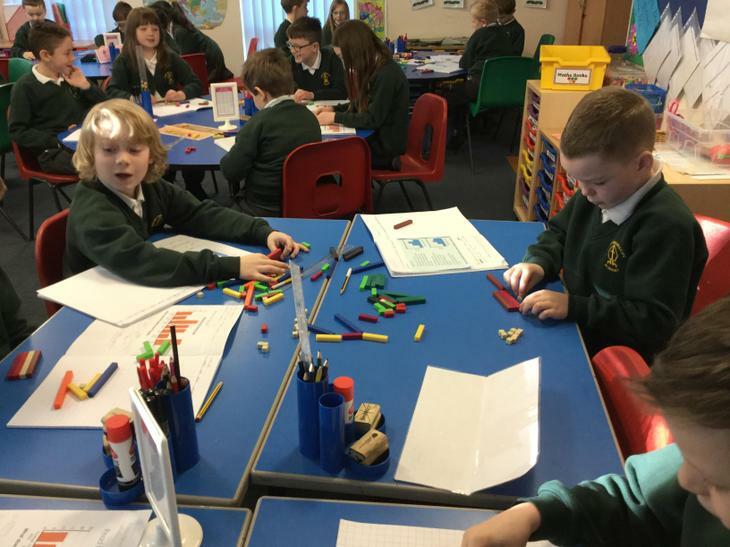 We use coloured bars to model and deepen our understanding of equivalent fractions.